Stone was born in Fayetteville AR and attended the University of Arkansas studying Architecture. His older brother, James Hicks Stone, an architect in Boston, invited him to Boston where he attended the Boston Architectural Club (now Boston Architectural College), Harvard University, and MIT, but never received a degree. Eventually, he would receive five honorary degrees. Between semesters at Harvard and MIT, Stone worked in the offices of Coolidge Shepley Bulfinch and Abbott, H. H. Richardson's successor firm. 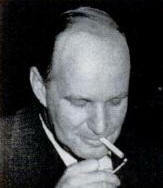 Henry R. Shepley, one of the firm's senior partners, mentored Stone and assisted him throughout his career. While at MIT, Stone won the prestigious Rotch Travelling Fellowship to Europe and North Africa for two years. In Europe he fell in love with Modernism. He was offered a job while in Stockholm at Schultze and Weaver and returned to New York City in October 1929, just before the Great Depression. He married Sarah Orlean Vandiver in 1931. They had two sons Edward Jr. and Robert. Stone designed the main lobby and grand ballroom of the Waldorf-Astoria Hotel in New York City. 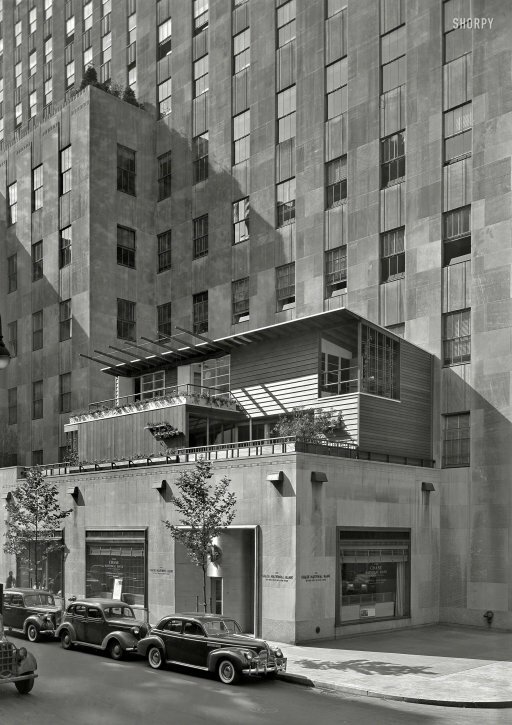 He then moved on to work in the offices of Reinhardt, Hoffmeister, Hood & Fouilhoux, who were among the architects associated on the Rockefeller Center project. 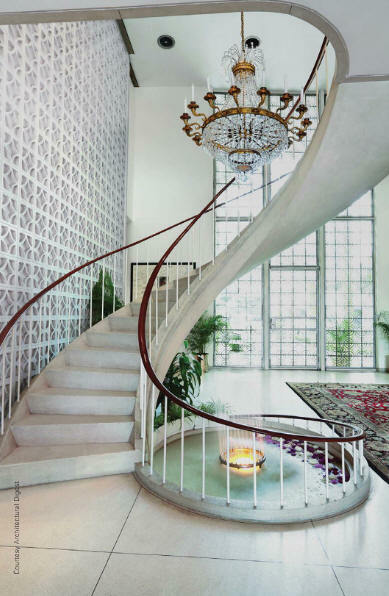 Stone was the principal designer on the Radio City Music Hall and the Roxy Theater (later called the Center Theater), and he worked in conjunction with interior designers Donald Deskey and Eugene Schoen. 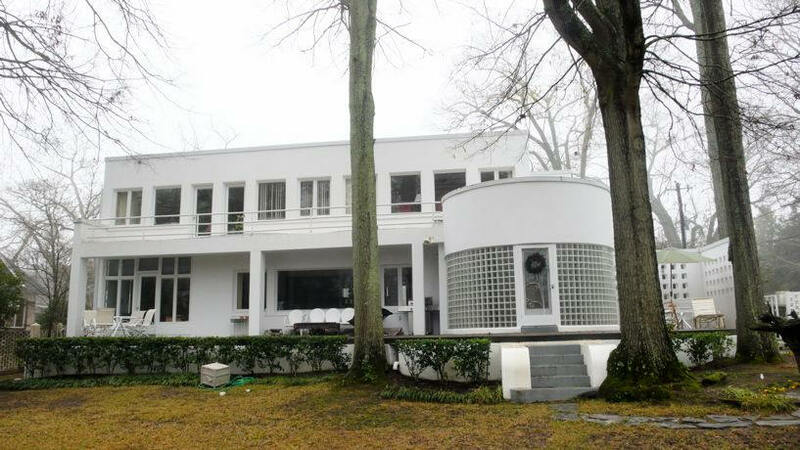 His relationship with Deskey ultimately led to his first independent commission, a startling, volumetric 1933 Modernist house for Richard Mandel. 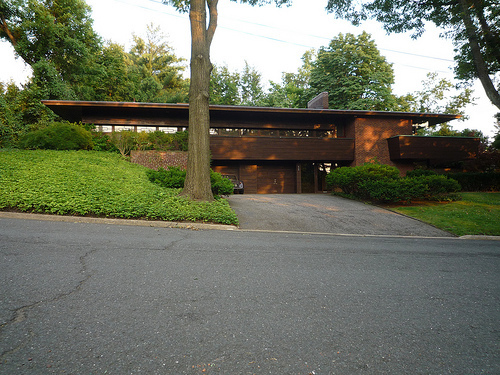 The acclaim for the Mandel House led to other prominent residential commissions. Similarly, his work on the Rockefeller Center project also brought him the attention of Wallace Harrison and Nelson Rockefeller. When the time came to choose an architect for the new Museum of Modern Art, Stone's name was put forth by Harrison and Rockefeller over the objections of Alfred Barr, Jr., the Museum's director. Stone was selected in association with Philip Goodwin, the only architect on the Museum board. It was at this point that Stone formally started his own architectural practice, opening an office in Rockefeller Center. Stone was in the Army during WWII from 1942 to 1945, stationed in Washington DC where he was the Chief of the Planning and Design Section. His principal responsibility was planning Army Air Force bases. Stone reopened his office in late 1945 in New York City and got mostly residential commissions. 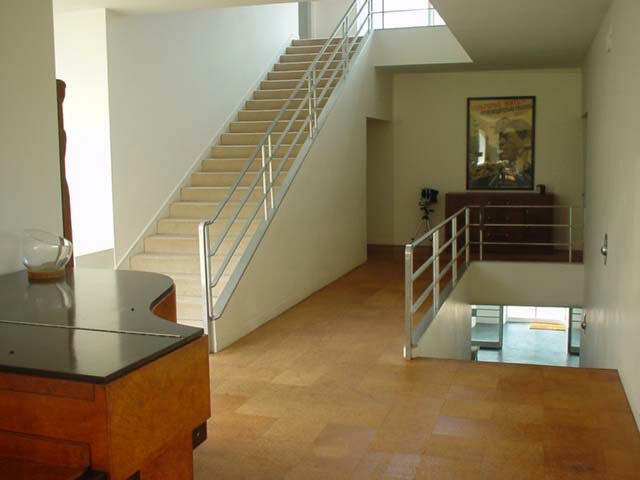 His success as a practitioner of Modernist architecture and his prominence as an academic connected him with Walter Gropius, Pietro Belluschi, George Howe, and William Wurster. Stone designed the US Pavilion at the Brussels World’s Fair. 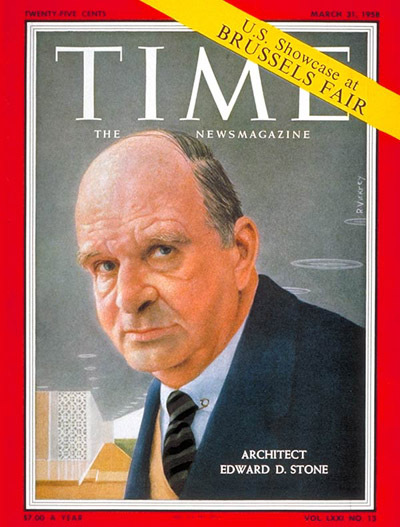 While it was under construction in 1958, Stone was featured on the cover of the March 31 Time Magazine. Through his relationship to Senator William Fulbright, he got the commission for the Kennedy Center in DC. For the next twenty years, Stone designed buildings intended to reflect what he considered more universal values rather than what he called the “transient enthusiasms” of Modernism. Stone attributed this shift to his second wife, Maria Elena Torchio, whom he met in 1953 and married in 1954. They had two children, Hicks and Maria, and in 1966 they had a very public divorce. 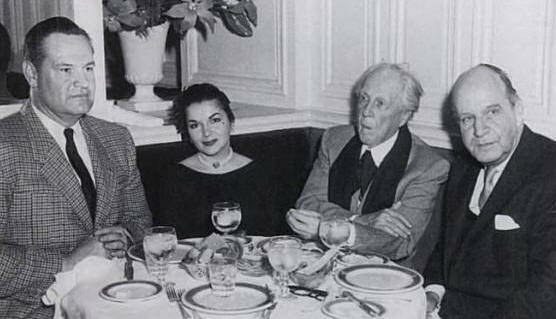 1950's - William Wesley Peters, Maria Stone, Frank Lloyd Wright, and Edward Durell Stone. Photo by Charles Rossi. Stone and NCSU School of Design DeanHenry Kamphoefner did not get along. 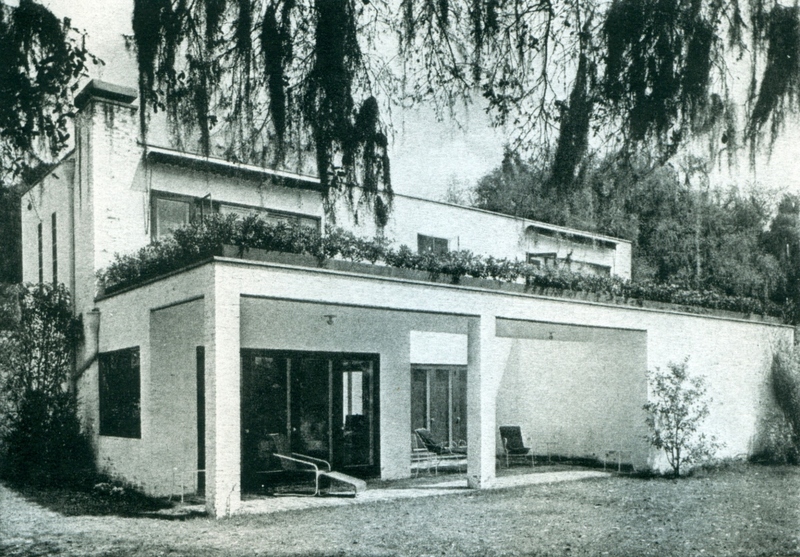 Kamphoefner was one of several critics in the architectural community who generally shunned Stone for veering away from the pure Modernist aesthetic towards more decoration. Kamphoefner scholar David Brook wrote in his dissertation, "According to a widely circulated story—often told by Kamphoefner himself—he and Stone ... had a run-in at an apartment party in New York City, hosted by Henry Haskell, editor of Architectural Record. Protagonist Stone was five years older than Kamphoefner and a native of Arkansas. He was described by interviewers as a “big, informal, handsome man who was soft of speech and had a habitual expression of kindness.” Yet, that evening in the 1950's all his gentle traits went out the window. Sweeping into the party with a lady friend, Stone surveyed the crowd, spotted Henry Kamphoefner, and declared in a stentorian voice, “Well, what do you know, Henry Kamphoefner is here. You know, there are three things in this world that are overrated: architecture, f**king, and Henry Kamphoefner!” There was dead silence; then Haskell turned to Kamphoefner and dryly said, “Well, Henry, you’re in pretty good company.” With that witty counterpoint everyone burst out laughing." However, Stone had the last laugh. Sometime afterwards, Stone met Tom White, Chair of both the NC Advisory Budget Commission and the NC Legislative Building Commission. The relationship led to a commission for the huge NC Legislative Building in downtown Raleigh and ten years later to the new NC Museum of Art on Blue Ridge Road. Both projects were in collaboration with Raleigh firmHolloway and Reeves. 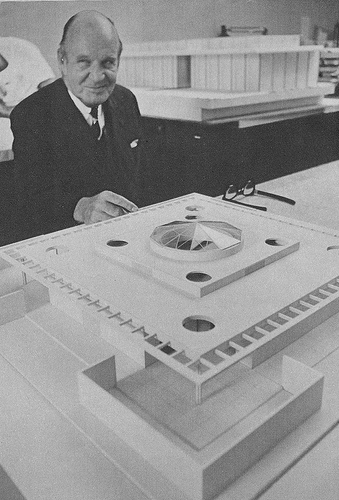 His office was extremely successful and he won major architectural commission such as the Kennedy Center in Washington DC into the early 1970s. The public liked most of his buildings. He won five Honor Awards from the national AIA. Business Week called him "the man with a billion on the drawing board." He married his third wife, personal assistant Violet Moffat in 1972, had a daughter Fiona, and retired from active practice in 1974. His papers are at the University of Arkansas. 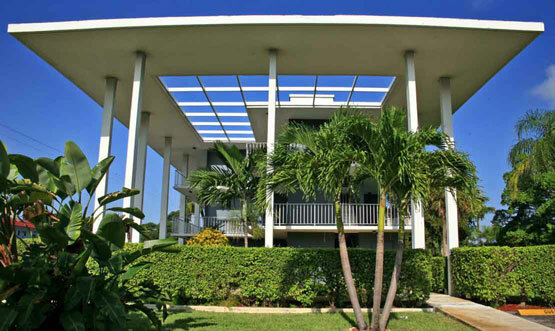 Edward Durell Stone & Associates continued to exist in various forms until 1993. His son Hicks Stone published a book on his father in 2011. Many thanks to Hicks Stone and Catherine Westergaard Cramer for their extensive research. 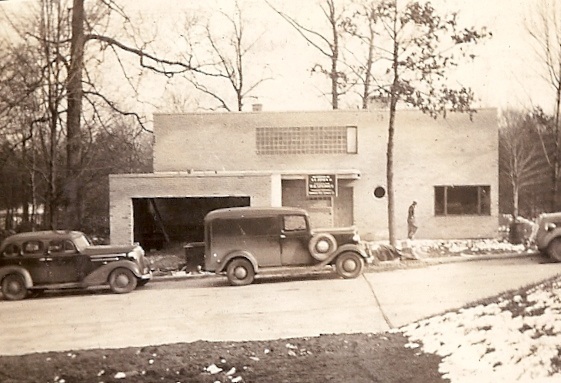 The Murphy Brinkworth Construction Corporation was the builder for several of Stone's houses. See their project list here. Stone appeared on the TV show "What's My Line" in August 1958. Bio adapted from www.edwarddurellstone.org and Wikipedia. 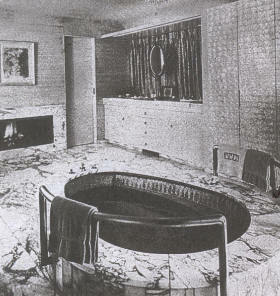 1932 - The Bathroom for Abby Aldrich Rockefeller, 810 Fifth Avenue, New York NY. Designed by Wallace K. Harrison with Stone assisting. 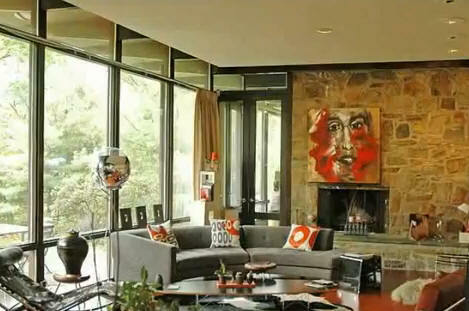 Interiors by Donald Deskey. 1935 - The Rockefeller Apartments, 24 West 55th Street, next to the Museum of Modern Art, New York NY. Designed by Wallace K. Harrison with Stone assisting. 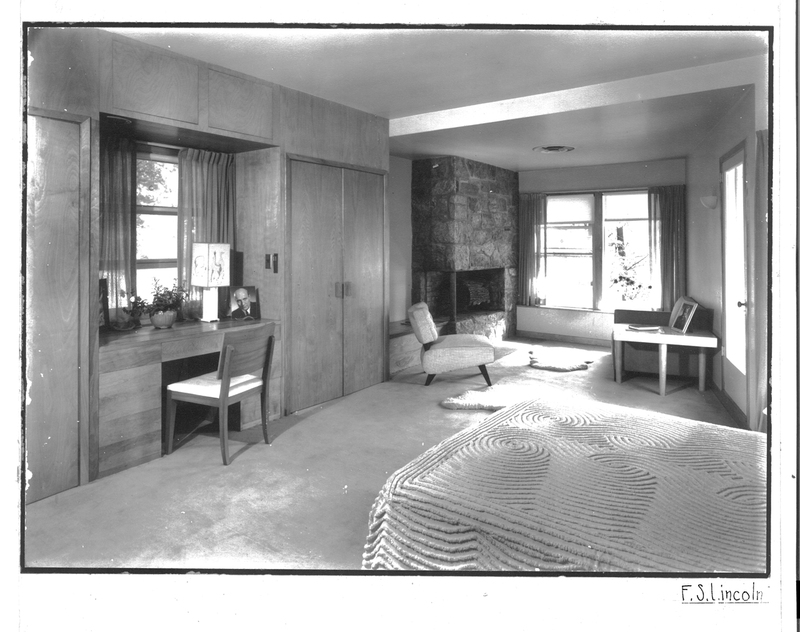 Bottom photo of the Garmey Apartment by Fred Conrad. 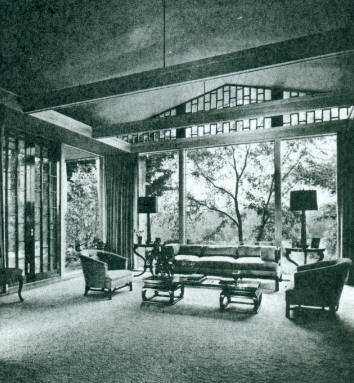 1934 - The Richard M. Mandel Residence, 323 Haines Road, Westchester County, Bedford Hills NY. 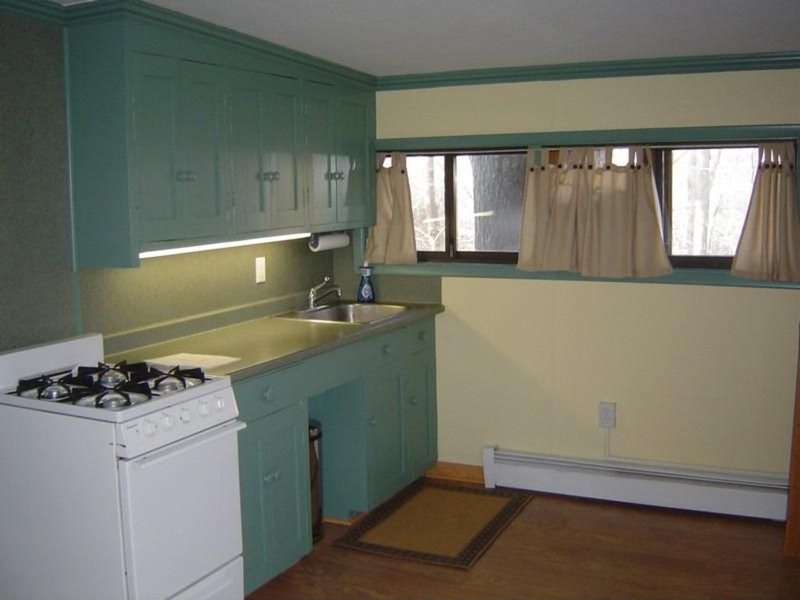 Many project lists place it at Mount Kisco NY which is nearby. 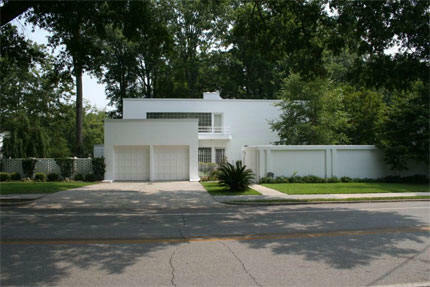 Commissioned in 1933, it is often cited as the first International Style house on the East Coast. 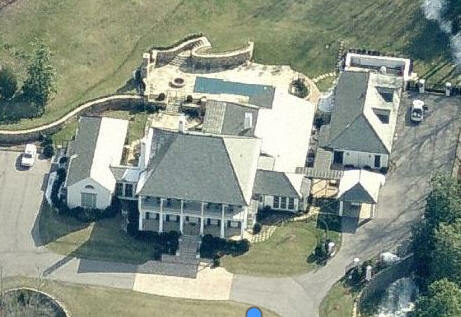 10,000 square feet with 32 rooms, 7 bedrooms and 4.5 baths. 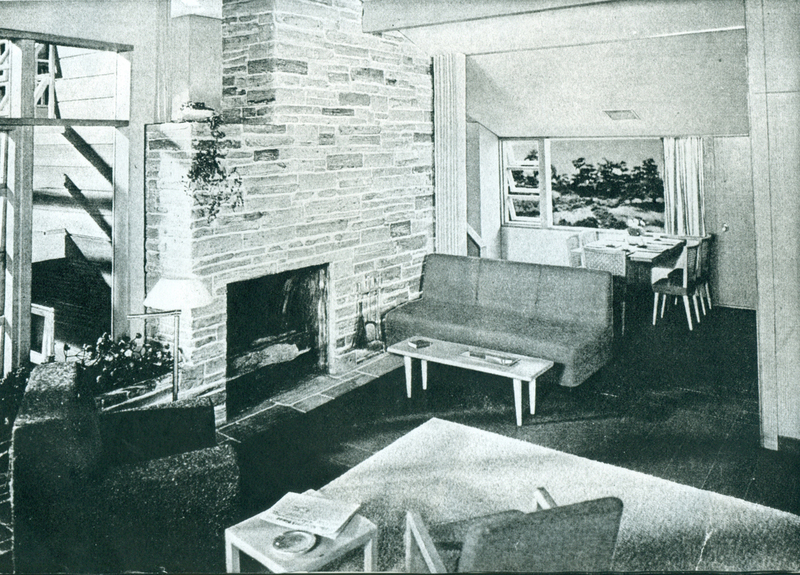 Interiors by Donald Deskey. Designed with Thomas Williams of New York City. Sold in 1991 to Eric and Ana Brill. Added to the National Register of Historic Places in 1996. Sold in 2006 to William Sofield. 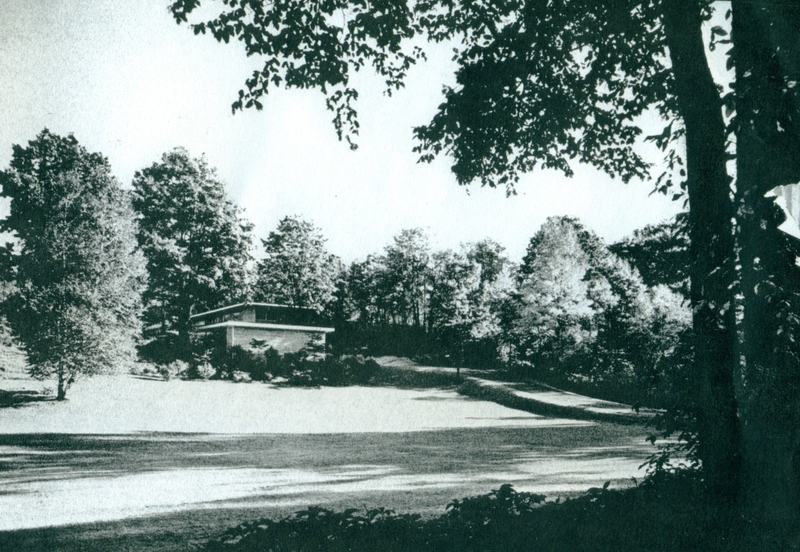 1934 - The Ulrich Kowalski Residence, aka Early Dawn, aka the Fris House, 121 Old Roaring Brook Road, Mount Kisco NY. 3.24 acres. 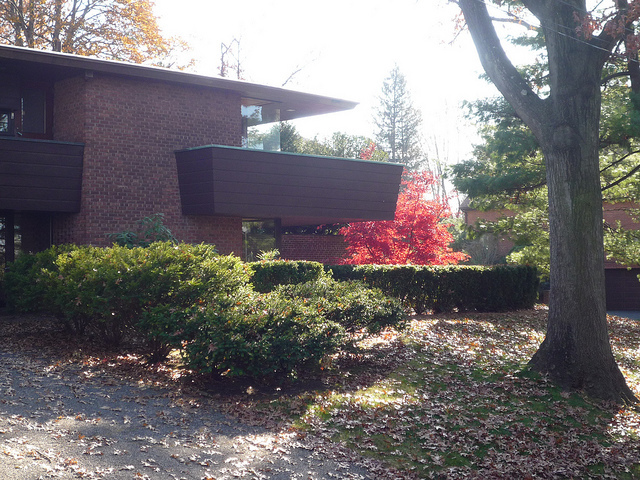 This was Stone's second International Style house in the Mount Kisco area. By then the community had enough of Modernism. 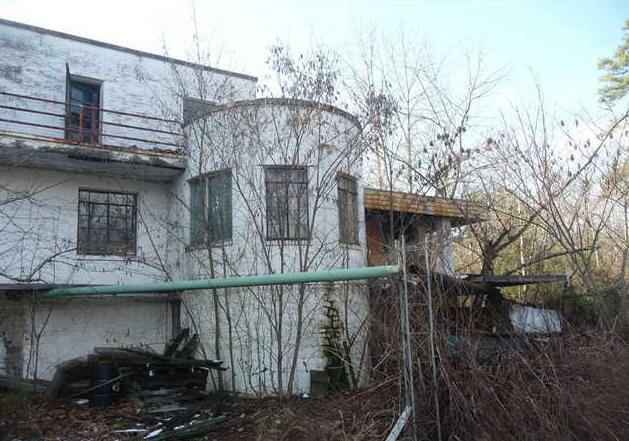 They changed the local building codes to prevent further Modernist houses. At some point the house was sold to the Fris family. The pool and adjacent gynasium was a major addition; not sure if designed by Stone. BW photos byBill Maris/ESTO. 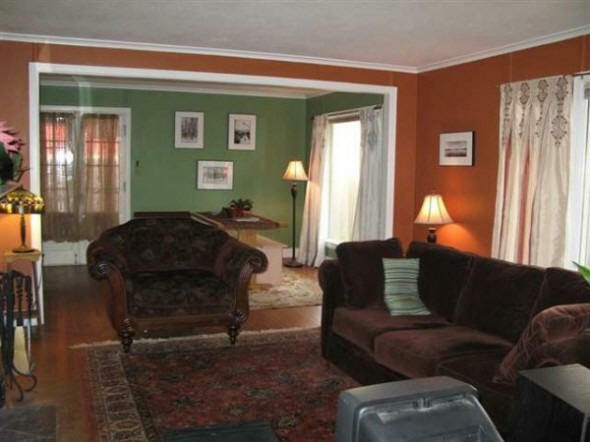 Sold in 2007 to Richard and Laura Zandi. 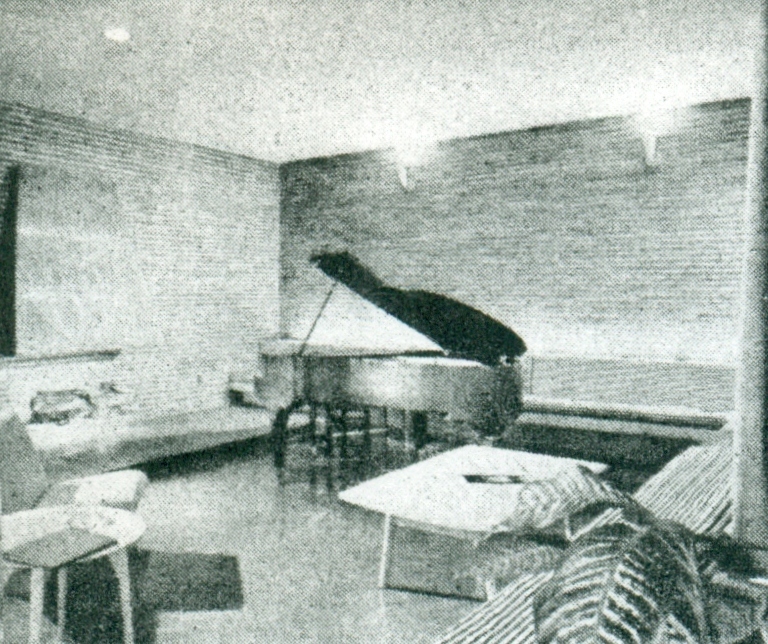 1936 - The A. J. Cole House, Greenwich CT. Designed with William H. Jackson, who probably did most of the work. Unsure if built. 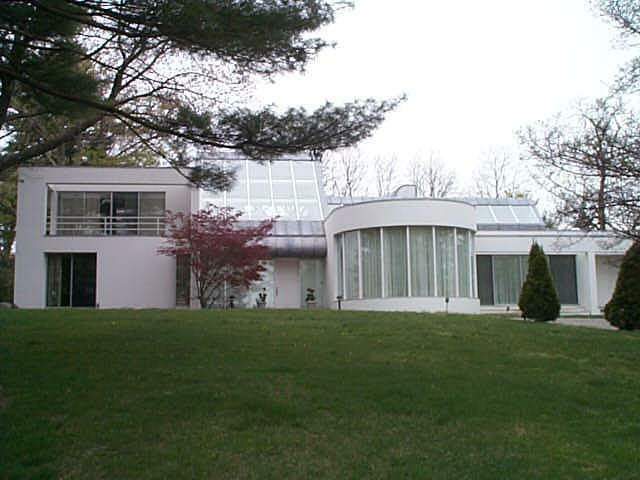 1936 - The Williams Raisch Residence, Stamford CT. 2-story International Style with curved ends, various schemes. Unsure if built. 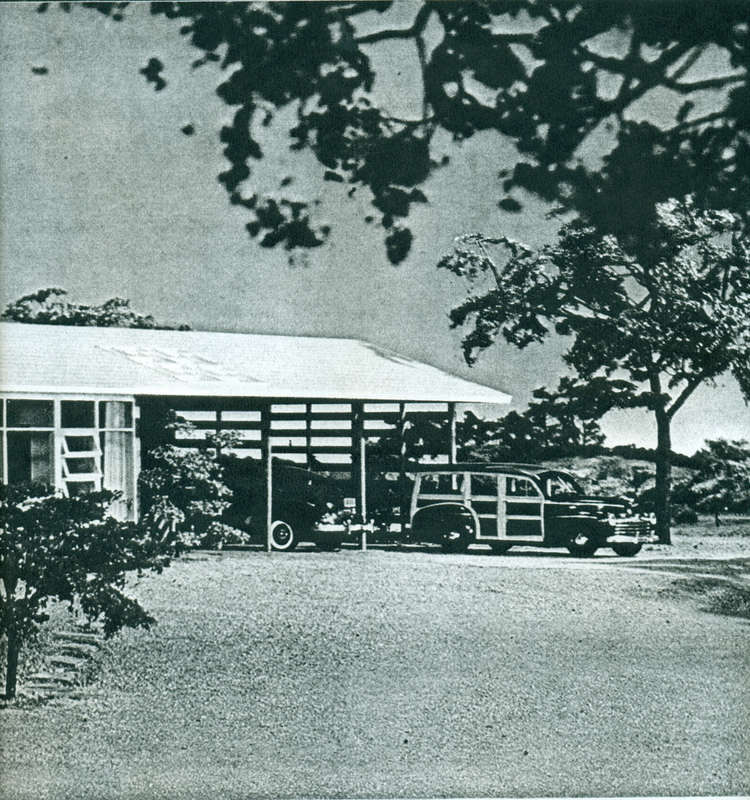 Raisch also had Stone design two weekend houses in 1938, house A in Stamford and house B in Nassau, Bahamas. Unsure if any of these homes were ever built. 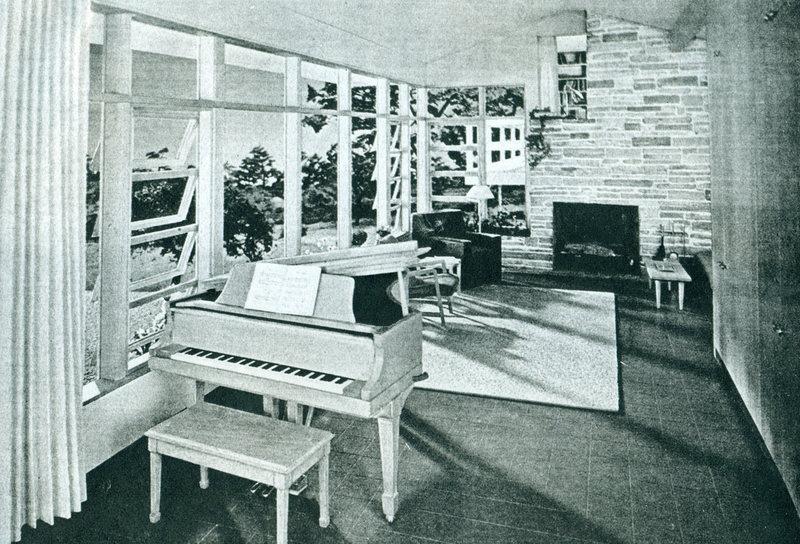 1936 - The Colliers Magazine House, aka the Colliers Model Home, published March 1936. Part of a series of six articles. The model was very popular and was built in several variations, as shown below, over the next decade. 1936 - The E. T. and Tom Miller House, approximately8553 6th Street, Downey CA. Based on the Colliers Magazine House. 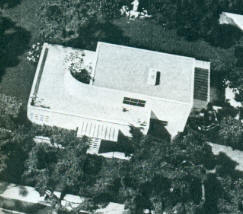 1936 - The Warren R. Wynn Residence, Miami Beach FL. Unbuilt. 1936 - Unidentified Townhouse, location unknown. 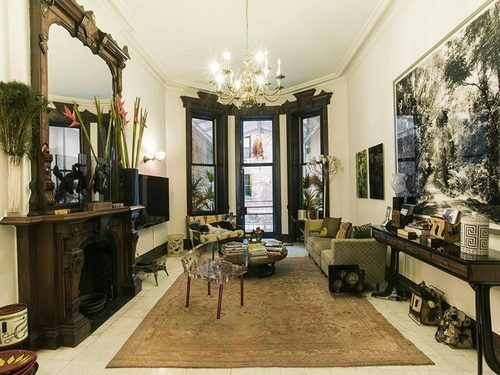 Six stories; usual NYC brownstone type with garage, 3 maids rooms, sitting room, projection room, butler, caretaker. Unsure if built. 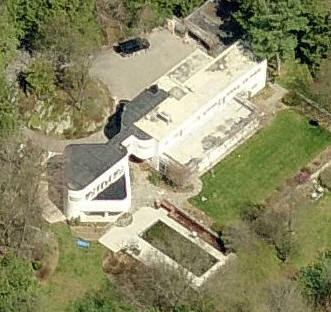 1936 - The Wayne V. Brown Residence, 614 Hollow Tree Ridge Road, Darien CT. Designed with Richard Boring Snow. Renovated in 2008. Sold in 2015 to Matthew and Melanie Dumas. 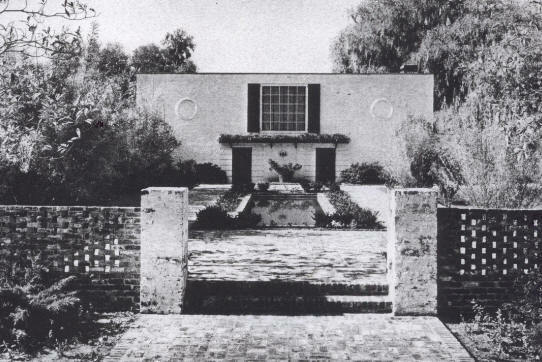 1936 - The Frank Mandel House, Palm Springs CA. Unbuilt. 1937 - The Doris Dockstader Rooney House, 1918 La Mesa Drive, Dodge City KS. Based on the Colliers Magazine House. 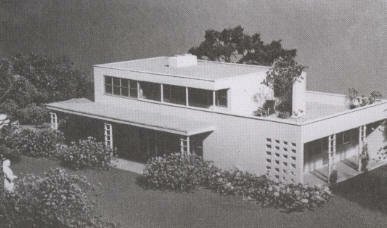 1937 - The Aline Meyer Liebman Residence, aka the Mrs. Charles Lieberman House, Mount Kisco NY. An extensive hilltop estate with carefully integrated gardens developed in collaboration with landscape architect Michael Rapuano, the house was never built. Interviewing architects must have been fun for Aline Liebman - besides Stone, Le Corbusier and Raymond Hood were also in the running. 1937 - The Ladies Home Journal Magazine House, aka PEDAC House, aka Garden House 1404, published November 1937. The model was on display at PEDAC, a decorating art center in New York City. Also published in the Ladies Home Journal in April 1938. Michael Rapuano was the landscape architect. Unbuilt. 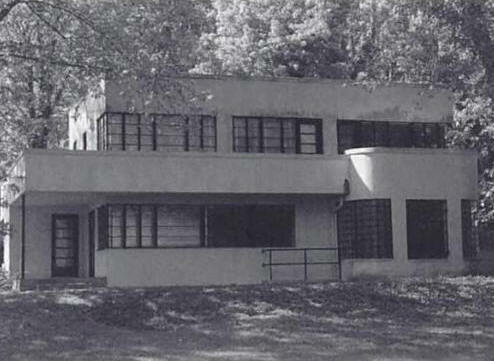 1937 - The Edward Clifford Jones, Jr. Residence,912 Sylvan Avenue, Fairmont WV. Based on the Colliers Magazine House. 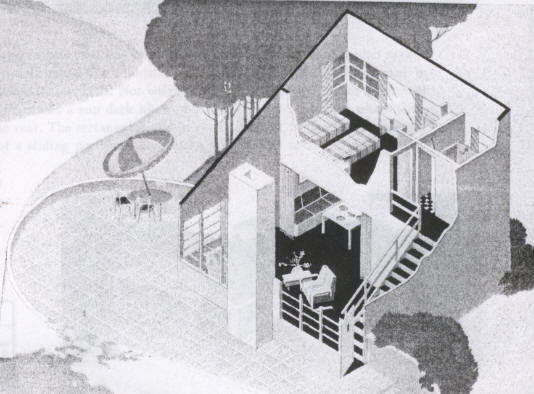 Won an Honorable Mention for the House Beautiful Small House (1939, Competition #12) for houses of 7-10 rooms. 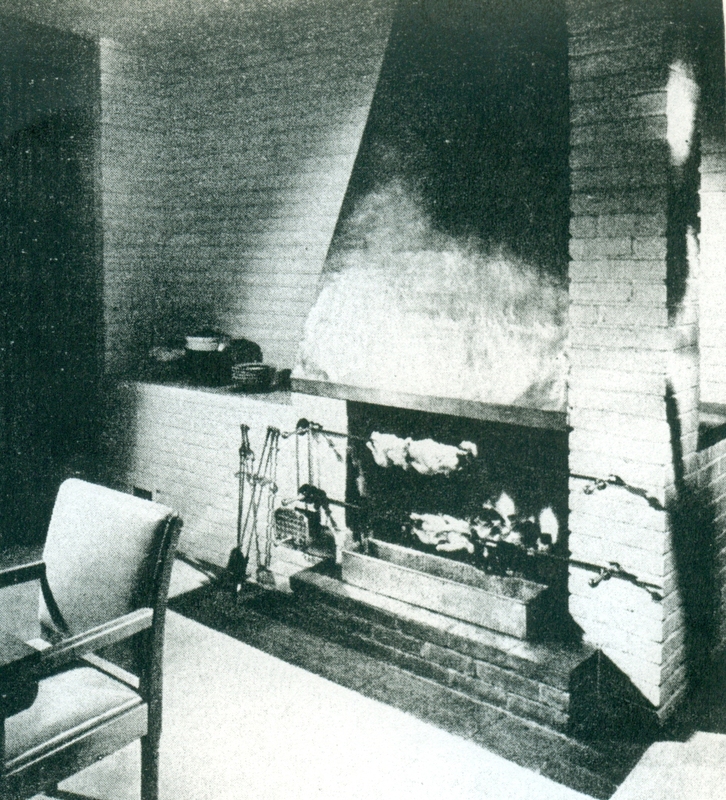 First three photos provided by Jones' son David H. Jones. Fourth photo by Ray Stoker. Has been remodeled. Sold in 2007 to Katherine A. Sherry. 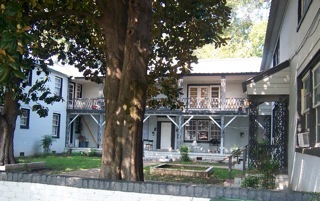 1937 - The Charles Augustus Wallace House, aka the Wallace-McGee House,415 Harden Street, Columbia SC. Based on the Colliers Magazine House. Built by Weissinger and Stork. Sold in 1968 to H. Glenn McGee. Awarded National Register status in 1979. Sold to Denise and Vincent Degenhart. 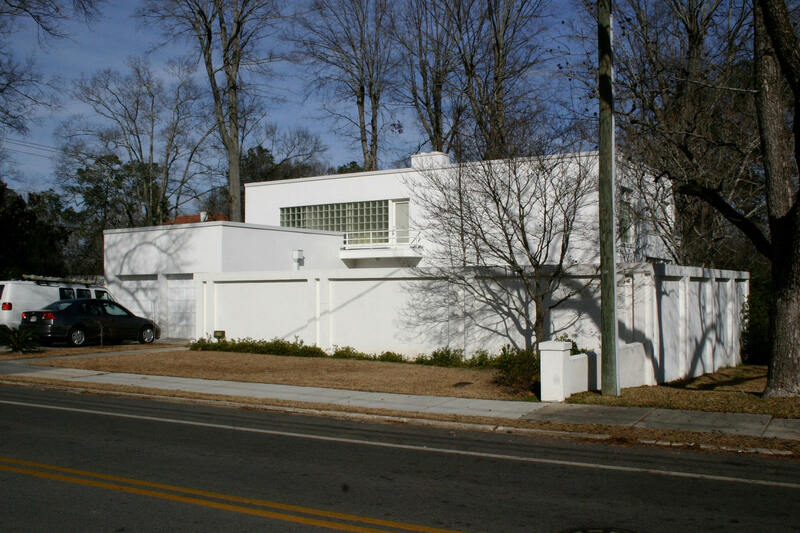 1937 - The David Armstrong McNeill Sr. House, 220 Lee Street, Thomson GA. Based on the Colliers Magazine House. Henry Hogan, a master craftsman, supervised construction of the house. 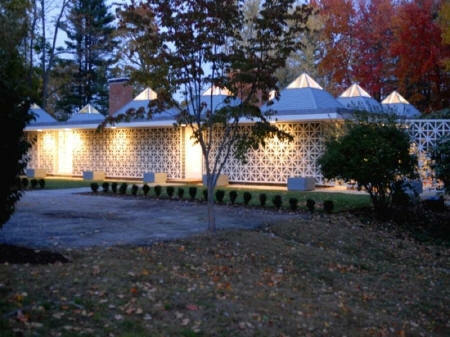 Charles Blumquist, a master mason, did the terra cotta tile, brick, and glass block work. Carl Springer did the stucco and plaster work. 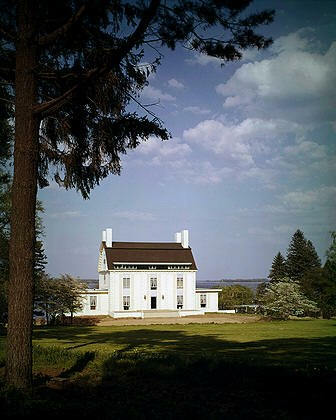 The McNeill's younger son, Thomas O'Shea McNeill, inherited the house and did a yearlong renovation in 1989. As of 2011, owned by Robert Flanders. 1938 - The W. T. Holt House, aka Rockfalls Estate,4009 Chellowe Road, Richmond VA. The land also includes a rock quarry. Based on the Colliers Magazine House. 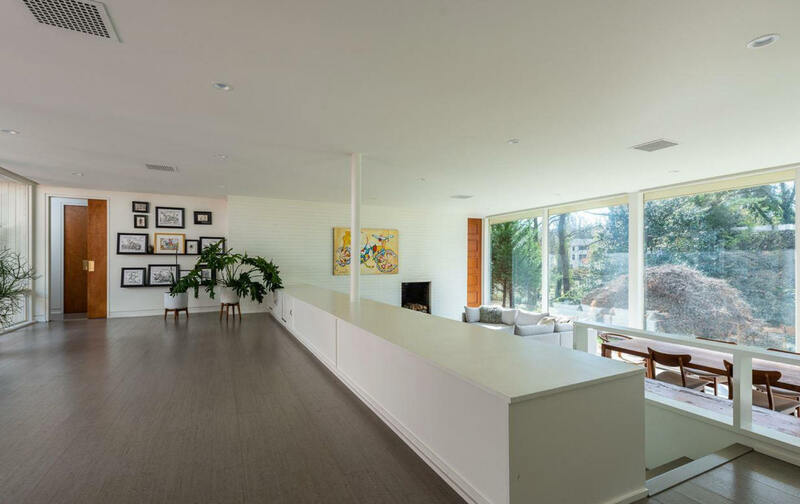 In 1968, architect Haigh Jamgochian purchased the lot and buildings and he and his then-wife opened a Montessori-type school, outfitting the home with classrooms. It operated for one year. There was an extensive fire in 1983 in which Jamgochian was badly burned. As of 2011, the house was uninhabitable. There is also a Civil War-era cottage on the property. Sold in 2014. 1938 - The William C. Ilfield house, aka the Blattman House, aka the Edward Durell Stone House,1710 Eighth Street, Las Vegas NM. Based on the Colliers Magazine House. 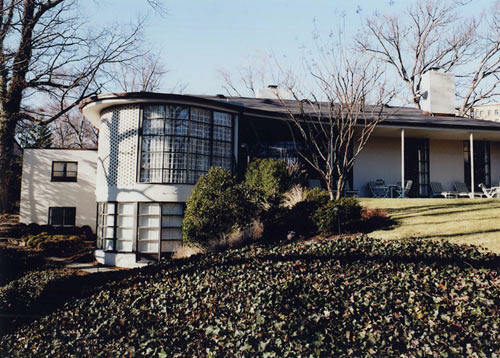 1938 - The Maurice L. Miller House,500 Upland Road, Louisville KY. Samuel Calvin Molloy is listed as the architect of record, but this is clearly based on Stone's 1936 Colliers design. Sold to Charles Cash. 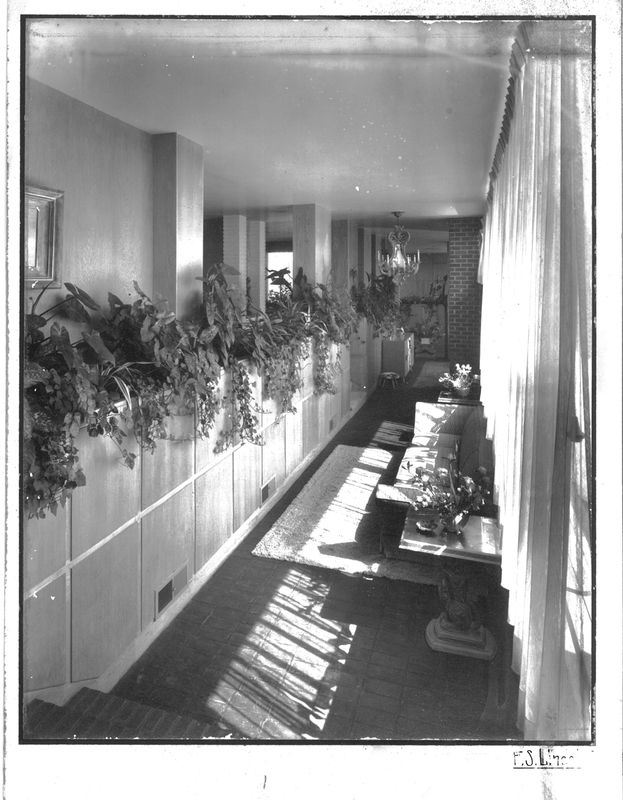 1938 - The Albert Carl Koch Residence,4 Buckingham Street, Cambridge MA. Commissioned 1936. Designed primarily by Koch's son Albert Carl Koch, Jr., who was working at Stone's office at the time. When Koch's parents died, he inherited the house. 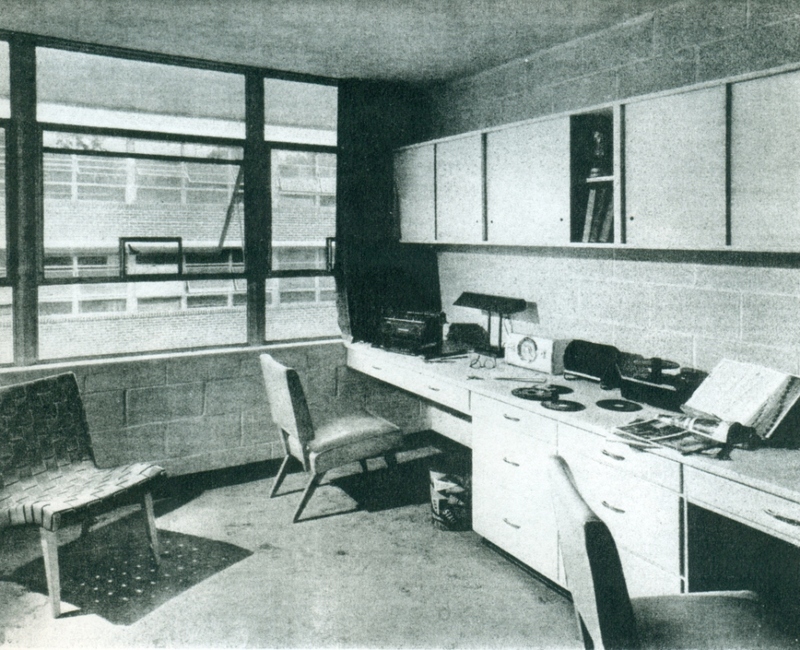 Koch would later gain fame for his Techbuilthouses. Bottom photo by Ezra Stoller/ESTO. The Luces lived here during construction of a new house. 1936 to 1938 - The Henry R. and Clare Boothe Luce House, aka TheMepkin Plantation,1098 Mepkin Abbey Road, Moncks Corner SC. Originally 1000 acres along the Cooper River. 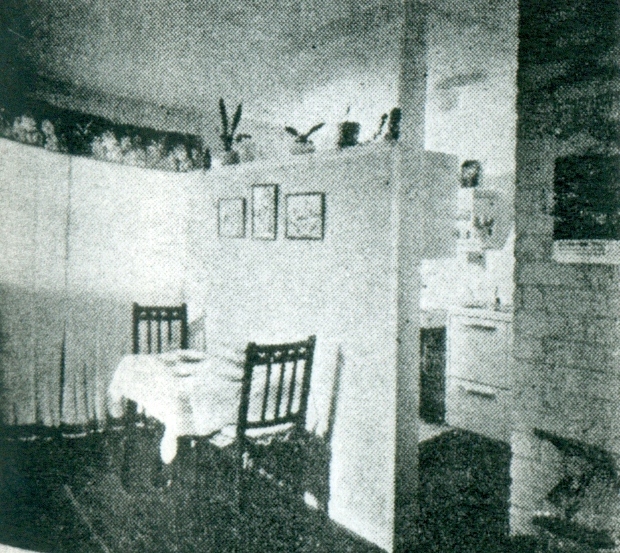 Interiors by Gladys Freeman. 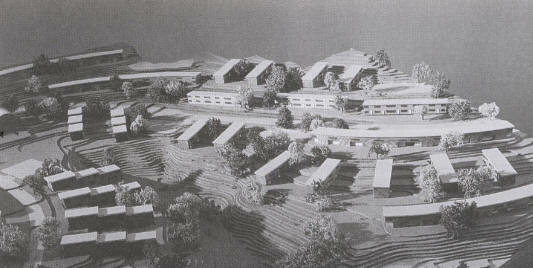 Stone designed several Modernist buildings including a guest house complex, a stable, worker houses, and a power plant. Included in the National Register of Historic Places. The property was donated to the Catholic Church in 1949 and has been owned by the Trappist Monks since the 1960's. Many other structures, probably not designed by Stone, were constructed in the 1960s and 1970s. Open for public tours. 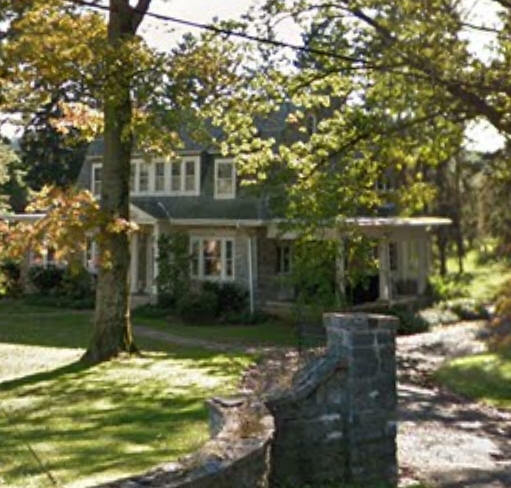 1940 - The Robert J. Sullivan Residence, aka Sheerlund, 1001 Sheerlund Road, Reading PA. Commissioned 1938. Associates: Muhlenberg, Yerkes & Muhlenberg. Deeded to the Sullivan's daughter, Sarah Sullivan McCain and two other Sullivans. 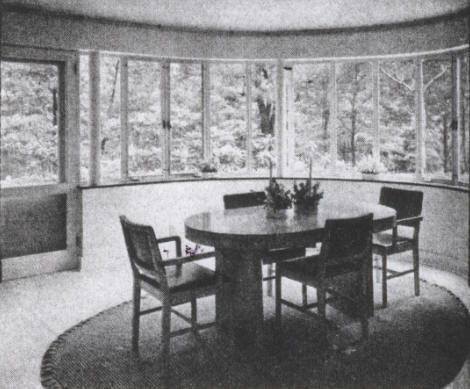 Around 1939 - The G. H. Cox House, Locust Valley NY. Unsure if built. 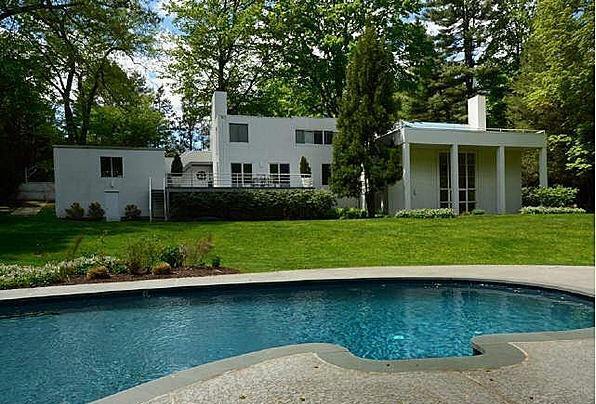 1939 - The Frank and Helen Altschul Guest House/Study, aka Overbrook Farm, aka Hideout, aka River House,356 Riverbank Road, Stamford CT. Photos byEzra Stoller/ESTO. 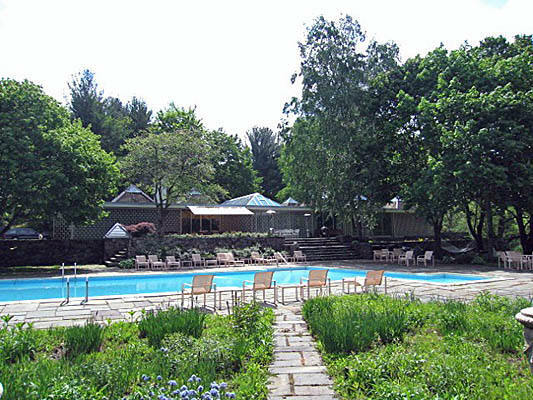 Their 1928 main house, originally 450 acres, was not by Stone. 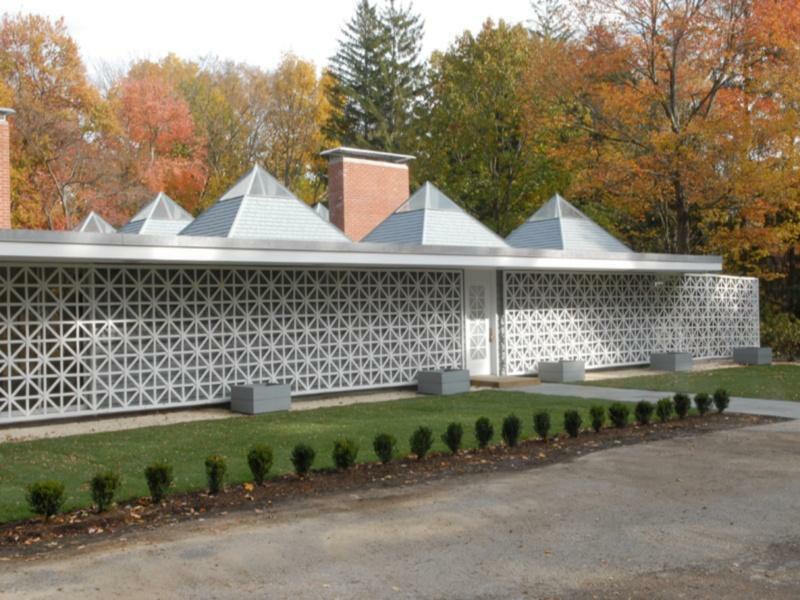 According to Robin Graham, Altschul's grandson, the Study was inspired by the World's Fair house. 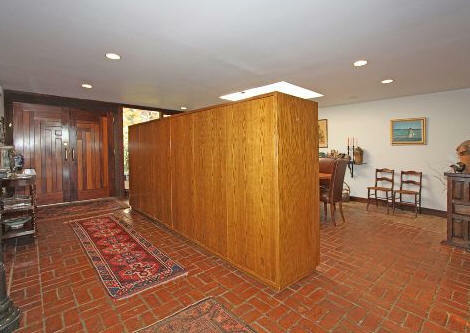 The one large room was primarily a study with wood paneled doors that concealed the bookcases. 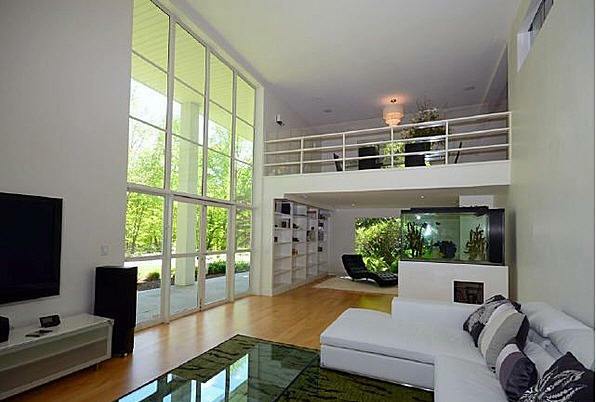 It had the largest exterior plate glass sliding door known at that time. A mile of river bank was excavated for the landscaping. Robin Graham's uncle owned the house for several years and it was damaged by flooding. He wanted to bulldoze it but the family convinced him otherwise. He tarped the roof, basically "moth-balling" the home. 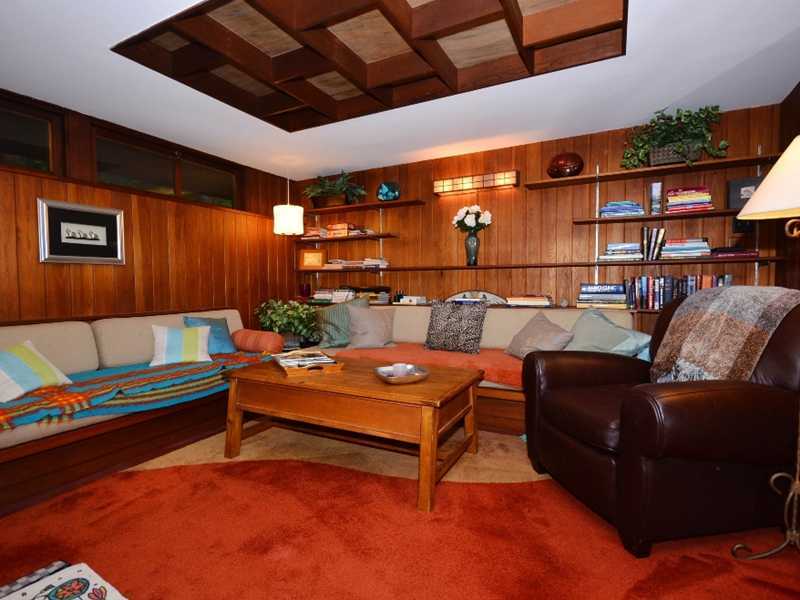 Chuck and Ellen Scarborough bought the estate with the intention of restoring the Study. Still standing as of 2009. 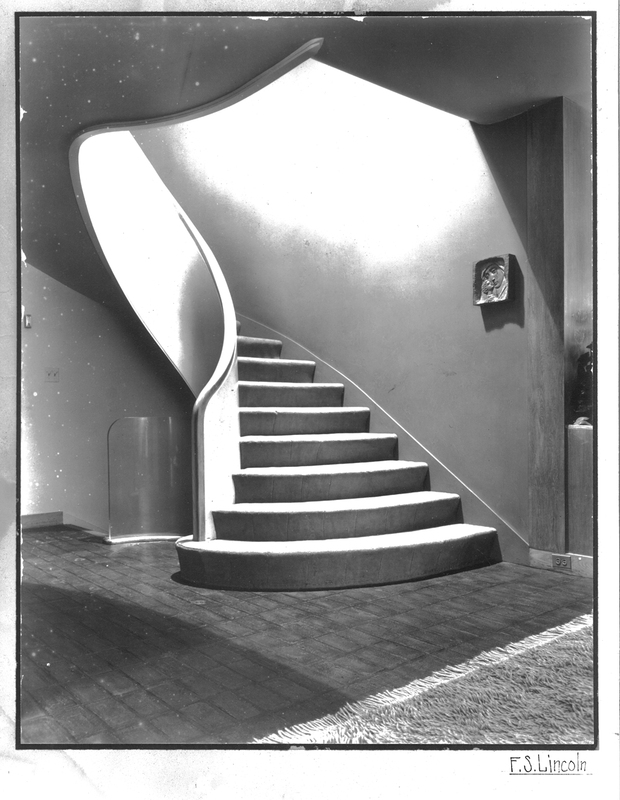 1938 - The A. Conger Goodyear Residence,14 Orchard Lane, Old Westbury NY. 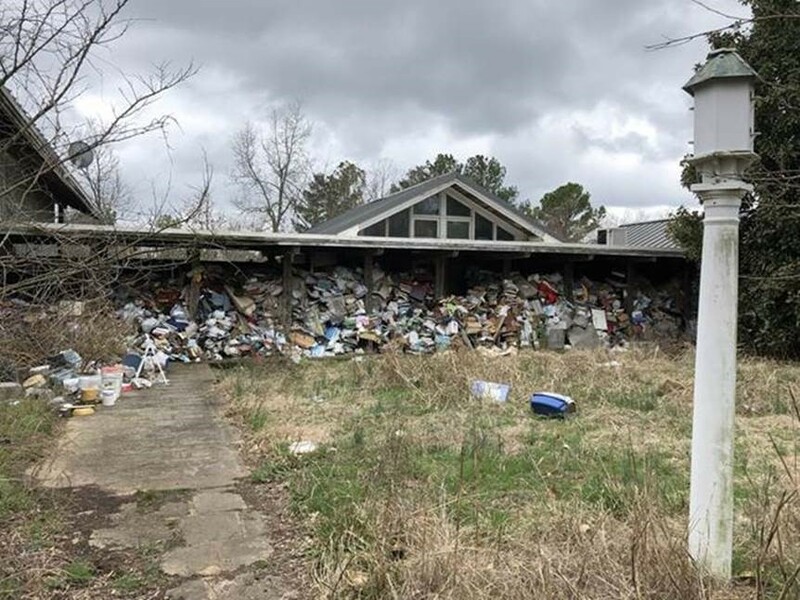 Was originally on 114 acres. 5.5 acres. 6000sf. 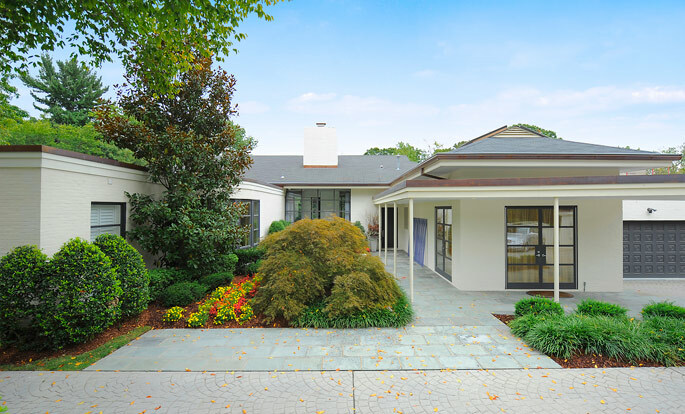 An addition, designed by Stone, was built by Murphy-Brinkworth Construction Company. Goodyear was one of the founders of New York’s Museum of Modern Art. When he died in 1964, the family left it unoccupied, a state it would remain in for most of the next 50 years. 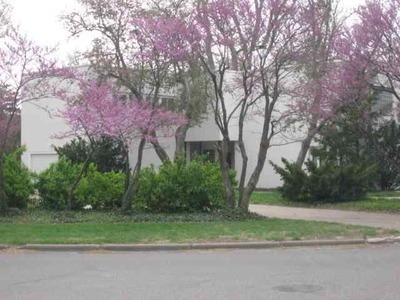 The family donated the house in 1970 to the New York Institute of Technology as a President’s house. That group sold to Wheatley Construction Company which planned to raze it for new development. The World Monuments Fund campaigned to save it starting in 2001 and eventually bought it in 2005. Later that year they sold to Troy Halterman. 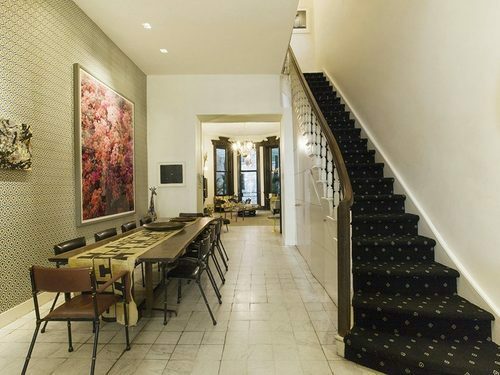 He never moved in, however, and sold it in 2007 to Eric Cohler who did $2M in renovations. Sold to Aby Rosen and Samantha Boardman in 2011 who added a guest house and did a multi-year restoration ending in 2015. Top middle photos by Ezra Stoller and David Sundberg/ESTO. 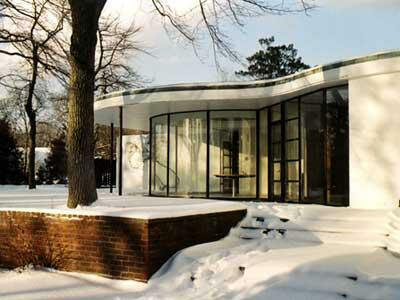 The New Yorker architecture critic, Paul Goldberger, called it “one of the most important houses built in the United States between the two world wars.” Listed on the National Landmark of Historic Places. 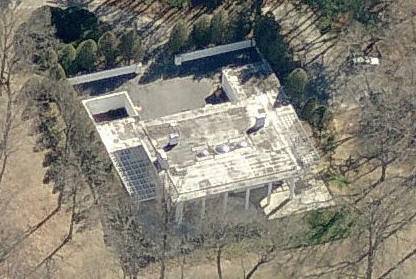 1938 - The George Preston Marshall and Connie Griffith Residence, 2801 Rock Creek Drive NW, Washington DC. 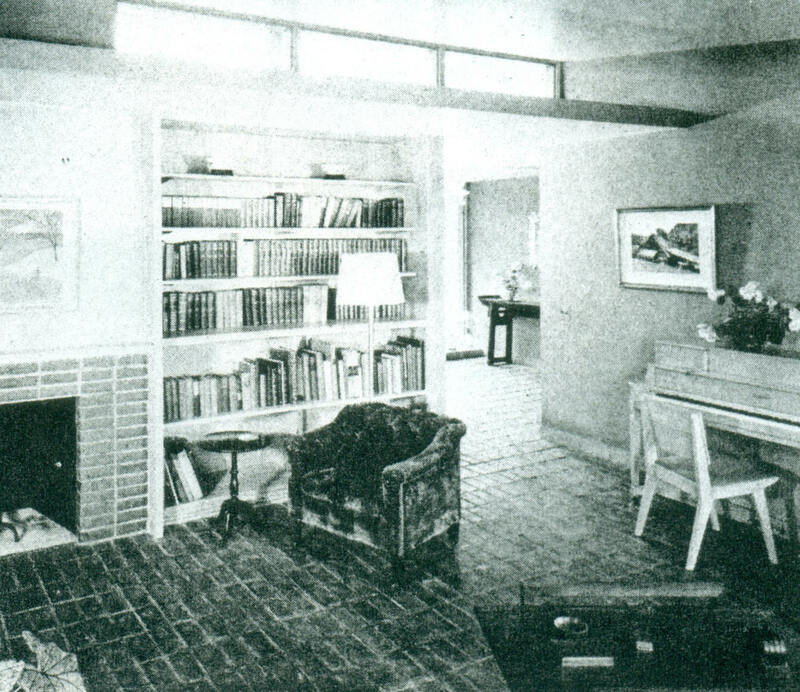 Interiors by Paul T. Frankl. Designed with Walter T. Macomber. BW photos byEzra Stoller/ESTO. 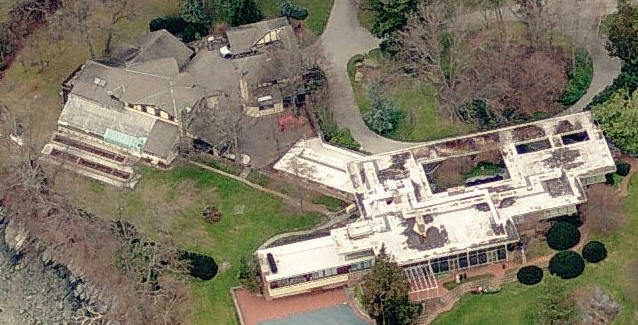 Marshall was owner of the Washington Redskins football team.This house, which has been updated over the years, was sold in 1990 to Jack Kent Cooke, another former owner of the Redskins. He called it "Marbella." 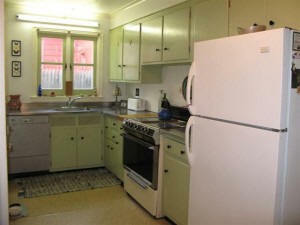 Sold to Debra L. Lee of the McGill Terrace Trust. For sale for four years. Sold in 2013 to Mary Ann Mancini, Trustee for an unknown party operating as The Horae Trust. 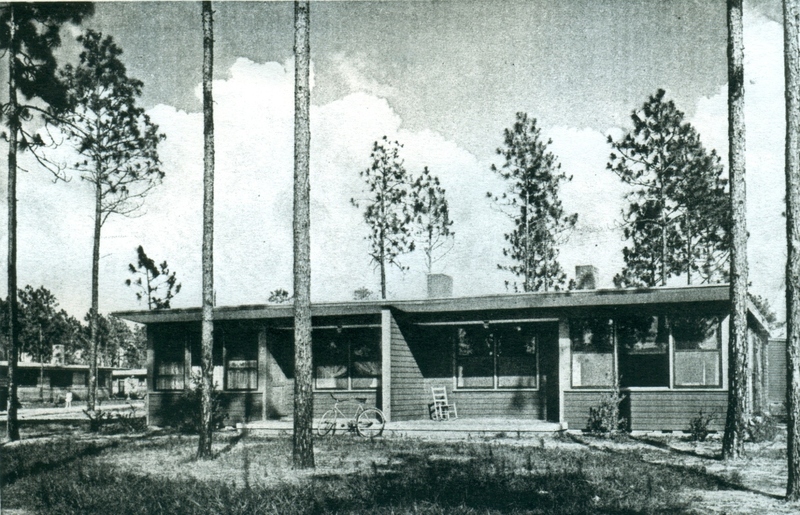 1938 - House & Garden Magazine, Four Vacation Cottages. Unbuilt. 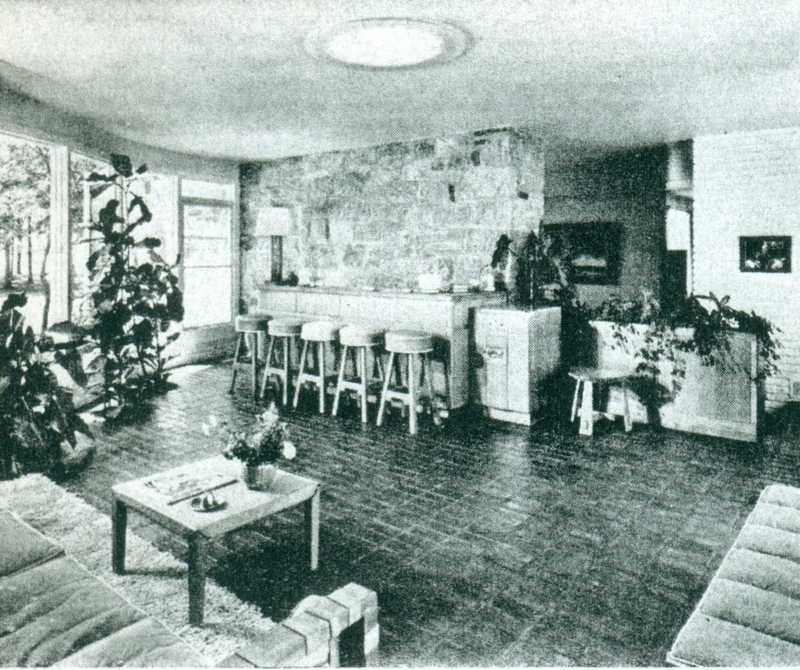 1938 - The W. Alan Ramsey House, aka The Life Magazine House, Atlanta GA. Stone's design was featured as one of "Eight Houses for Modern Living," published September 1938. 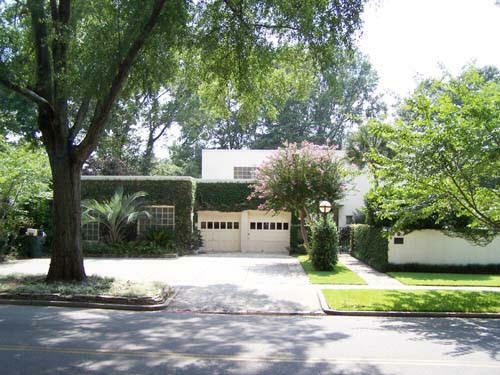 The Ramseys did not like the house they rented at1308 Highland Avenue and the magazine offered two alternatives: Stone's modern and Richard Koch's traditional. Unsure if built. Around 1938 - The Life Magazine House,43 Buckingham Drive, Albany NY. 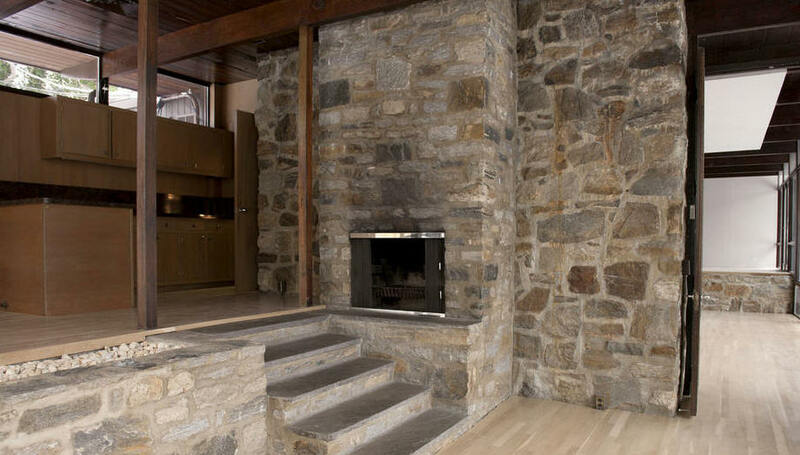 The owner copied Stone's design for the Ramsey's and hired a local architect who did modifications making it less modern. 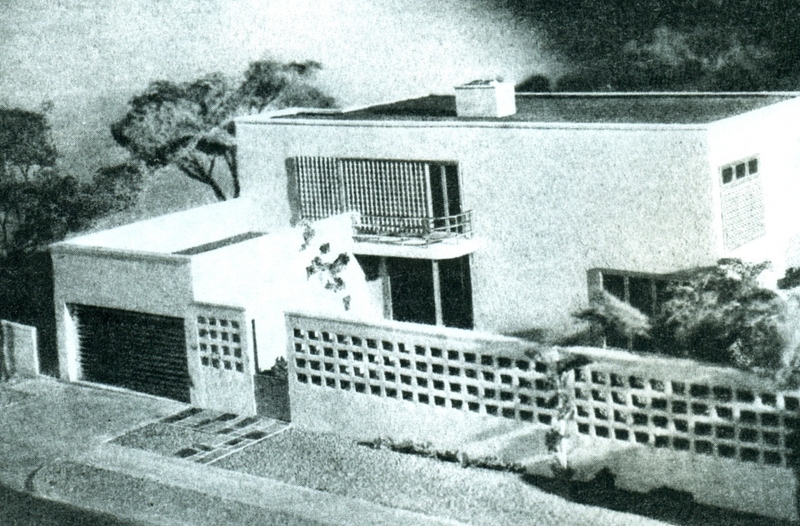 1940 - The Colliers Magazine "House of Ideas" Model Home, built in New York City on a terrace in the 45 Rockefeller Plaza Building. Published in March 1940.Here's a 1940's film about the house. Designed with Howard Myers and John Fistere. The Interior decorator was Dan Cooper. Furniture by Jens Risom. Anyone know what happened to this house? Photos byEzra Stoller/ESTO. 1940 - The William T. Grant House I, Greenwich or East River CT. Photo byEzra Stoller/ESTO. Status unknown. 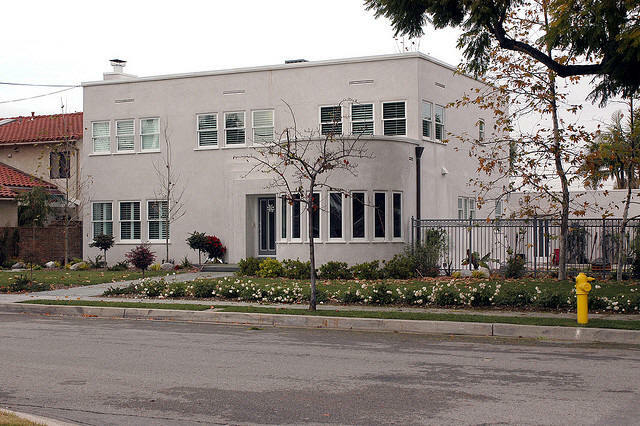 1940 - The Paul T. and Mary Frankl House, 2430 Bowmont Drive, Beverly Hills CA. Designed with Douglas Honnold. 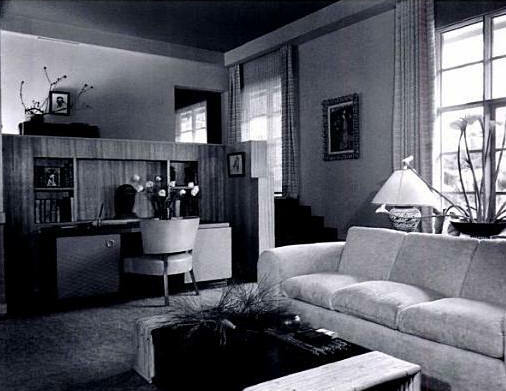 Paul Frankl was the interior designer. Commissioned around 1938. Sold around 1942. Sold to Paul Ziffren. Sold to Cooper Layne. Destroyed. 1940 - The Doll House. 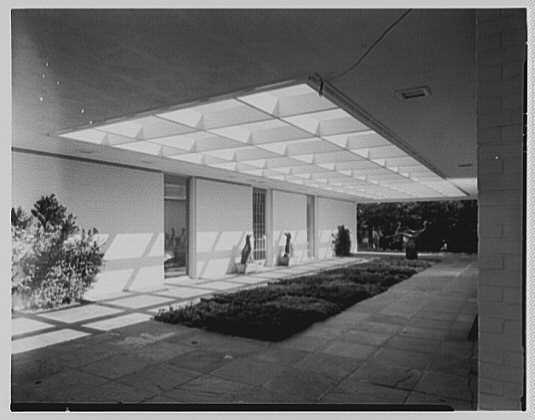 Open planning; walls extend into exterior; glass walls; fireplace and walls of stone; horizontal wood siding; 4 x 4 planning grid; flat roof (with one scalloped edge); circular cutouts; steel columns; open railing on balcony; includes drawings for system of plywood and glass splined exterior panels for enclosure system and 4 x 4 grid; similar to Colliers "House of Ideas." Unbuilt. 1941 - Better Homes and Gardens, Six Weekend Cottages. 1942 - The Monongahela Heights Public Housing, aka Mifflin-Whitaker Project, aka Mon-View Heights, One Midway Drive, West Mifflin PA. 342 units were built. Still standing as of 2000. 1945 - The Life Magazine House, published November 1945. Associates: Stanley Reese, Alexander Knowlton, Graham Stewart. 2-story; wood siding; gable roof. Unsure if built. We researched all four issues of Life Magazine in November 1945 and did not find this house. The date may be a typo from Stone project lists. 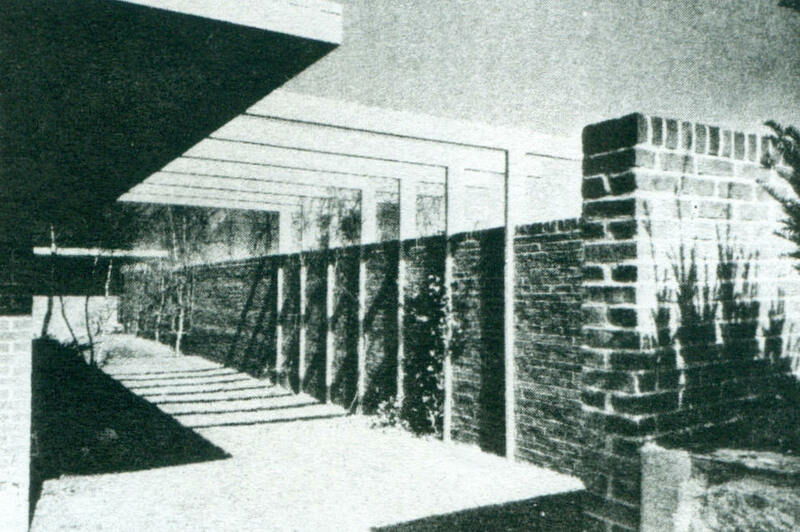 1945 - The J. H. Schaeffer Residence, Great Neck NY. Associates: Reese, Knowlton, Stewart, & Holzinger. 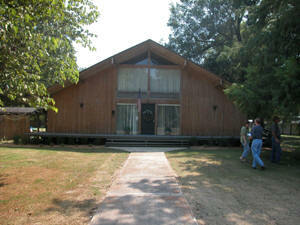 L-plan; low, horizontal, linear hipped roofs; large overhangs; stone main level walls; wood siding upper level. Unsure if built. 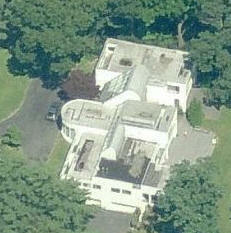 Around 1945 - The Robert Berner Residence, Great Neck NY. L plan, medium slope hipped roof, appears to be wood. Unbuilt. 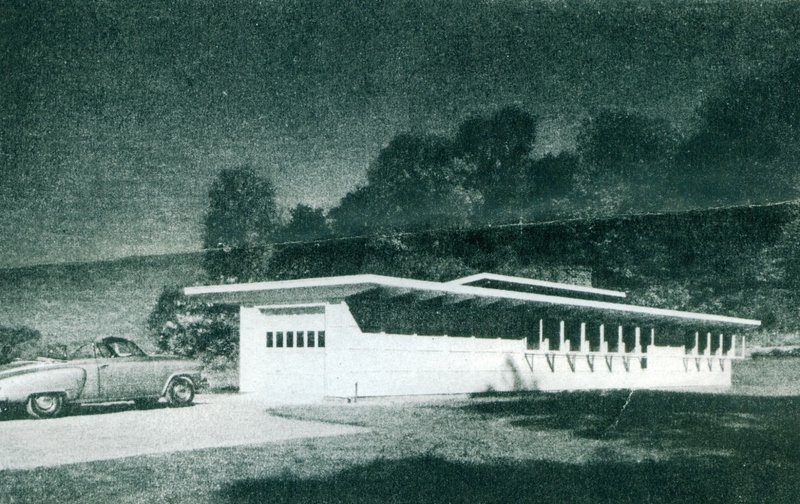 1946 - The Libbey-Owens-Ford Glass Company Solar House, New York. Associates: Reese, Knowlton, Sloan & Holzinger. Low; horizontal; very low pitch with built-up roof; one clerestory; brick and some brick wainscot. 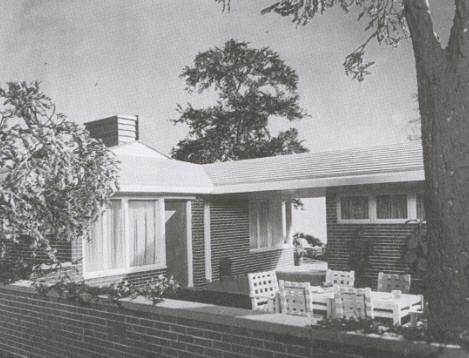 Published in the 1947 Libbey-Owens-Ford book "Your Solar House" designed by many architects; one house for each state. The company's goal of building 48 solar houses was stopped as a commercial promotion like this after WWII appeared frivolous and perhaps unpatriotic. Unbuilt. 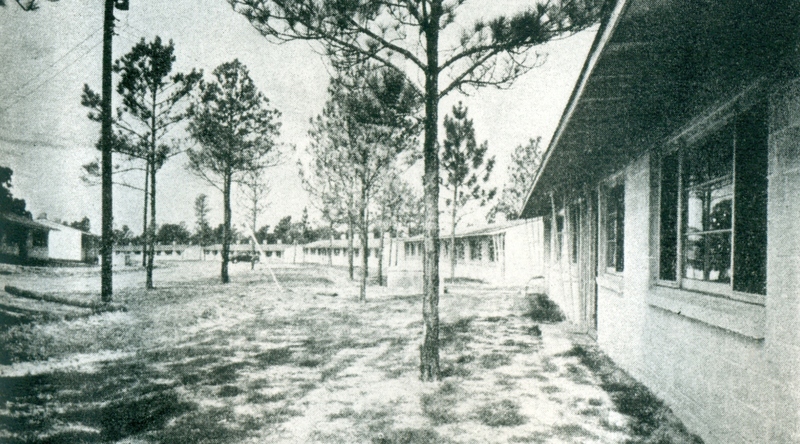 1946 - US Military Housing, Cherry Point NC. Commissioned 1942. Associate Architects: John J. Rowland and Allen J. Maxwell, Jr. Top photo by Ezra Stoller/ESTO. Stone did many other military facilities, including what is now Travis AFB and the headquarters building for Andrews AFB. 1946 - The Good Housekeeping Model Home, location unknown. Published in August 1946. Photos byEzra Stoller/ESTO. Do you know the address? 1946 - The Howard Myers Apartment Renovation, 125 East 57th Street Apartment 4, New York NY. Associates: Reese, Knowlton, Sloan & Holzinger. 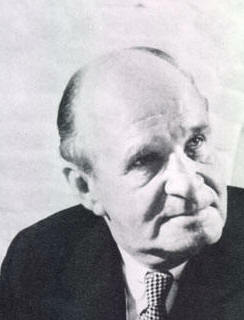 Myers was the editor of Architectural Forum and a good friend of Stone. 1946 - The Ellen L. B. Cash Alterations, 50 West 10th Street, New York NY. Cash was the children's book editor for the New York Times. 3 ½ story brownstone; 4 apartments, one with a balcony. 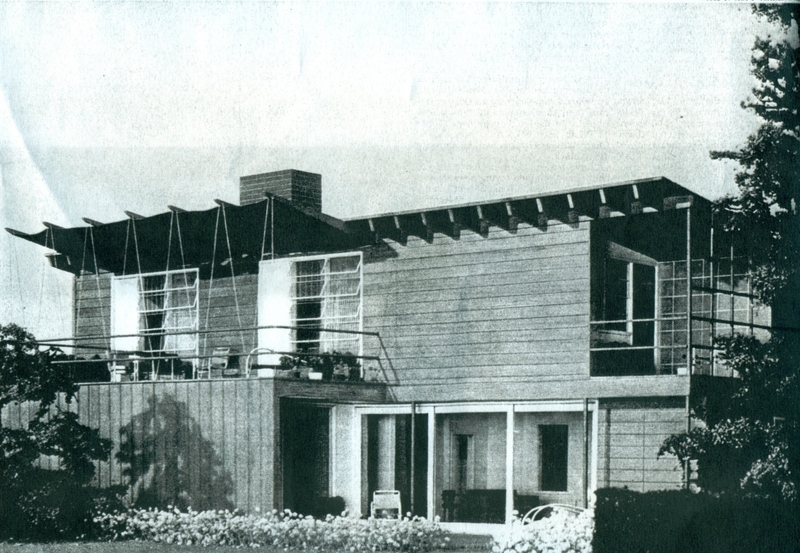 1946 - The Jacques Makowsky Residence, 40 Pond Road, Kings Point NY. Built by Murphy-Brinkworth Construction Company. Makowsky and his wife were the "inventors" of the Cornish Hen, a food craze that peaked in the 1960's. Photos fromHome and Garden Magazine, July 1947, and FS Lincoln. Sold to Leonard Klein. 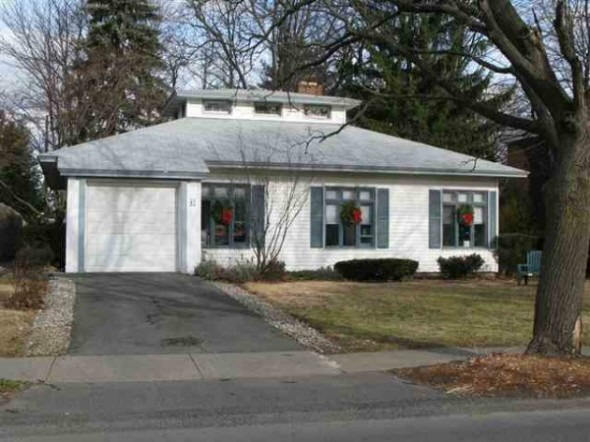 Sold in 2002 to David and Eileen Schifter. 1946 - The Francis Vandiver Apartments, Montgomery AL. Still standing as of 2010, painted baby blue, and quite run down. 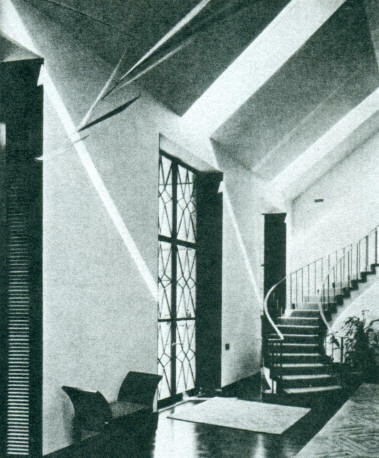 1946 - The Walter C. and Helen Janney Jr. Residence, Cold Spring Harbor NY. Built as a model affordable house by Murphy-Brinkworth Construction Company. Designed with Reese, Knowlton, Stewart & Holzinger. Published in Architectural Forum, September 1947. Sold around 1950 when they divorced. Still standing in the 1980's according to son Oliver Janney. Current status and address unknown. 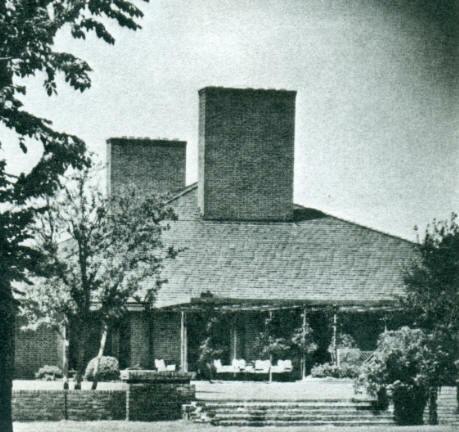 1946 - The Bernard Tomson Residence, 1 Shore Drive, Kings Point NY. Built by Murphy-Brinkworth Construction Company. Associates: Reese, Knowlton, Sloan & Holzinger. Interiors by T. H. Robsjohn-Gibbings. Additions in 1989. Sold to David H. and Parvi Mehrara. 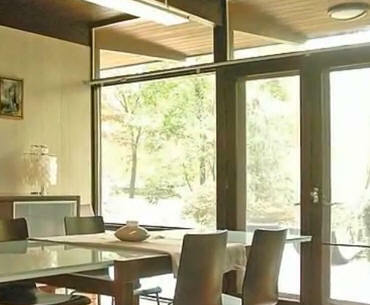 1946 - The Joseph S. Wohl House, 15 Manor Lane, Lawrence NY on Long Island. 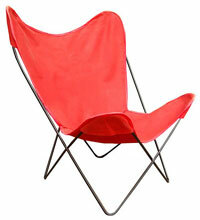 Designed with Reese, Knowlton, Sloan & Holzinger. Photos byEzra Stoller/ESTO. 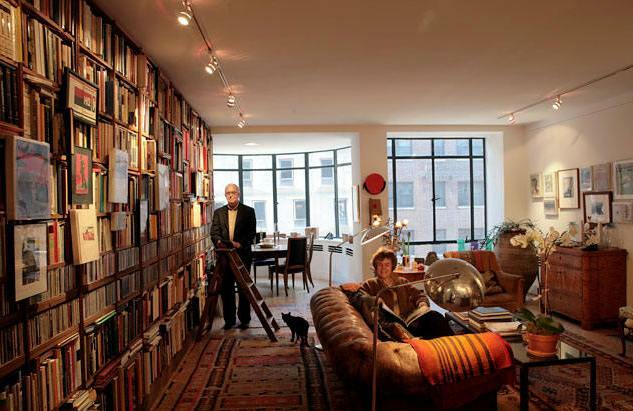 William Pahlmann, Interior Designer. Destroyed around 2001 and a new house built on the site. 1946 - The Ingersoll Village Residence, aka the Ingersoll Steel / Borg Warner Demonstration House, aka The Ingersoll Steel Utility Unit Model Home, 1034 Crown, Kalamazoo MI. Designed with Stanley Reese. Seeking an efficient and economical way to build homes, architect J. Fletcher Lankton of Peoria IL designed a utility core that brought together all the plumbing pipes, wiring conduits, and other necessary electric and mechanical items in one unit that could be manufactured off-site and inserted into a house under construction. The design saved scarce metal, allowed the elimination of a basement, and since it could be installed on a prepared base in less than one day, it considerably sped up the construction process. Lankton persuaded Kalamazoo's Ingersoll Steel and Disc Division of Borg-Warner to build the prototype. To prove that houses could be designed around the utility core in a variety of styles, sizes and price ranges, eight nationally known architects were commissioned to design 12 houses. Other architects besides Stone who did houses wereAlden Dow, Royal Barry Wills, L. Morgan Yost, George Fred Keck, Hugh Stubbins, Jr., and Harwell Hamilton Harris. Landscape architect Michael Rapuano developed the site plan. 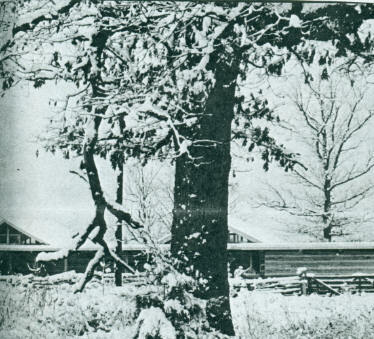 In 1945 the houses were built in the Hillsdale Park subdivision, north of West Main Street. 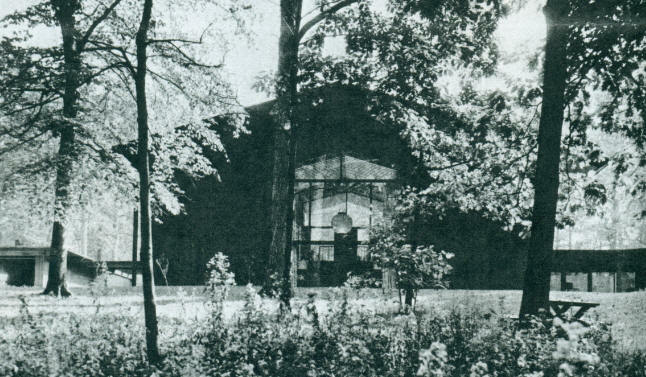 The Miller-Davis Company of Kalamazoo served as General Contractor. They were collectively known as Ingersoll Village. 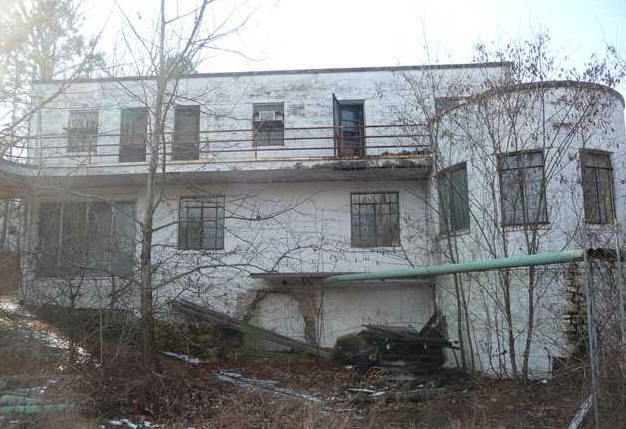 They were to be occupied for at least a year by Ingersoll engineers and have economics experts to evaluate the functionality of the utility unit. Open houses were held to interest the public in the concept. Later sold to private owners. Although many have been modified, all of the original Ingersoll Village houses are still in active use. 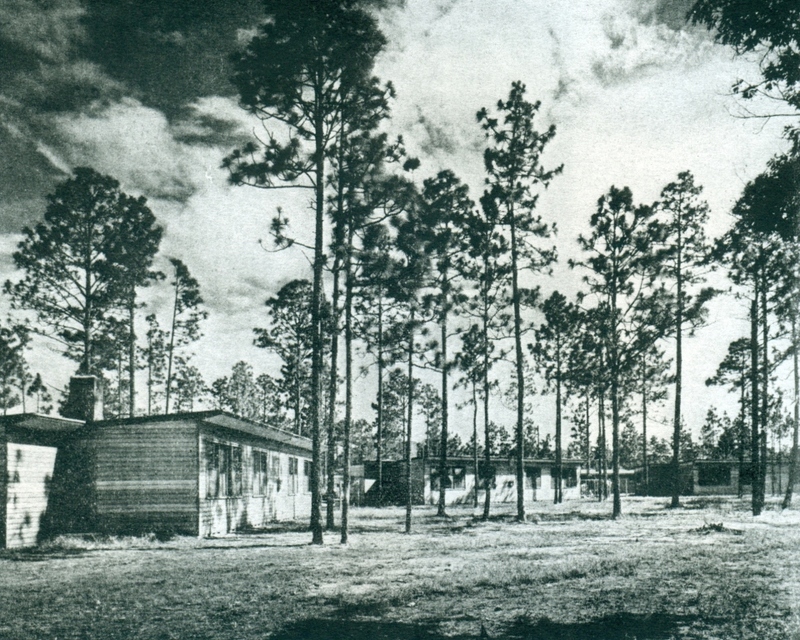 1946 - Architectural Forum Prefabricated Home. Associate Architects: J. Stanley Sharp, Cope Walbridge. 1947 - The John J. Anthony Residences, location unknown. Associates: Reese, Knowlton, Sloan & Holzinger. Four houses, all same footprint, 2-story and 1-story, low hipped roof; and one scheme for low-pitched exposed wooden structure type cluster. Unsure if built. 1947 - The M. Genola Residence, Long Branch NJ. Associates: Reese, Knowlton, Sloan & Holzinger. Small 2-bedroom; concrete block, some perforated; flat roof; living room lowered 4'-0"; generous overhangs tapered to narrow edge; angled fireplace opening with Lalley column. Unsure if built. 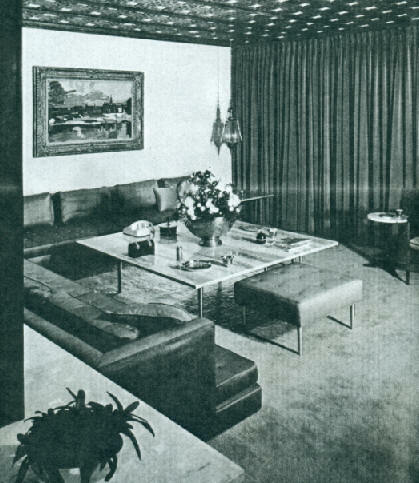 1947 - The M. Stranahan Residence, Toledo OH. Associates: Reese, Knowlton, Sloan & Holzinger. 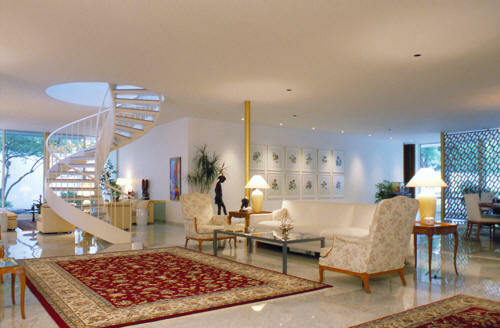 U-plan; enter through enclosed garden court which becomes ice rink in winter; similar plan to Maduro residence; Colonial exterior. Unsure if built. 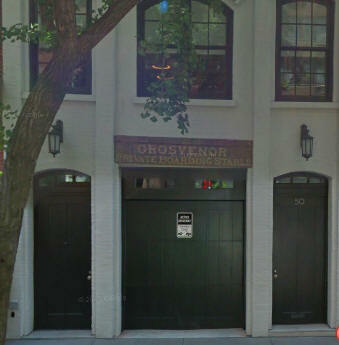 About 1947 - The Sarah Hunter Kelly Residence Alterations, 134 East 71st Street, 5th floor, New York NY. Associates: Reese, Knowlton, Sloan & Holzinger. Unsure if built. 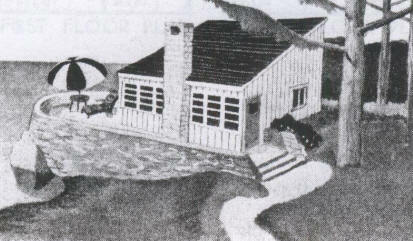 1947 - The Seymour Kimmel House, 803 Weaver Street, Larchmont NY. Top photo byEzra Stoller/ESTO. Associates: Reese, Knowlton, Sloan & Holzinger. Has been refinished and added onto. 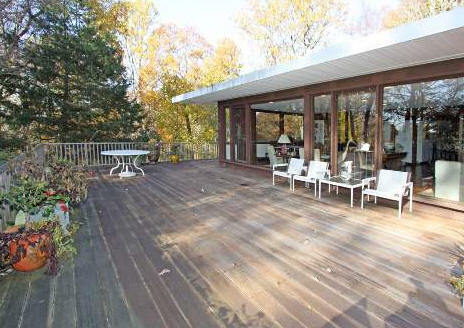 Sold in 1968 to the Hoffmans. 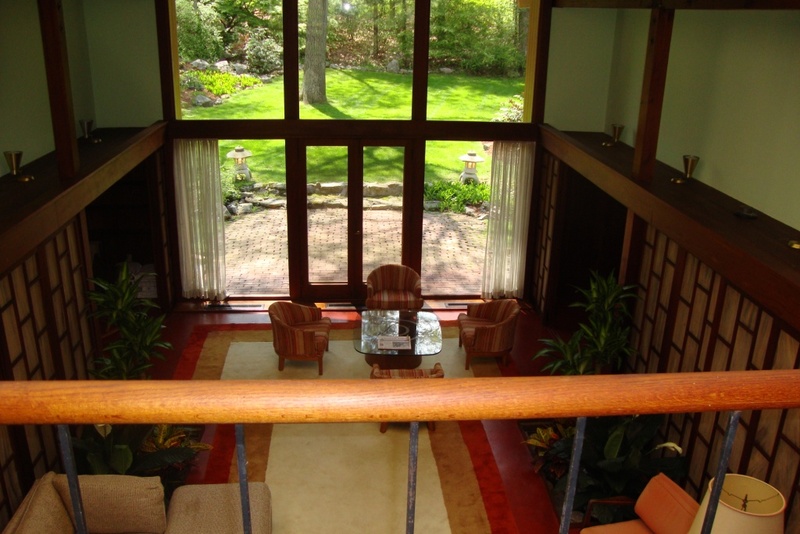 Deeded around 1970 to their son, Bruce Hoffman and his wife Perry Hoffman. Rented in 2013. For sale in 2018. 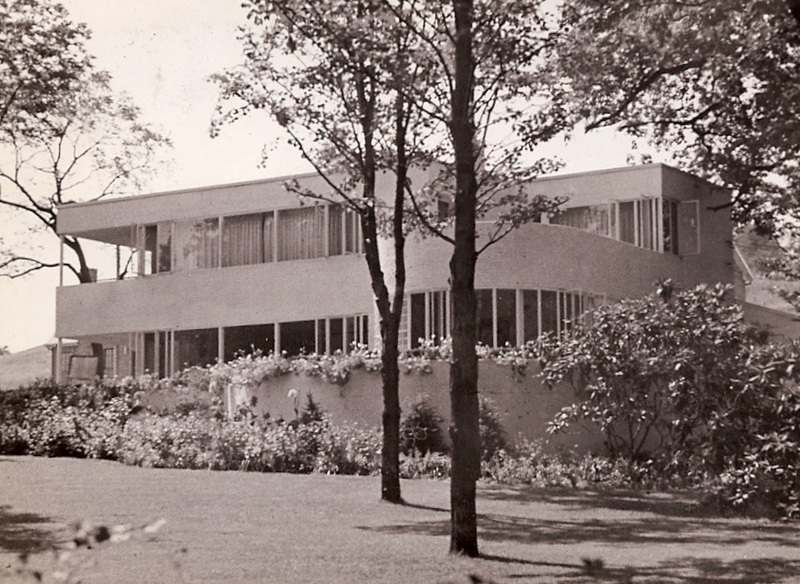 1947 - The Siegel W. and Dorothy Judd Residence, Grand Rapids MI. Associates: Reese, Knowlton, Sloan & Holzinger. 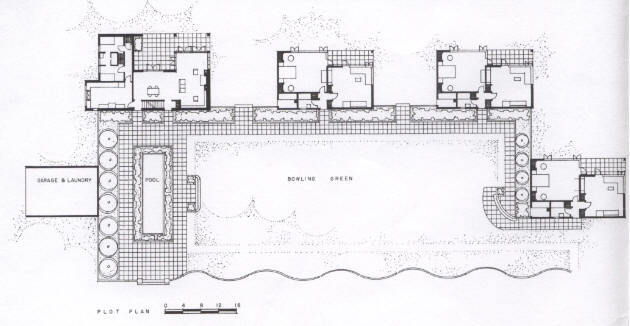 L-plan; flat roof; much glass; thinnest mull lines; broad overhang; thin edge; stone solid walls. Unsure if built. 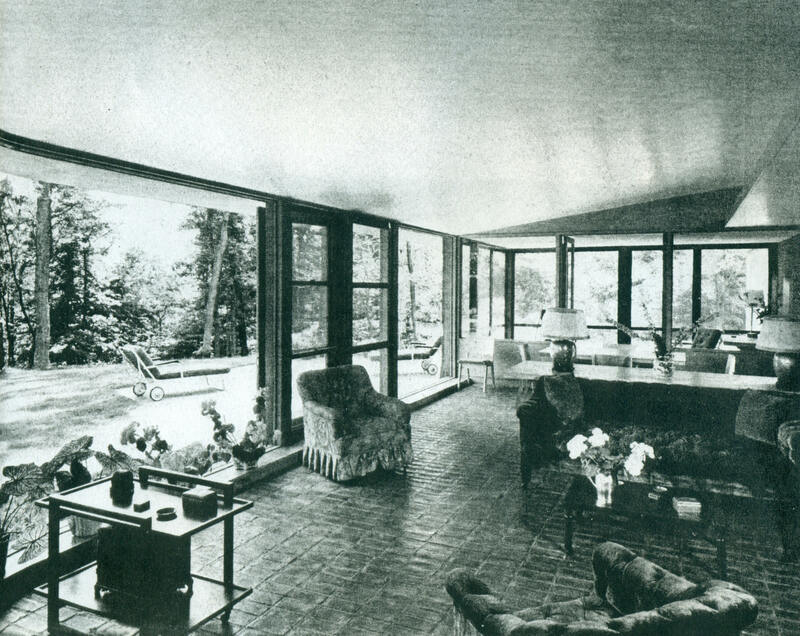 1947 - The Abraham H. Schwartz Residence, Lake Placid NY. 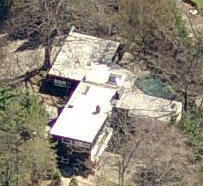 Associates: Reese, Knowlton, Sloan & Holzinger Hillside site; entry on upper level; 2-story pool side. Unbuilt. 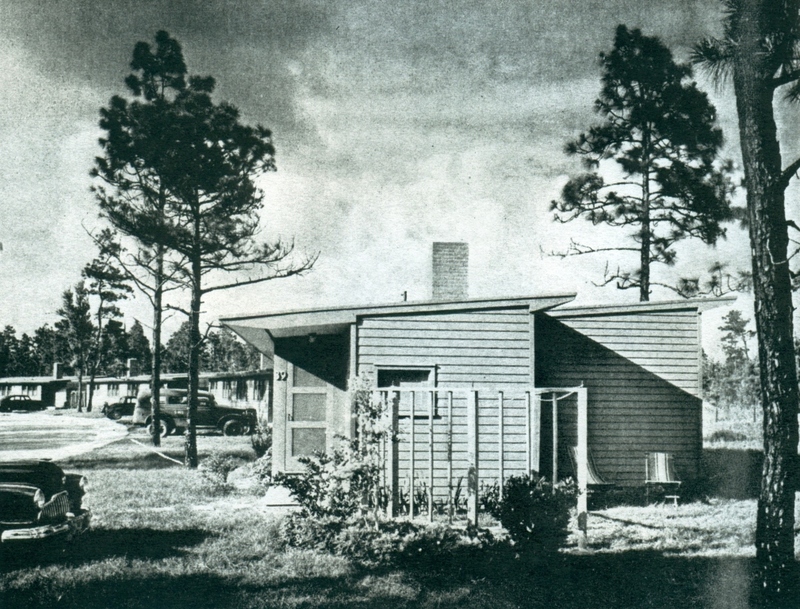 Approximately 1947 - Plato Schwartz House, Location unknown. Associates: Reese, Knowlton, Sloan & Holzinger. Unbuilt. 1947 - The Life Magazine Model Home, aka A House for the Country. Unsure if built. 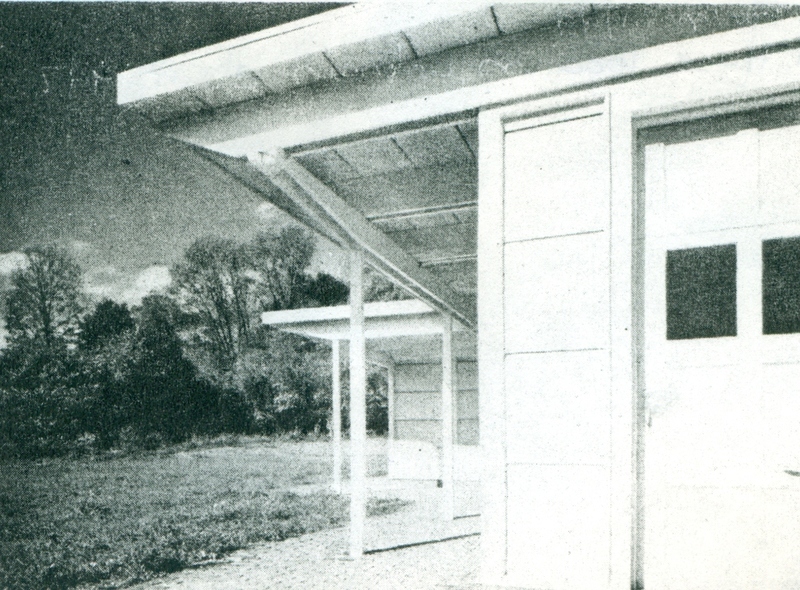 About 1947 - The Panelized House, location unknown. Karl Holzinger and Roy Johnson, Associates. Thin-panel construction; exterior walls and partitions; storage units in interior; flat roof. 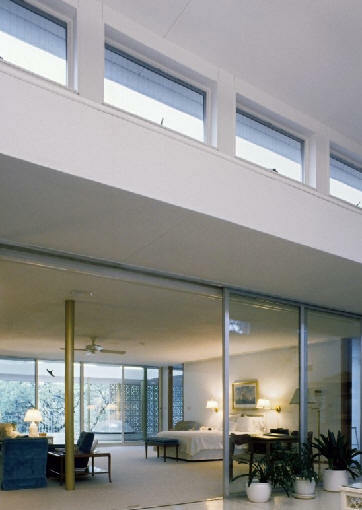 The horizontal lines of the curtain wall panels in this long (78 ft) house and its attached garage are emphasized to minimize the criticism that the batten detailing required for such large panels is too "heavy" for small buildings. Radiant heat. 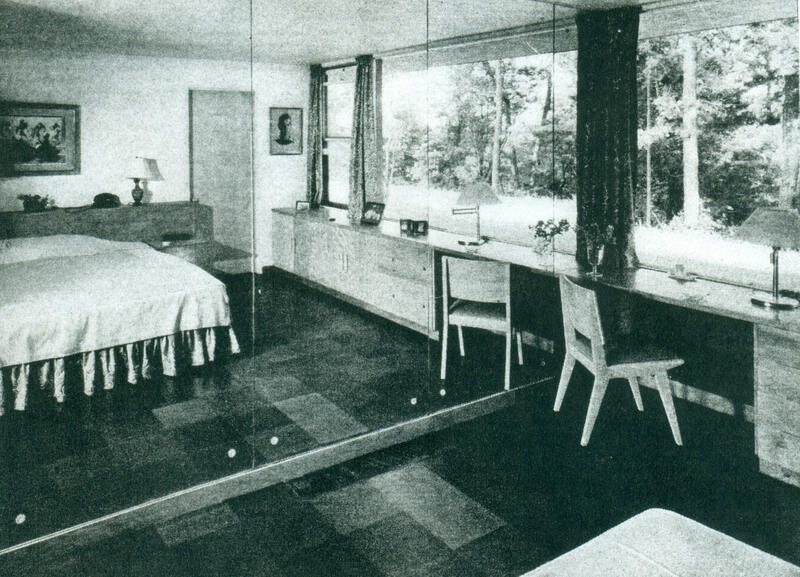 Featured in Architectural Forum 11/1949. It was definitely built. Do you know where it is? 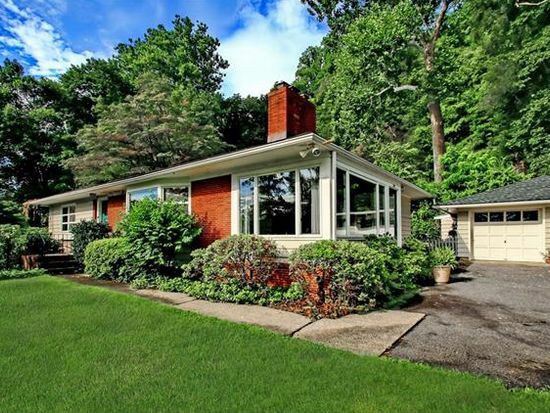 1948 - 94 Lords Highway, Weston CT. Designed by Edward Lloyd Flood as a solo project before he worked for Stone's office, therefore not a Stone design, although it was advertised as one, for sale in 2017. Sold in 2017 to Justin Barnes. 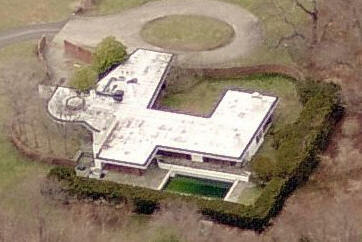 1948 - The Frederick (Fred) L. and Ethel Eisenmann Maduro Residence, 33 Broadlawn Avenue, Great Neck NY. Commissioned 1947. Built by Murphy-Brinkworth Construction Company. 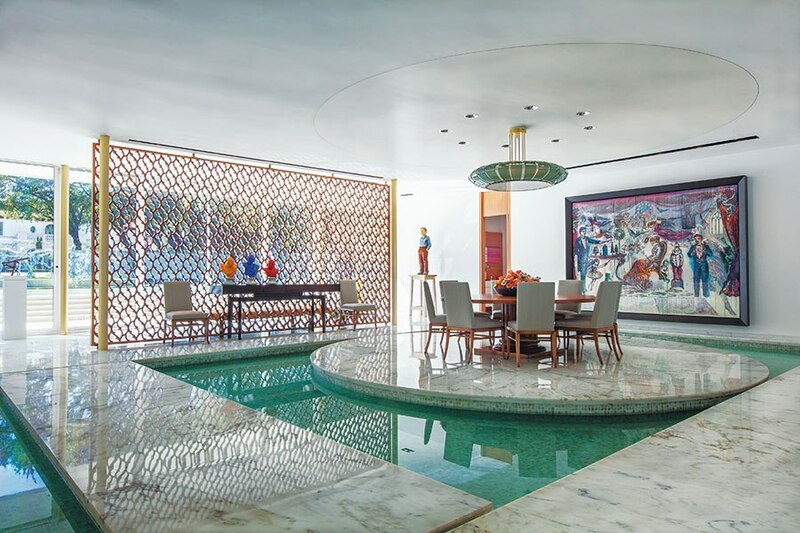 Designed with Reese, Knowlton, Sloan & Holzinger; specifically Karl Holzinger Jr. did most of the design, according to daughter Rita Maduro Frenkel. What the clients really wanted (and got) was a tropical house on Long Island. 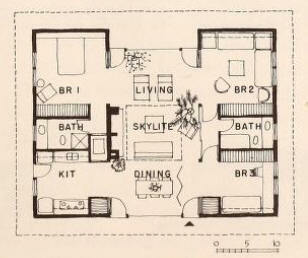 Featured in the New York Times and Architectural Record May 1954 Sold around 1955. Photos by Ben Schnall. Sold to Stuart and Myra Perlen. a) 4' grid, 3 x 4 posts, two 2 x 12 beams tapered and bolted to columns; glazing and Durisol panels between posts; flat roof with sloping clerestory roof over living room. Unsure if built. b) similar to Panelized House but reversed; stucco areas; brick fireplace; boxed full-depth cornice, tracings, indicating construction-built and used by Good Housekeeping Magazine for promotion as "House with a Heart." Unsure if built. 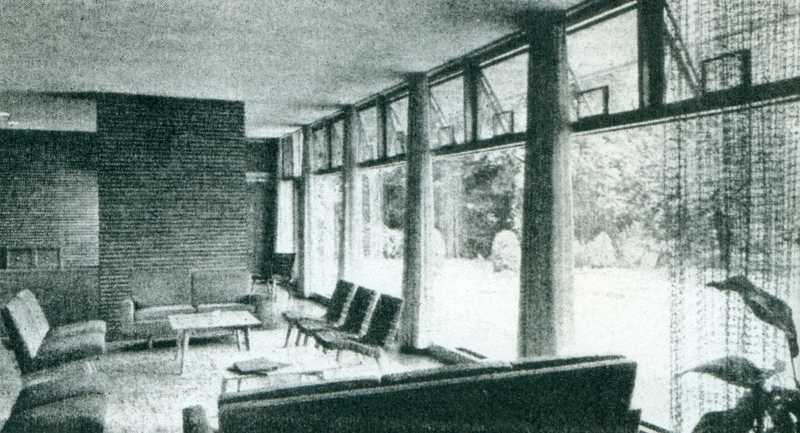 About 1948 - The Dieffendorf 40 House, location unknown. Associate Karl Holzinger, Jr. Unsure if built. 1948 - The Sherwin Williams House, location unknown. Associates: Reese, Knowlton, Sloan & Holzinger. 1-story; ordinary L-plan; low pitch, thin roof edge; horizontal wood siding; horizontal projected wood windows; 4' glazing grid. Unsure if built. 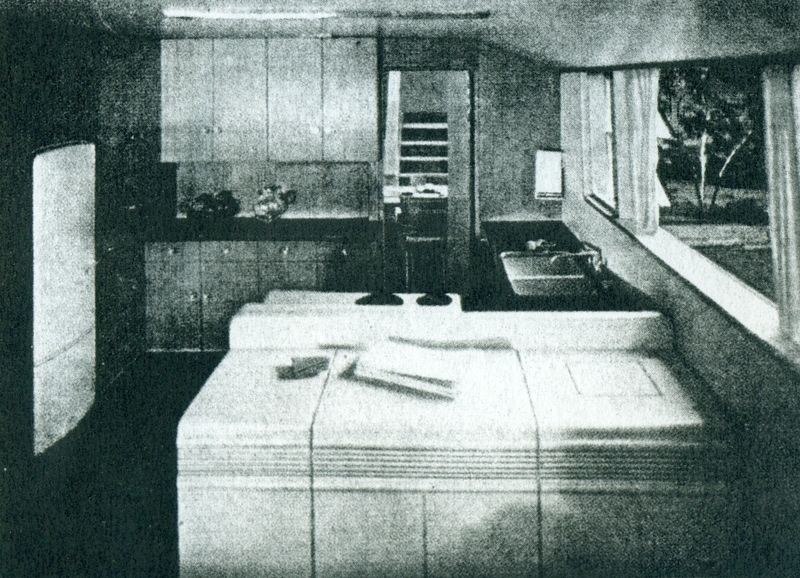 1948 - The Woman's Home Companion Magazine (May 1948) Model Home. 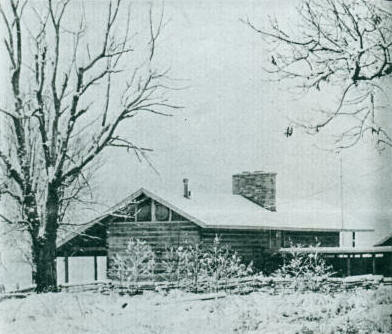 L-plan; 5' structural grid; 4 x 4 posts; 4 x 10 beams with ends tapered and rounded; vertical wood siding; large casement windows; flat roof with clerestory at living room. Unbuilt. 1948 - The General Beyette Residence, Coronado CA. Associates: Reese, Knowlton, Sloan & Holzinger. 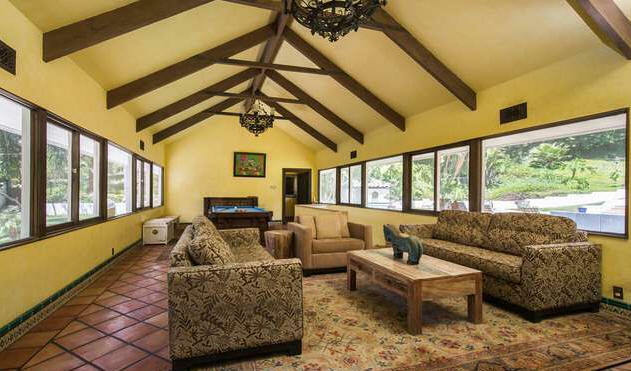 Detached carport with garden screening wall and trellis overhead; "California" open planning; interior/exterior flow; large hipped roof; horizontal wood siding; stone walls. Unsure if built. 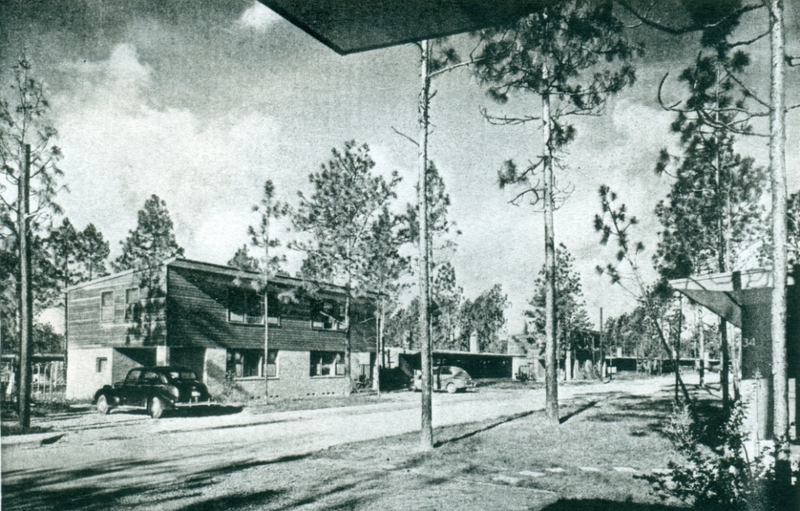 About 1948 - The Morell Houses, location unknown. Prototypes for developer. Unsure if built. 1948 - The John Matthews Residence, Little Rock, AR. Several schemes. Unsure if built. 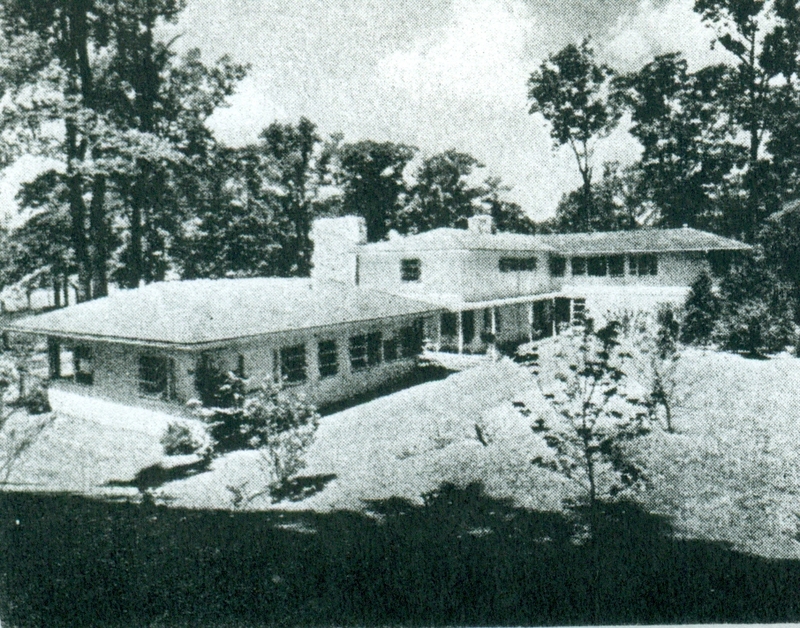 1948 - The Thomas G. Moore Residence, Mountain Lakes NJ. Associates: Reese, Knowlton, Sloan & Holzinger. Many schemes. Unsure if built. 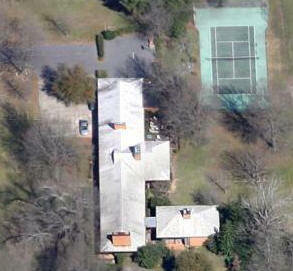 1948 - The Colonel Stuart Randall Carswell and Priscilla K. Carswell House,102 Briar Lane, Newark DE. The Carswells saw the plan in Colliers and had it designed by another architect when the Colonel retired. At least five other owners over the years. 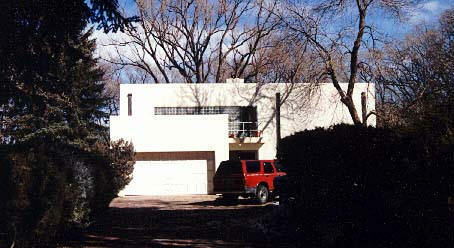 Sold in 1999 to Fritz Nelson and Margaret Wilder. Added in 2011 to the National Register of Historic Places. 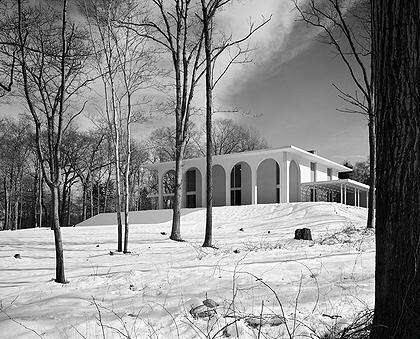 1948 - The Alfred K. Stern and Martha Dodd Stern Residence, Kitchawan Road, Lewisboro NY. The Sterns had a PO Box in Ridgefield CT, so most newspaper accounts of the period incorrectly placed them there. The couple were accused of spying for the Soviet Union in the 1950's. By that point they had already fled the country. The charges were dropped in 1979. Associates: Reese, Knowlton, Sloan & Holzinger. L-plan; partial second floor; 4' non-structural grid; brick lower level; horizontal wood siding upper level; flat roof with tapered ends. Unsure if built. 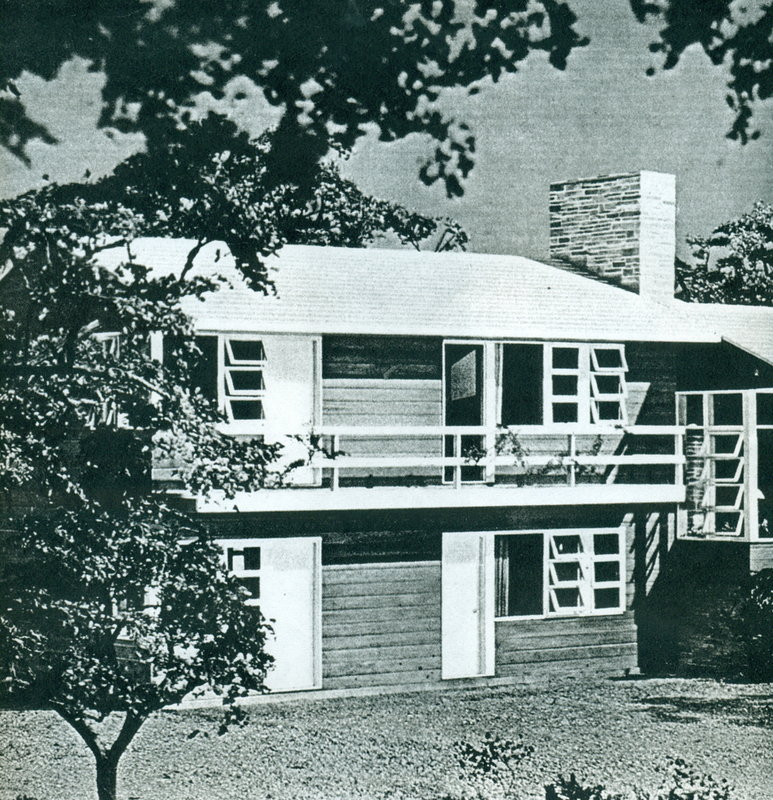 1949 - The David and Virginia Stech House, 73 Whippoorwill Road East, Armonk Village NY. Photos byEzra Stoller/ESTO. Associates: Holzinger & Johnson. Published in Ladies Home Journal, April 1950. Sold to Debra Duncan Berberich. 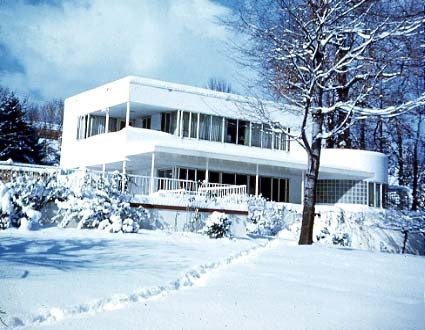 1949 - The William S. Rayburn House, 7 Windward Avenue, White Plains NY. Commissioned 1948. Photos by Ezra Stoller/ESTO. Associates: Holzinger & Johnson. Sold to Joseph and Lisa Klasner. 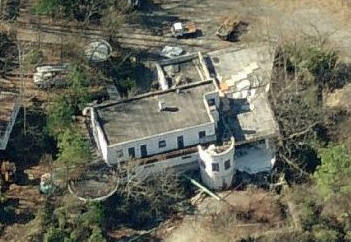 Sustained significant damage from Hurricane Sandy. 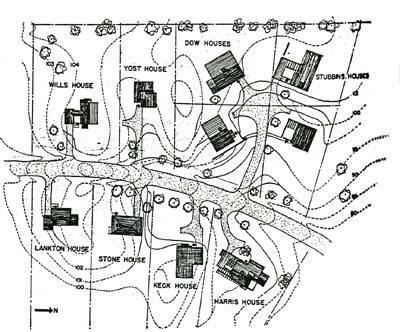 1949 - The William T. Grant Residence II,60 Field Point Circle, Greenwich CT. Commissioned 1948. 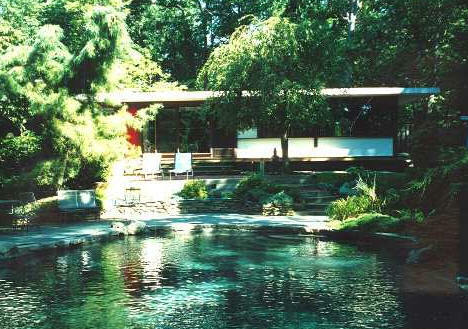 A. Lindquist was the landscape architect; Dan Cooper did the interiors. Stone did an an addition, middle photo. Sold to Richard and Jonathan Sackler. Sold to Stuart Baker and Leslie J. Schreyer. 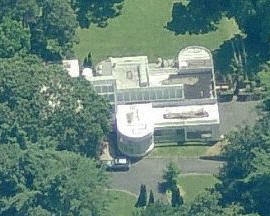 1949 - The Robert L. and Hermine Isaacs Popper Residence, 240 Rosedale Avenue, now Nikki Drive, White Plains NY. Commissioned 1948. Associates: Reese, Knowlton, Sloan & Holzinger. 4' grid; 3 x 4 posts; 2 x 10 tapered joists; flat roof; horizontal wood siding. 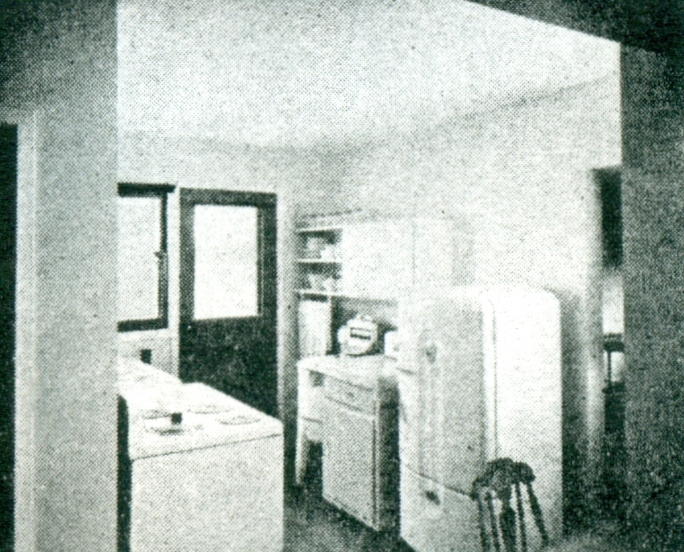 Featured in House and Garden Magazine, August 1951, see BW photos. Sold in the early 1980's to the Ehrlichs. 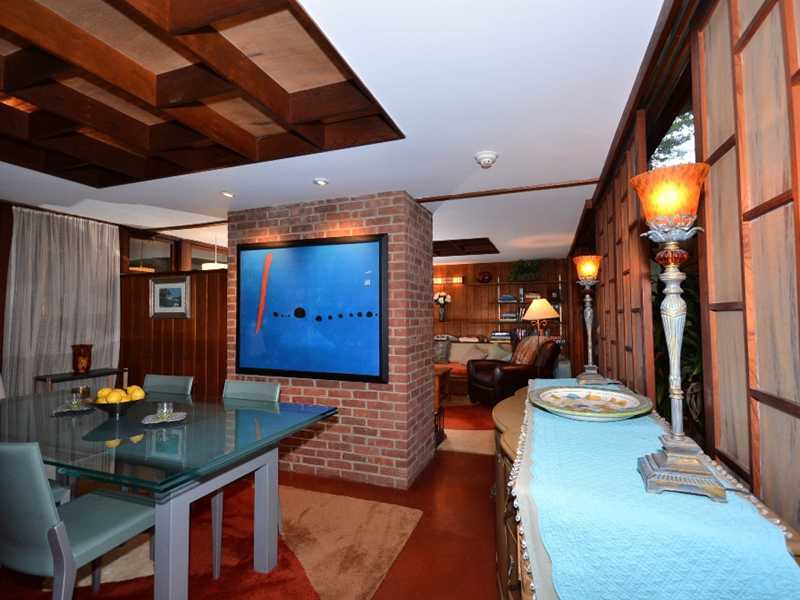 Sold to Michael and Lisa Spett, who added a 1998 second story by architect John McLean, color photos. 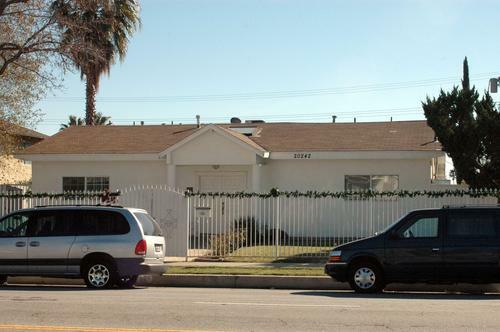 Sold in 2005 to Rosedale Properties LLC, a developer who put in a new cul de sac (Nikki Drive).The Popper House was destroyed in January 2007. Rosedale Properties started five new houses, four of which are still unfinished. You can see the foundations above, right. 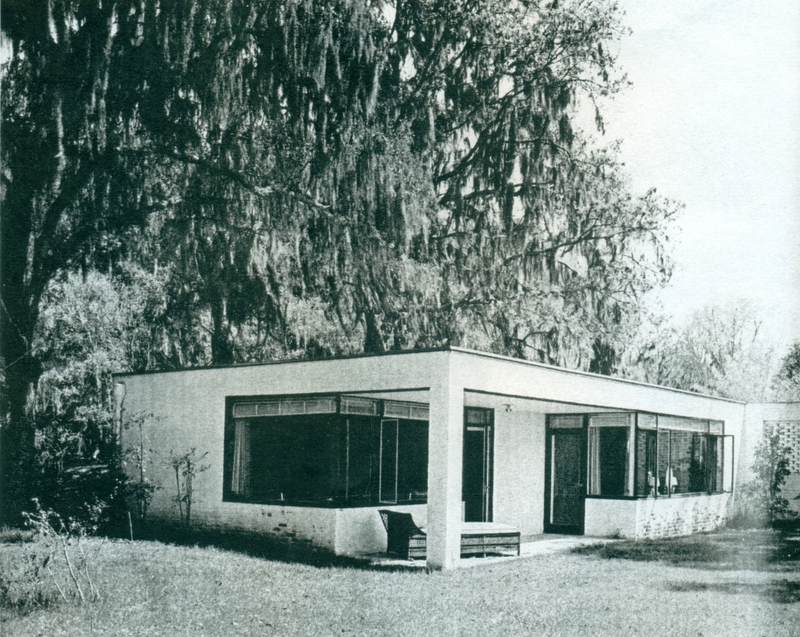 1949 - The M. LeGrand Residence, Montgomery AL. 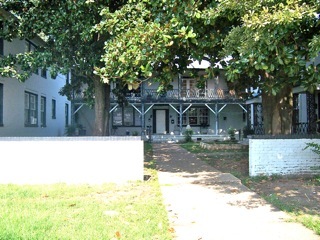 2-story, formal, somewhat modern version of Southern Colonial; free-standing brick columns; large hipped roof; some wrought iron; shutters. Unsure if built. 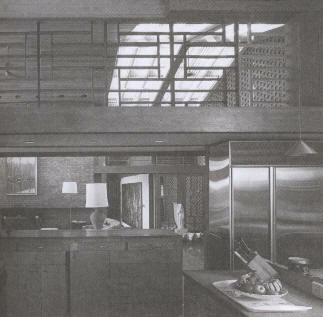 1949 - The Elwood Martz Residence, Great Hog Neck NY. Unsure if built. 1949 - The Bertram (Bert) N. Linder Residence, aka Hickory Hill Farm, West Main Street, Dalton PA. Commissioned 1948. Linder raised thoroughbred houses here. Destroyed. Bottom photo by Maynard Parker. 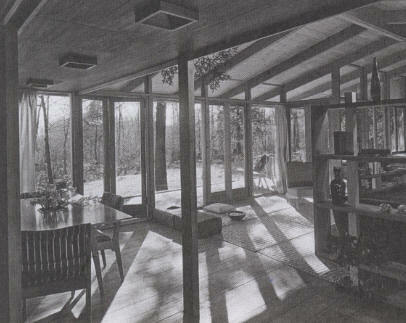 1949 - The Remy and Virginia Morosani Residence,164 Wigwam Road, Litchfield CT. Landscape Architect: Thomas D. Church. Appeared in House and Garden Magazine, February 1957. BW photos by Paul Rocheleau and Tom Leonard. 1949 - The Robbins Residence, Topeka KS. Associates: Reese, Knowlton, Sloan & Holzinger. 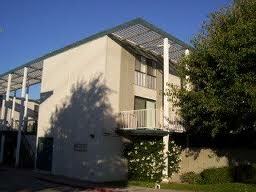 -story; wings similar to Linder Residence; several schemes. Unsure if built. 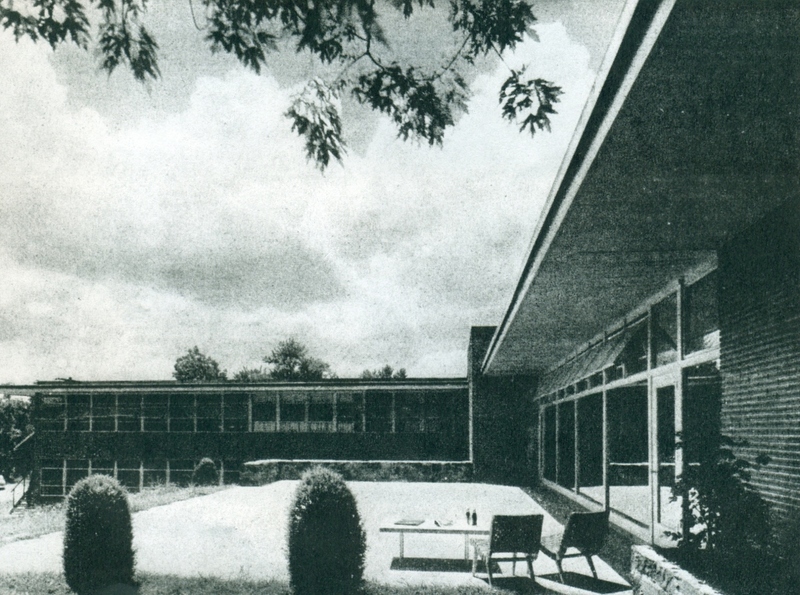 1950 - The George H. Hawks, Jr. Residence, 3211 East Avenue, Brighton NY. Commissioned 1947. Associates: Reese, Knowlton, Sloan & Holzinger. L-plan; open side on 4'-0" module of columns; low pitch roof; thin overhanging edges. Sold to Jane F. and William J. Napier. Sold to William W. and Beth Ann Napier. 1950 - The Murphy-Brinkworth, Inc. House, Broadlawn Harbor, Great Neck NY. Ordinary offset plan; horizontal drop siding; low-gable roof. Unsure if built. 1950 - The Allrich Harrison Residence, 185 Mine Hill Road, Fairfield CT. Winged plan; partial lower level; brick retaining walls. Sold around 1966 to Roderick McNeil II. Sold to Armand and Alberta Gilinsky. Sold in 2003 to Mine Hill Associates / G. Thomas Nettleton. Destroyed in 2004. 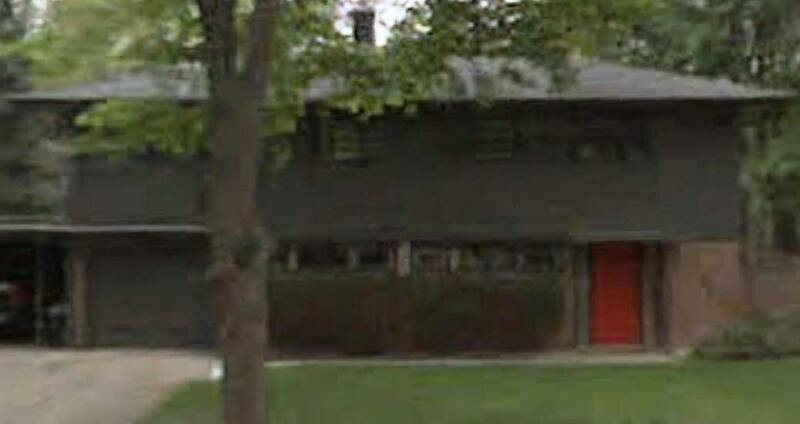 1950 - The William and Maria Thurnauer House,628 North Forest Drive, Teaneck NJ. Built by Murphy-Brinkworth Construction Company. Often listed as Englewood NJ, which is incorrect. Commissioned 1949.Associates: Holzinger & Johnson. Chosen from several Stone design schemes. The Thurnauers lived there for decades and landmarked the house in 1994. Sold in 2001 to Louis C. Walker II, who took the color photos. For sale in 2013-2014. 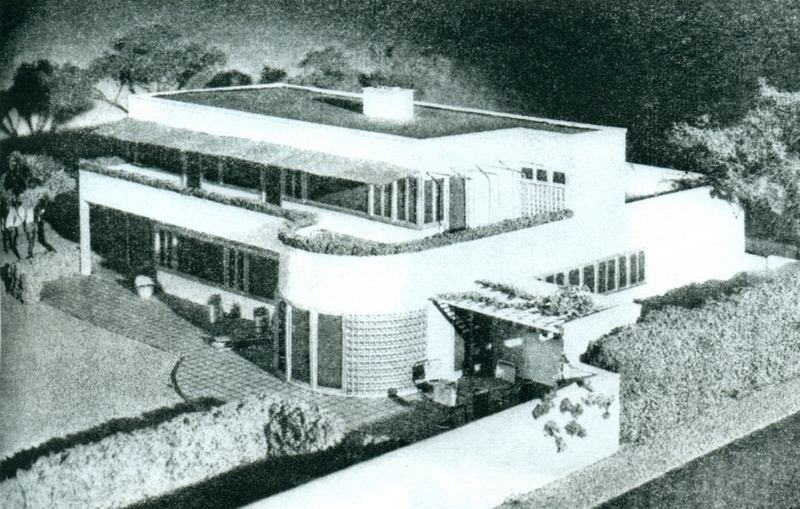 1950 - The Felix Smart Residence, 2 Elmwood Circle, Pine Bluff AR. Commissioned 1948. Designed with associate Karl Holzinger, Jr. When Smart died, his daughter Ethel Dunklin and her husband William moved in to be with Mrs. Smart. They eventually took title to the house. 1950 - The Willis Noll House,531 North Sequoyah, Fayetteville AR. Commissioned 1948. Noll never saw the completed house, he died while it was under construction. His widow married Herbert "Buck" Lewis and they lived there for 12 years. 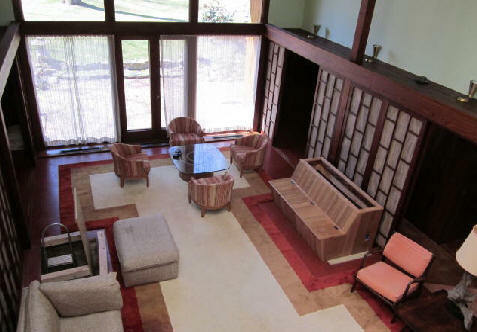 In 1960 the property was purchased by the University of Arkansas to be used as the Chancellor's house. 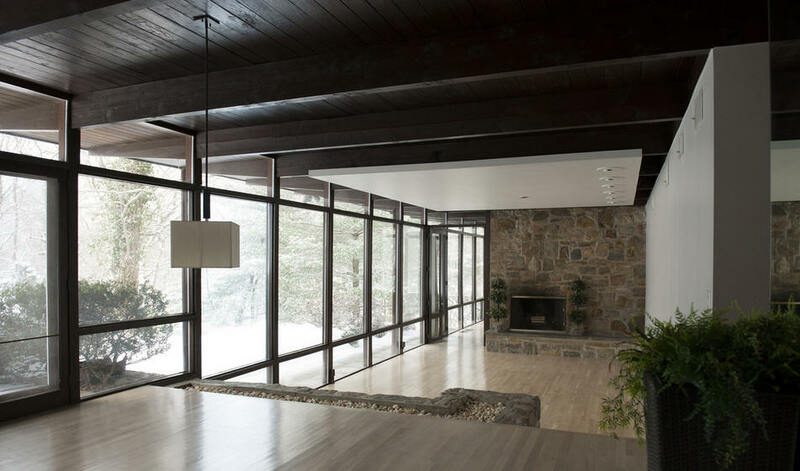 It was modified to its current form, which included finishing the basement and installing plate glass windows on the rear level, as well as replacing the accordion doors on the bedrooms with a solid wall. 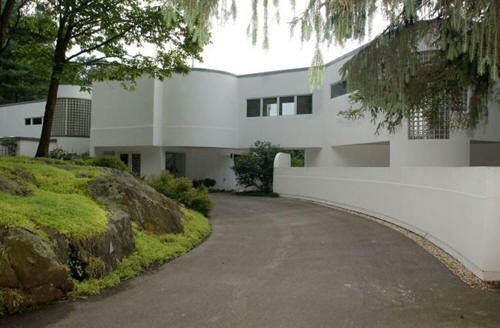 In the early 1990's the home was auctioned off and a new home designed by architect Fay Jones. Sold to Roy C. Hilligan. Listed on the National Register of Historic Places January 2005. 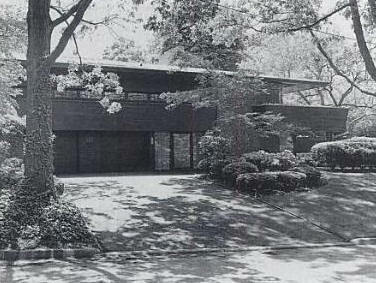 1950 - The Hugh Kaul Residence, Birmingham AL. Associates: Karl Holzinger, Jr., Lawrence S. Whitten. Unbuilt. Around 1950 - House in Harrison AR. 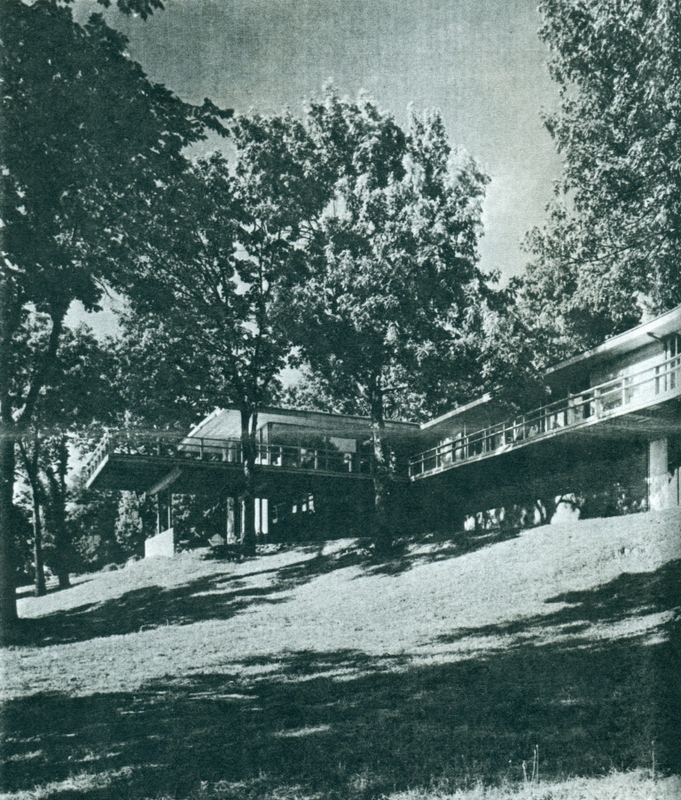 1950 - The Maxwell Lyons Residence, Pinnacle Point, Little Rock AR. 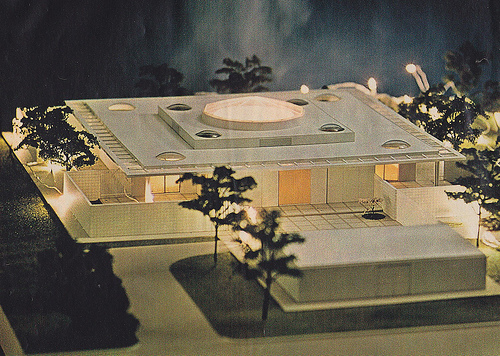 Associates: Karl Holzinger, Jr. Unbuilt. 1951 - The Dwight D. Eisenhower Farm, aka Gettysburg Farm, Gettysburg PA. Associates: Karl Holzinger, Jr. and John Sloan. Traditional compound of buildings. Unbuilt. The commission went toMilton Osbourne, a Penn State architect. 1950 - The James Layng Martine and Jean Martine Residence, 1177 Rock Rimmon Road, Stamford CT. Commissioned 1949. Associates: Reese, Knowlton, Sloan & Holzinger. On a hillside; the entrance was on the lower level. Radiant floor heating. 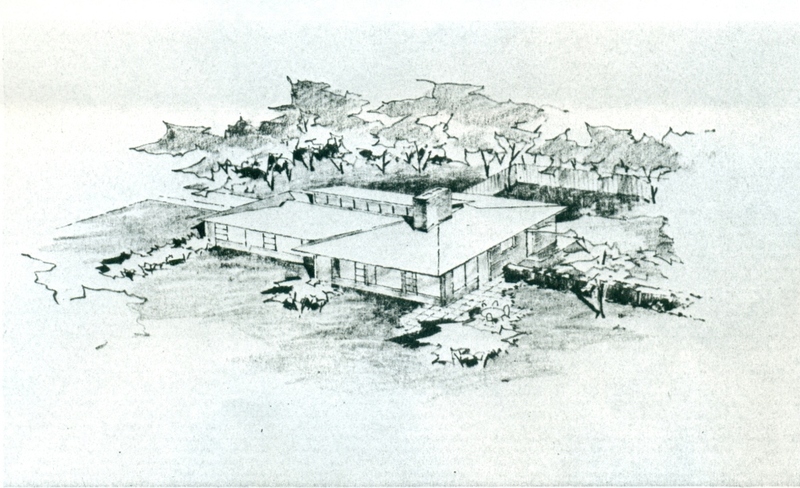 Marcel Breuer also designed a house for the Martines in 1946, but the couple did not like it and it was not built. Sold in 1961. Sold to Kenneth A. Hiller. Bottom photo by Layng Martine, Jr.
1951 - The Charles H. Francis House,4715 Trent River Drive, New Bern NC. 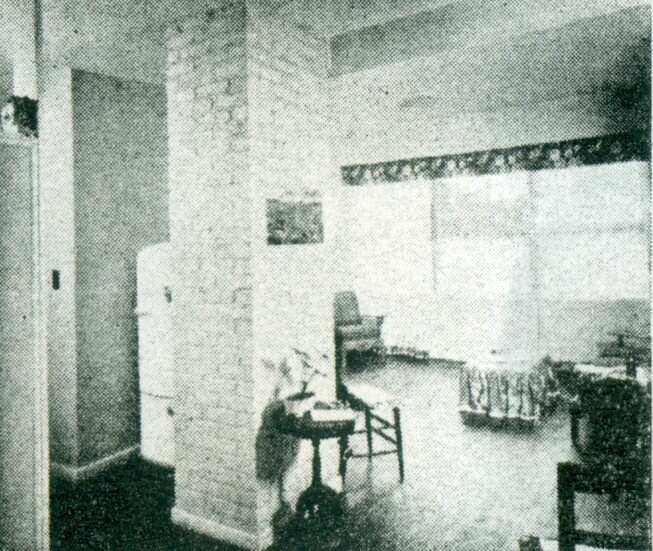 An example of the Ladies Home Journal Model Homes. 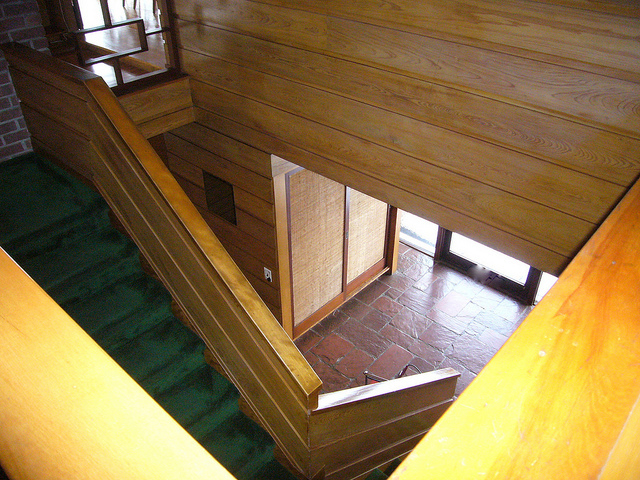 The owners added on 12' in length in the form of the original design and another bathroom. 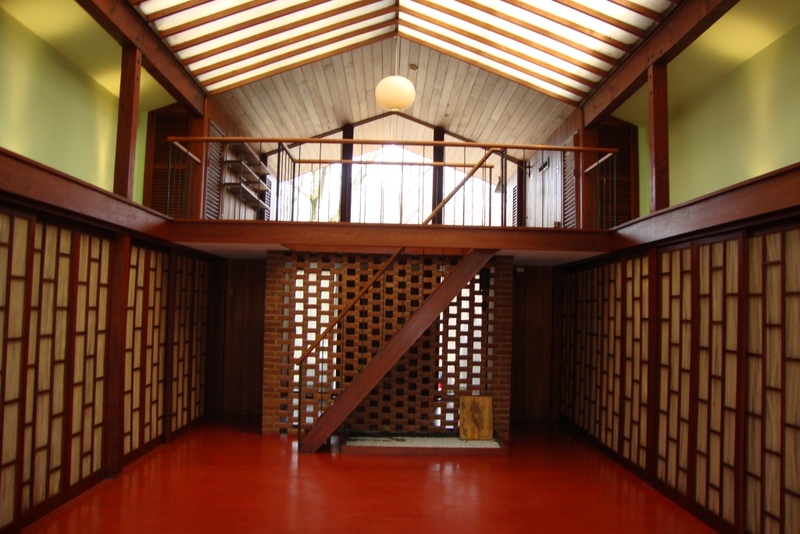 In the 1960's, the garage was converted to additional bedrooms. 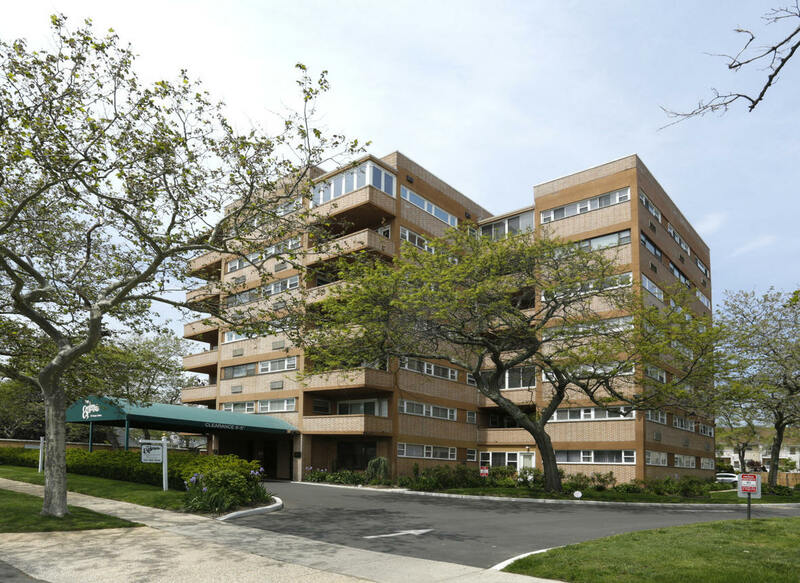 Sold to architect Charles H. Francis Jr.
1955 - The Genola Apartment Building, aka Sunset Terrace Apartments, Asbury Park NJ. 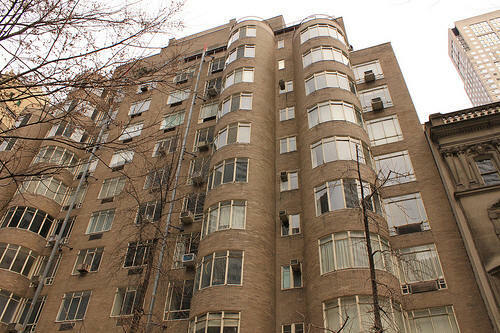 Converted to Esplanade Condominiums in 1981. Associates: Holzinger, Torkelsen & Flood. Originally was going to be 12 stories. Commissioned 1951. 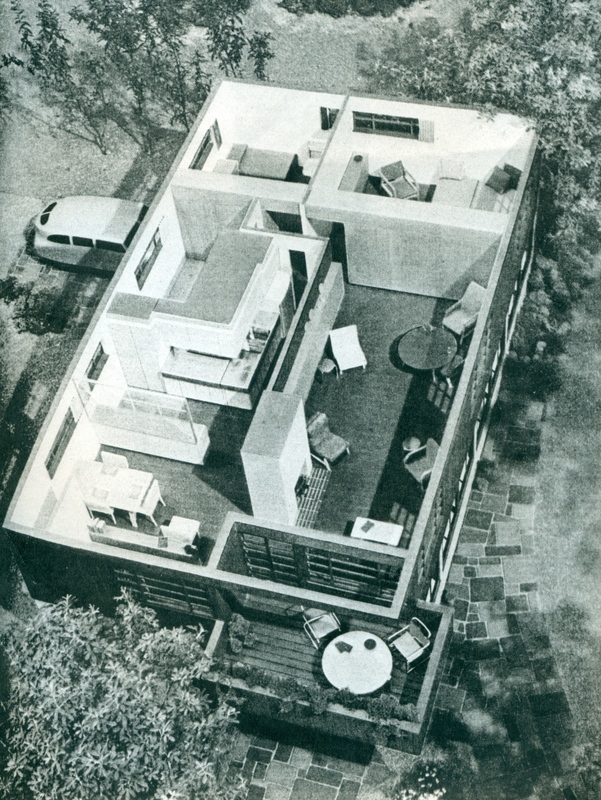 1952 - The E. W. Thomas Residence, Westport CT. Associates: Holzinger, Torkelson & Tuttle. 2-story; dug into hillside; horizontal wood siding; gable roof. Unsure if built; needs verification. 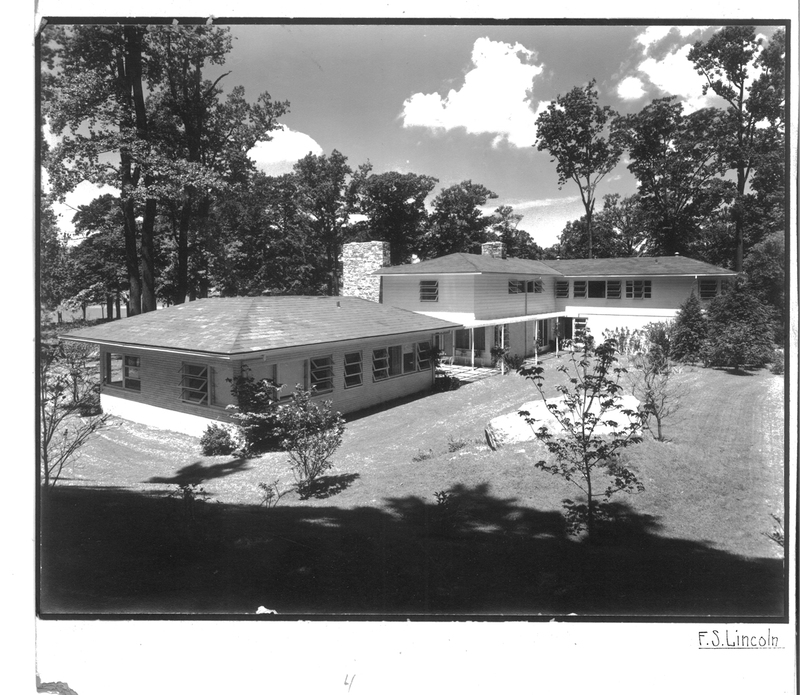 1952 - The John J. Rioux Residence, Woodcliff Lake NJ. Associate Lloyd Flood. 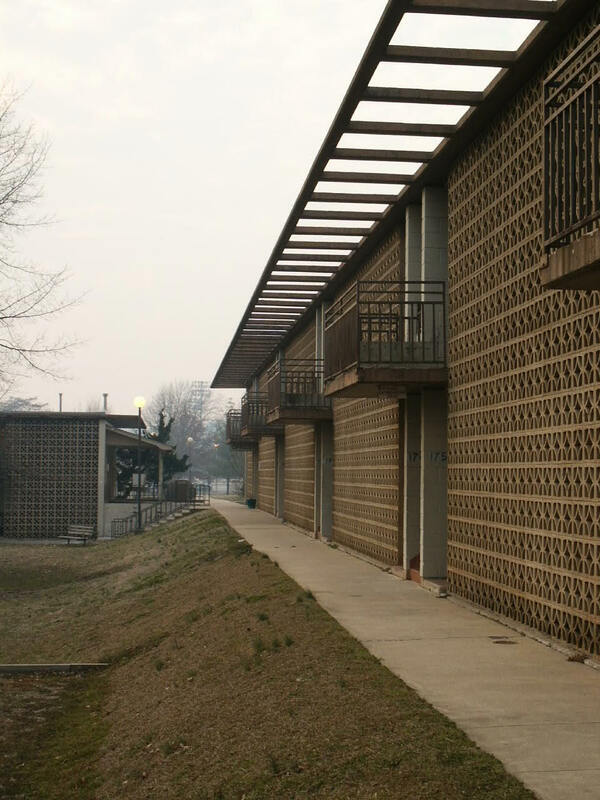 2-story; small; flat roof; brick masses; vertical wood siding; balcony with horizontal siding. Unsure if built. 1952 - The Harper Woodward Residence, 1 Boxwood Lane, Port Chester Village, Rye NY. Associate Karl Holzinger, Jr. Sold to Marion Waterston and Mitchell Friedman. Sold in 1995 to Malcolm Azia. Sold in 2013 to Erik and Jenifer Nates. Sold in 2017 to Irene Tam and Steven Guon. 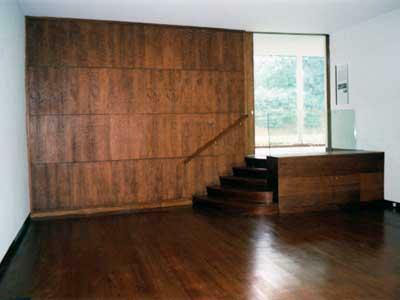 1952 - The Charles J. Frankel Residence, 2020 Spottswood Road, Charlottesville VA. Associates: Holzinger, Torkelsen & Tuttle. For sale in 2019. 1952 - Good Housekeeping Magazine, "House of the Fifties" Model Home. Unsure if built. 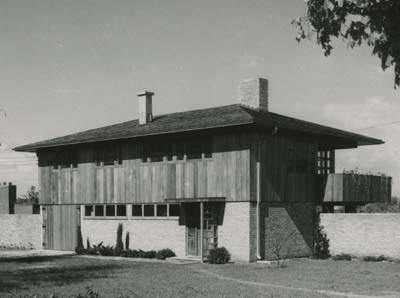 1952 - The I. H. Kempner Jr. House,3688 Willowick, Houston TX. Designed with Thomas E. Greacen II. Sold in 1986 to Mary Carroll Kempner. 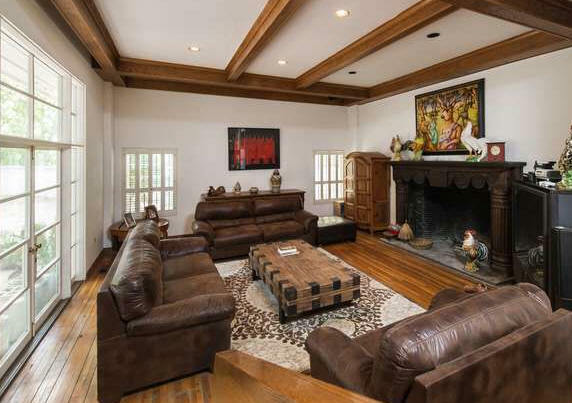 Sold in 1995 to I. H. Kempner III and Kempner Trust. Sold to the Sprague family. Destroyed in 2000 and replaced with a new huge house, bottom photo. 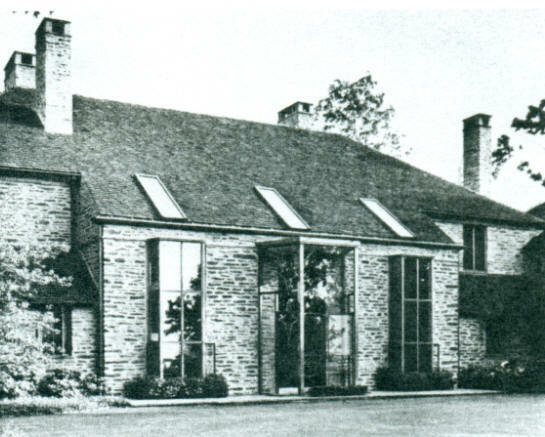 1953 - The Albert M. Greenfield Renovation, aka Chateau at Sugarloaf, 9220 Germantown Avenue, Chestnut Hill, Philadelphia PA. Commissioned 1951. Landscape Architect was Thomas D. Church. A barn, bottom photo, was made into a pool house. 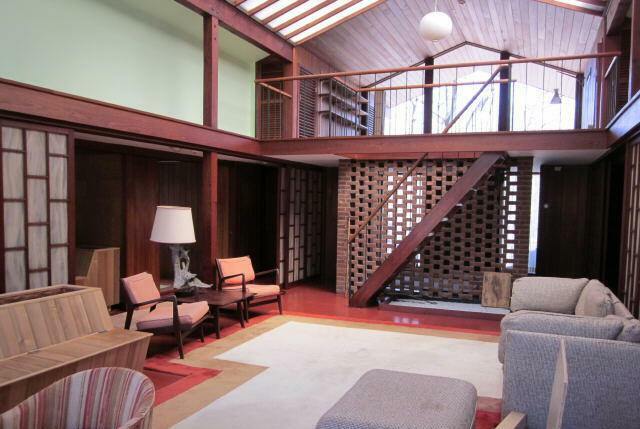 Sold in 1969 to Temple University as a conference center. Sold to Chestnut Hill College around 2007 and the facade was renovated back to its original 1920's appearance by Voith and Mactavish Architects. 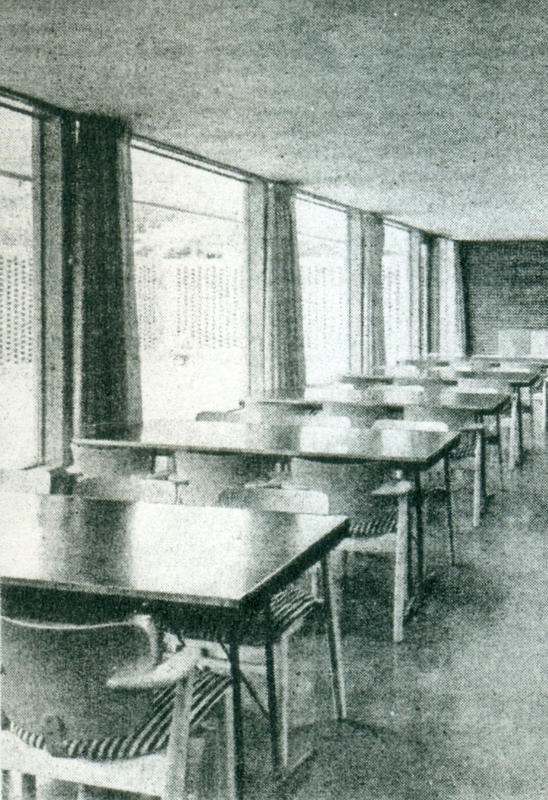 The pool house, once used as a motel for visitors, became a student lounge. 1951 - The Sigma Nu Fraternity House, University of Arkansas, Fayetteville AR. Additions in 1957 and 1991. Associate Ernest E. Jacks. Name changed to Phoenix House then Stone House. 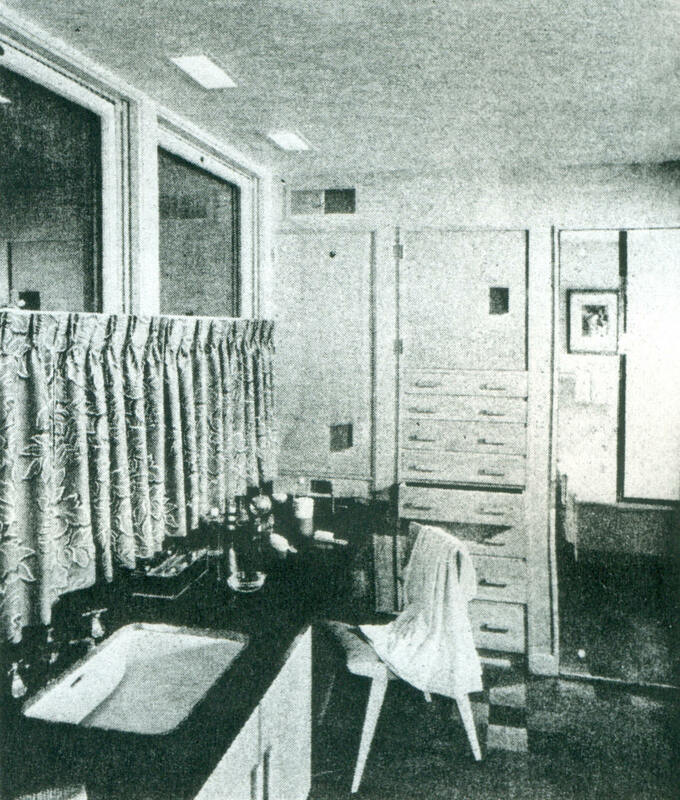 1953 - The Tile Council of America Model Bathroom. Published in House Beautiful Magazine in August and September. 1953 - The North Haven Shores Inc. 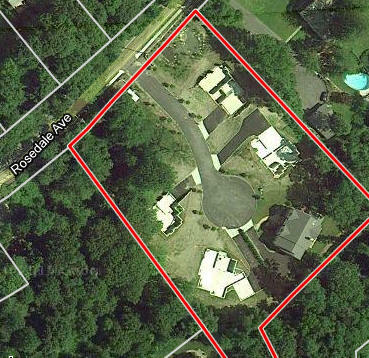 Residential Development, Suffolk County, North Haven NY. Associates: Torkelson & Hegardt. 55-lot development on Shelter Island Sound. Unsure if built. 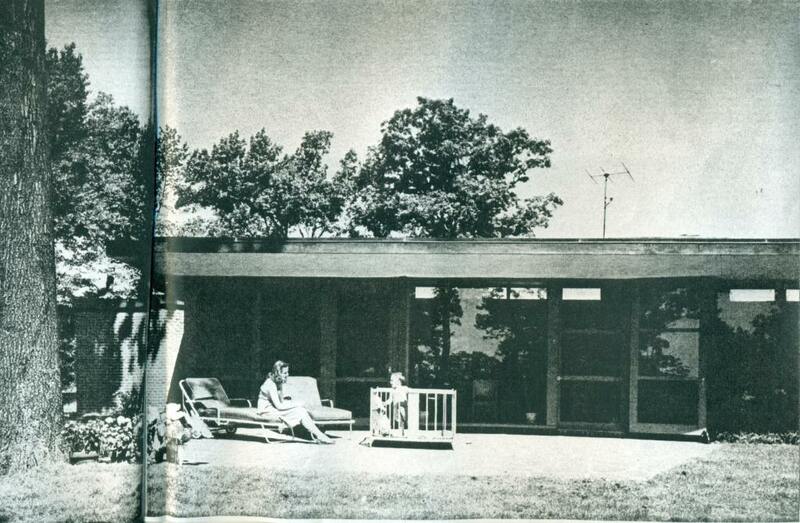 1953 - The Carney D. Matheson House,480 East Long Lake Road, Bloomfield Hills MI. Overlooks Vhay Lake. 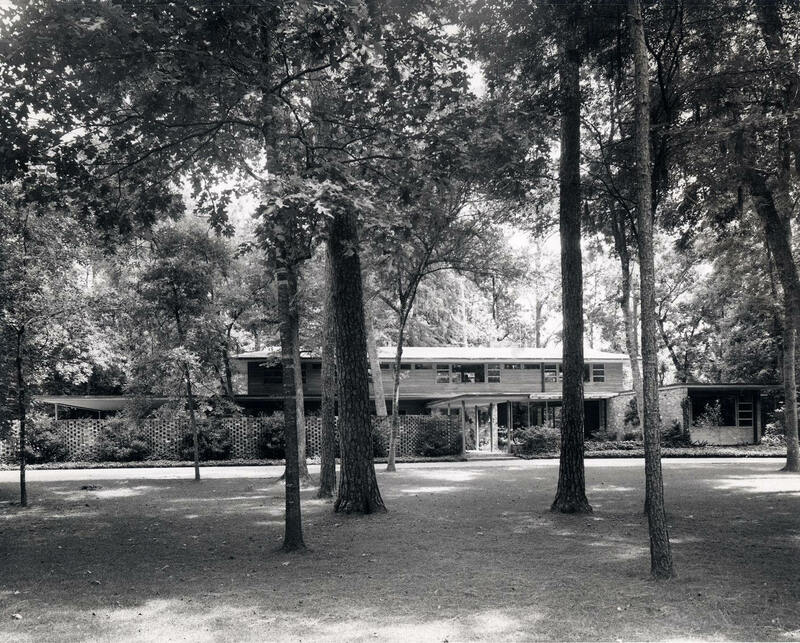 1953 - The Guilford Allen Robinson and Loretta Robinson House, Harrison AR. Associates: Torkelsen & Hegardt. The owner bought and dismantled a log cabin. 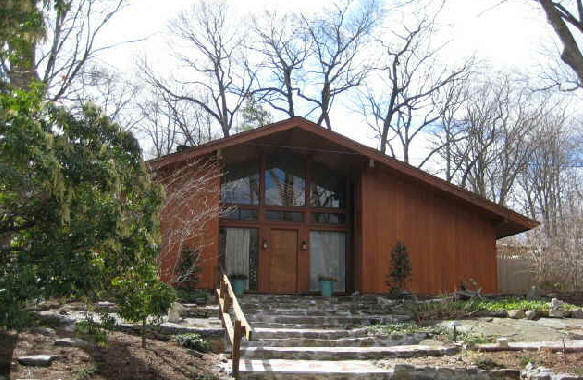 Stone designed this one using the same logs with two detached guest rooms connected to main house and carport with flat-roofed loggia. Address unknown; do you know where it is? 1953 - The Fred and Mary Eddy Jones Residence, 2400 NW Grand Boulevard, Nichols Hills OK. About 28 acres next to a country club. The landscape architect was Thomas D. Church. 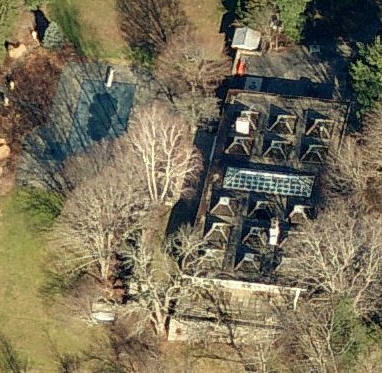 Fred Jones died and the property was transferred into an LLC controlled by Mary Eddy Jones. 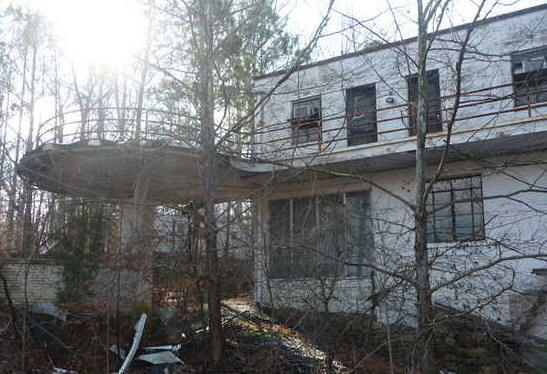 When she died in 2000, after trying for years to sell and preserve the house, the family foundation sold the acreage to 2400 Grand Boulevard LLC in 2003. The house was destroyed and land subdivided for more houses, bottom photo. 1953 - The Relman Morin and Dorothy Liebes Apartment Building and Penthouse Apartment, 116 East 66th Street, New York NY. Associates: Torkelsen and Hegardt. Unbuilt. 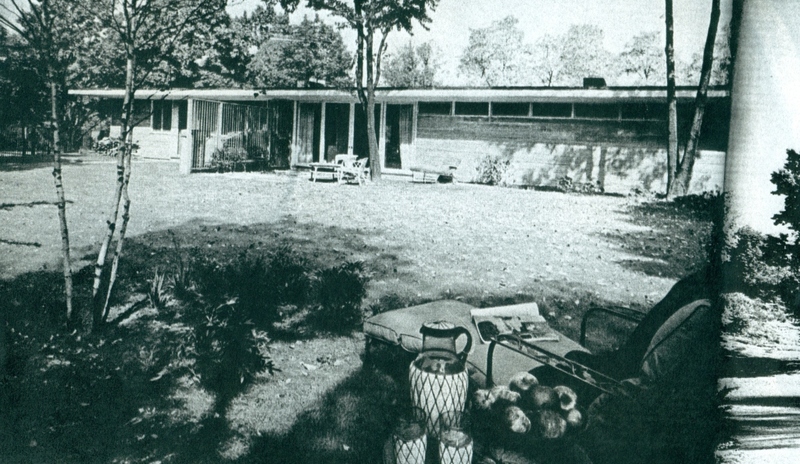 1954 - The Harold N. Rosenberg Residence,140 North Woodland Street, Englewood NJ. Commissioned 1950. 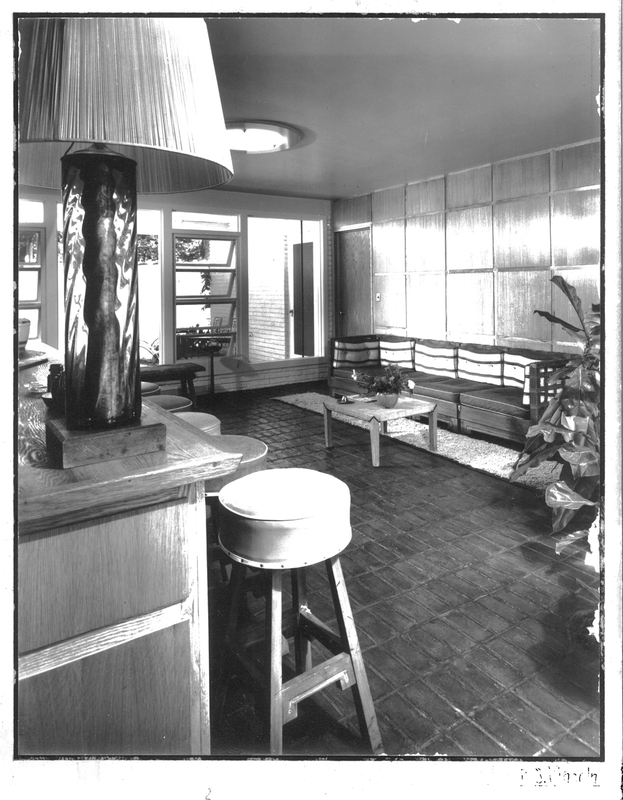 1954 - The P. J. Clark Residence Alterations, 3rd Avenue & 55th, New York NY, on the 4th floor of the Lavezzo Building. 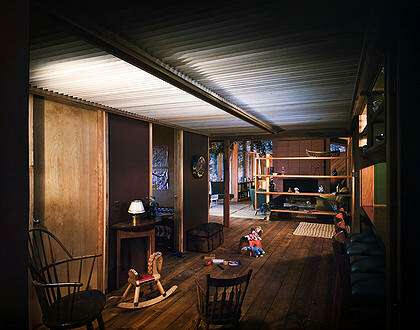 1954 - House in Montauk Point NY. Unbuilt. 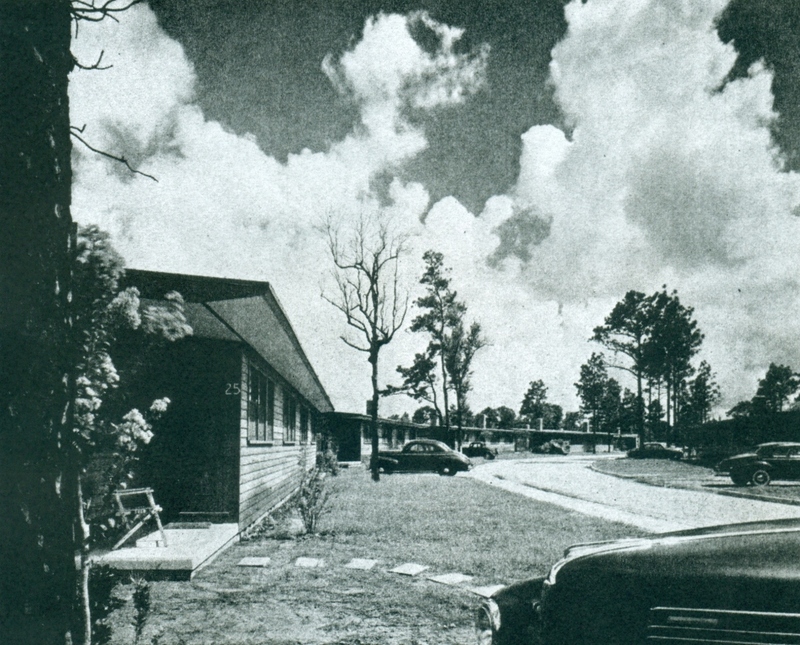 Published in the 1954 book Quality Budget Houses by Katherine Morrow Ford and James Creighton. 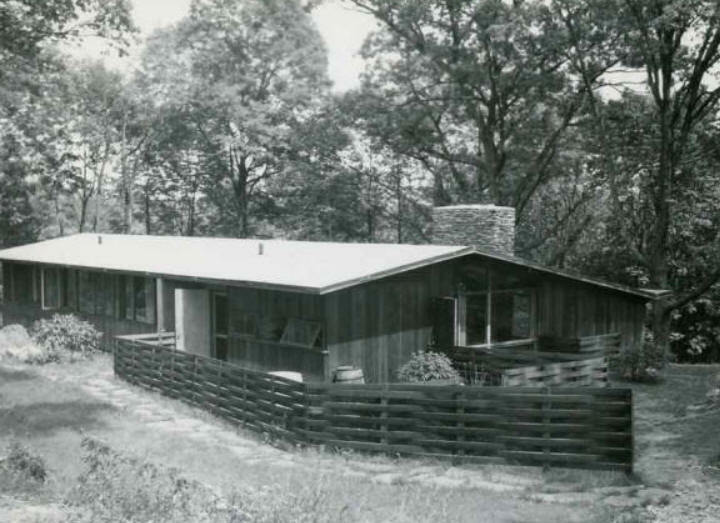 1954 - The Walter and Edith Johnson House, aka the Dogtrot House, 3 Dogwood Lane, Darien CT. Sold to Robert and Lee Buchanan in 1966. On the market 2013-2016. For sale as a teardown in 2016. 1955 - The Arthur Otis Residence,155 Cat Rock Road, Cos Cob CT. Commissioned 1953. Associates: Torkelsen & Hegardt. 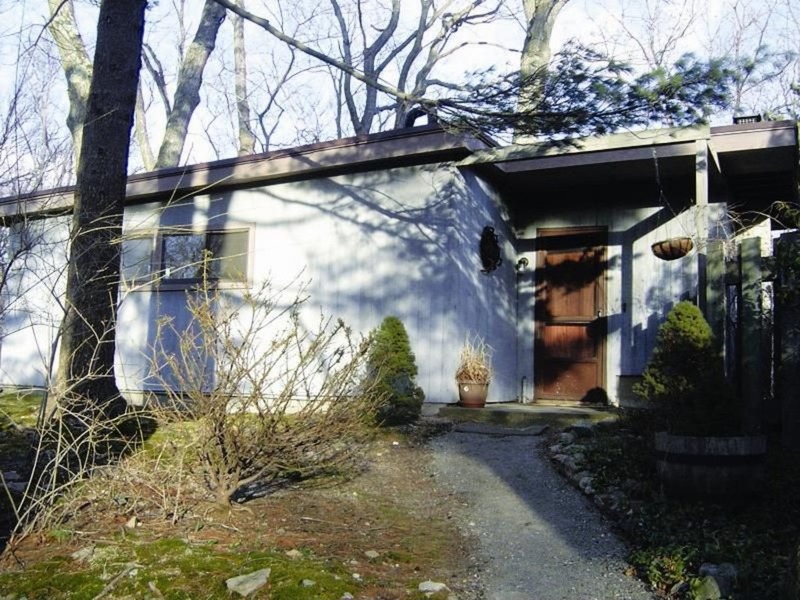 Sold in 1997 to John and Margaret Muchnicki. 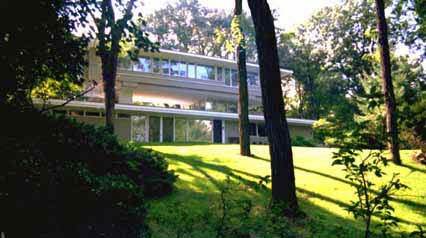 1955 - The Yager Residence, Montclair NJ. Associates: Torkelsen, Flood & Snibbe. Stone did schemes for them in June, December, and May 1956. Also April 1958. Forerunner of the Celanese, Hobbs, and Paterno houses. Unsure if built. 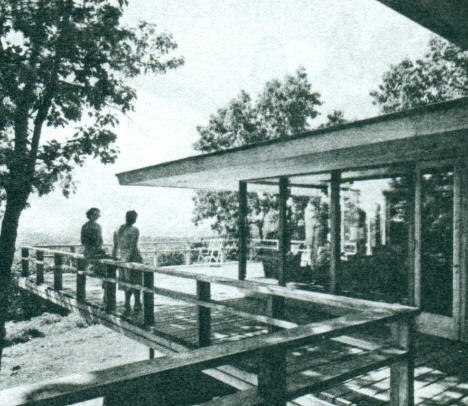 1956 - The Jay Lewis Residence,12 Fairview Drive, McGehee AR. Commissioned 1955. Site supervision by Erhart, Eichenbaum and Rauch, and later Ernest Jacks. The Lewis family lived there until 1978 when they moved to Bella Vista. Sold to the Pitmans. Vacant from 1984 to 1989. 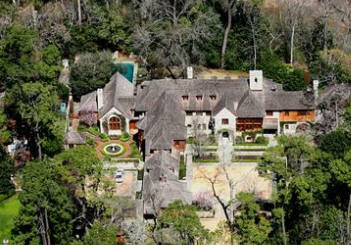 Sold in 1989 to Chris and Dwana Lee, who did a renovation including reconstructing a missing chimney. 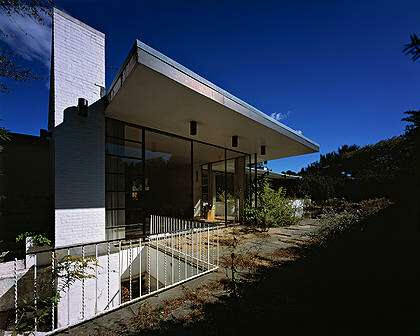 1956 - The Joseph Kastner Renovation, 199 River Road, Grand View-on-Hudson, Nyack NY. 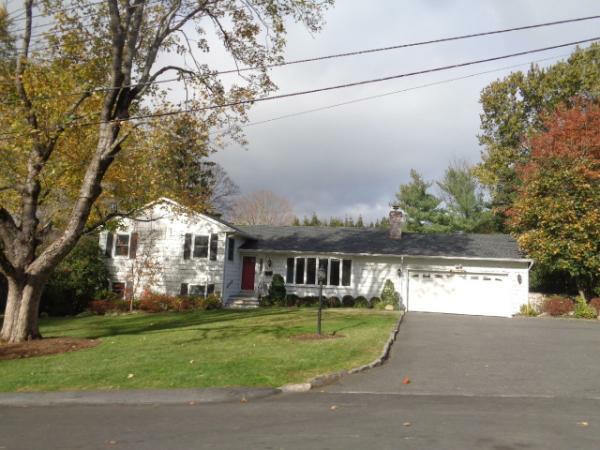 Sold in 2000 to Diane Tomasello-Smith. 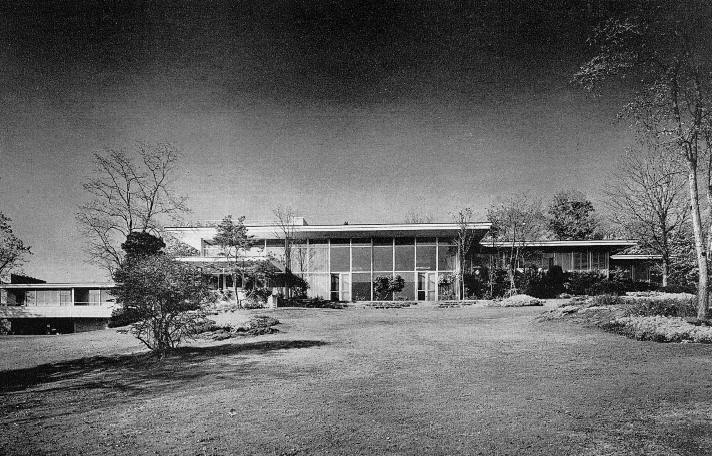 1956 - The James and Isa Kantor House, 260 South Road, Oyster Bay Cove NY. Two acres. Built on the grounds of the former Tiffany Family estate. Sold for the first time in 2012 to David and Alick Luckman. 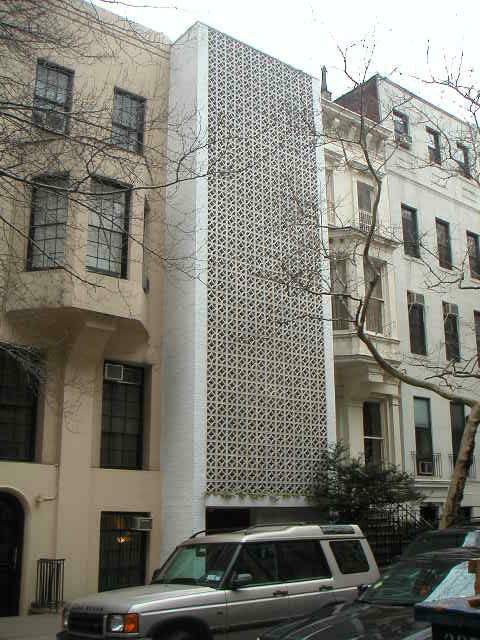 1956 - The Edward Durell Stone House, 130 East 64th Street,New York NY. In 1981 the house gained landmark protection as part of the Upper East Side Historic District.Whenthe white stone facade fell into disrepair, Stone's widow Maria Stone removed it in 1987 and two years later received a Landmarks Commission violation penalty. Unbeknownst to the Stone family, architect Robert A. M. Stern asked the Landmarks Commission to "rise above the inevitably changing winds of fashion... and preserve an important architect's ingenious, if controversial, solution to the problem of town house design." Stern's voice won out and the violation remained in effect. 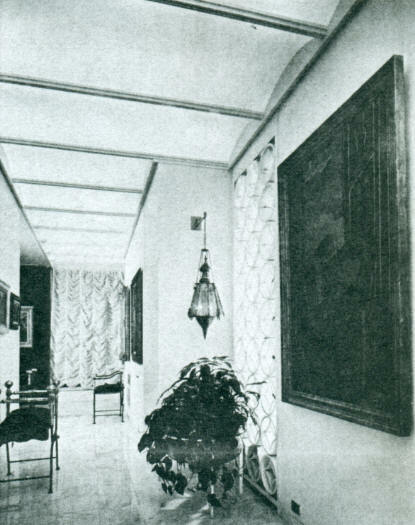 Maria Stone eventually agreed to rebuild the screen and her son, architect Hicks Stone, proposed several designs. However, the Commission wouldn't accept anything other than the reconstruction of the original, which was completed in 1999. 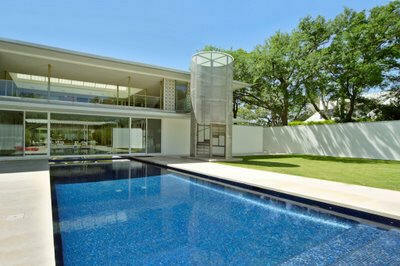 Sold in 2004 to Andrew Cogan who hired Stone's son Hicks Stone to do a renovation. In 2006 Cogan donated an easement to the Trust for Architectural Easements, protecting the exterior from future alteration. Sold in 2015 to Painted Bird LLC c/o Michael Stout. Became a gallery, Gladstone 64. 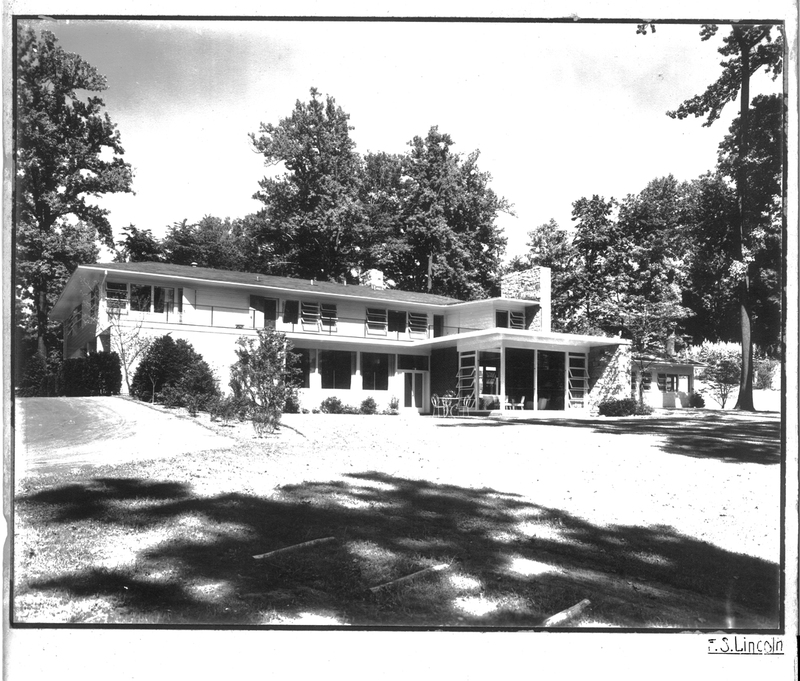 1957 - The Alpha Gamma Rho Fraternity House, University of Arkansas, Razorback Road, Fayetteville AR. Designed with associate Ernest E. Jacks. Unbuilt. The fraternity commissioned another architect. 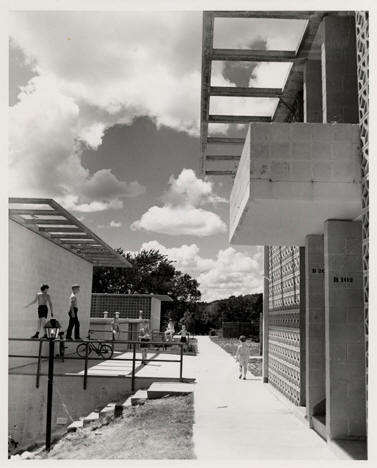 1957 - Married Student Housing (aka Carlson Terrace), University of Arkansas, Fayetteville AR. 200 units. Associate architect Ernest E. Jacks. Destroyed in 2001. 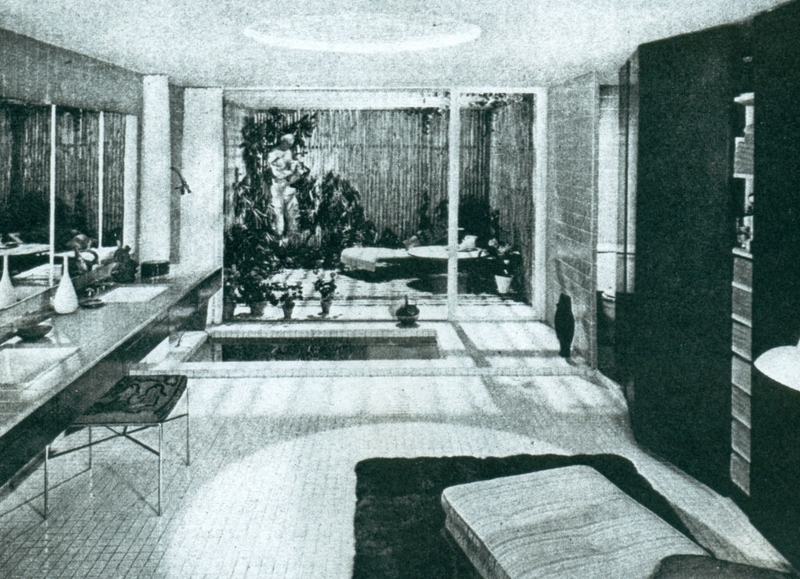 1957 - The Frederick Mann Residence, Rittenhouse Square, Philadelphia PA. 2nd floor of townhouse; open planning; court with pool; living; dining; kitchen. Unsure if built. 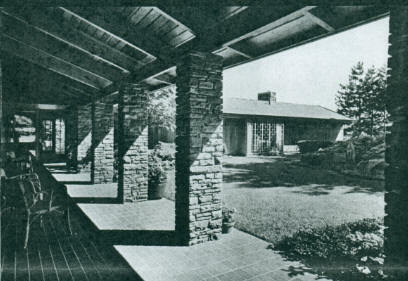 1958 - The Bruno and Josephine Graf House, aka Oak Court, 5243 Park Lane, Dallas TX. Commissioned 1957. Sold to Jan and Robert Crandall (former CEO of American Airlines) in 1991. Sold to John and Jennifer Eagle around 2003. 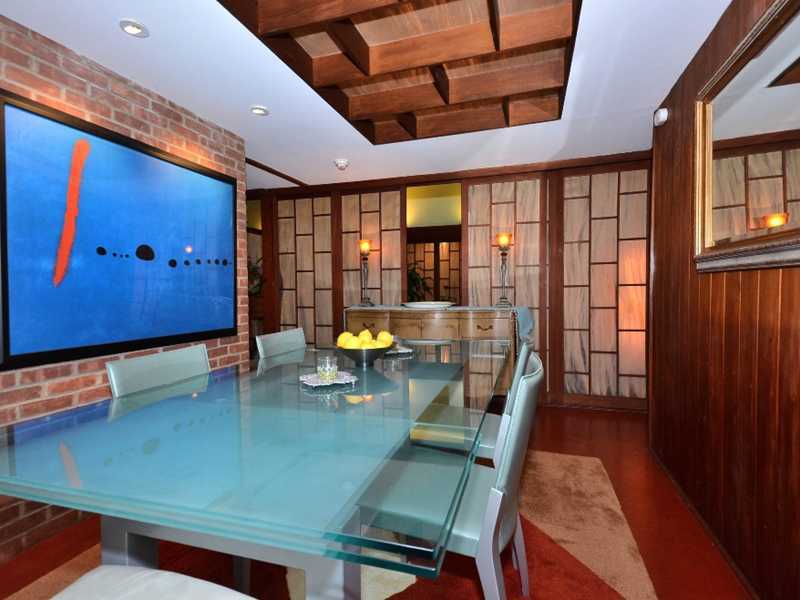 A 2007 renovation by Russell Buchanan reclaimed the pool and the floating dining room island plus added a stair tower. 1958 - The Life Magazine Model Row House, 20242 Lassen Street, Chatsworth CA. 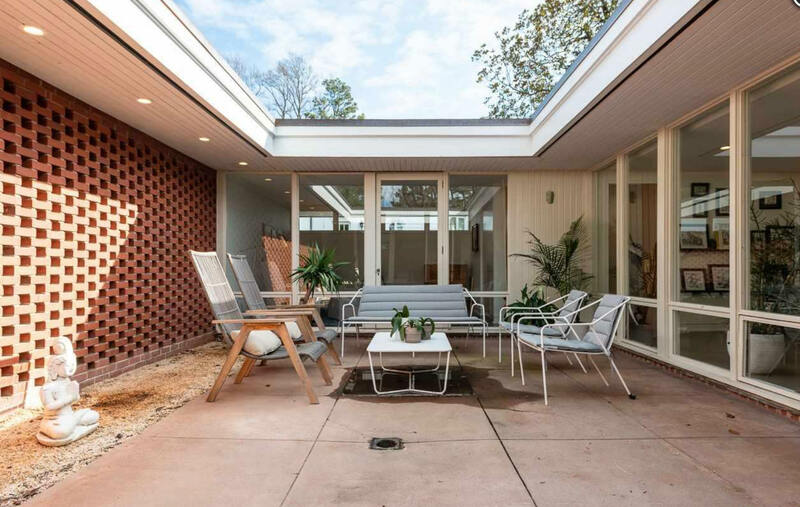 Demonstrating modern living, the three-bedroom, two-bath, 1440 sf building occupied a suburban tract and it offered something different for the suburbs. 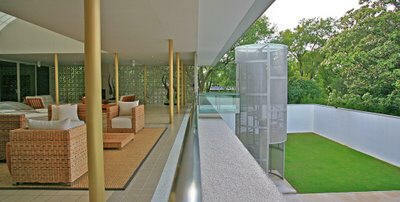 The plan included sliding glass doors from each room to a private patio. Sold in the 1970's to Charyn Kennedy. Sold to Ted and Hal Baranski. Sold in 1988 to TMC Exchange Service, which sold it immediately to Chi D. Ly. Sold to 1989 to Nadia and Kouros Ansari. 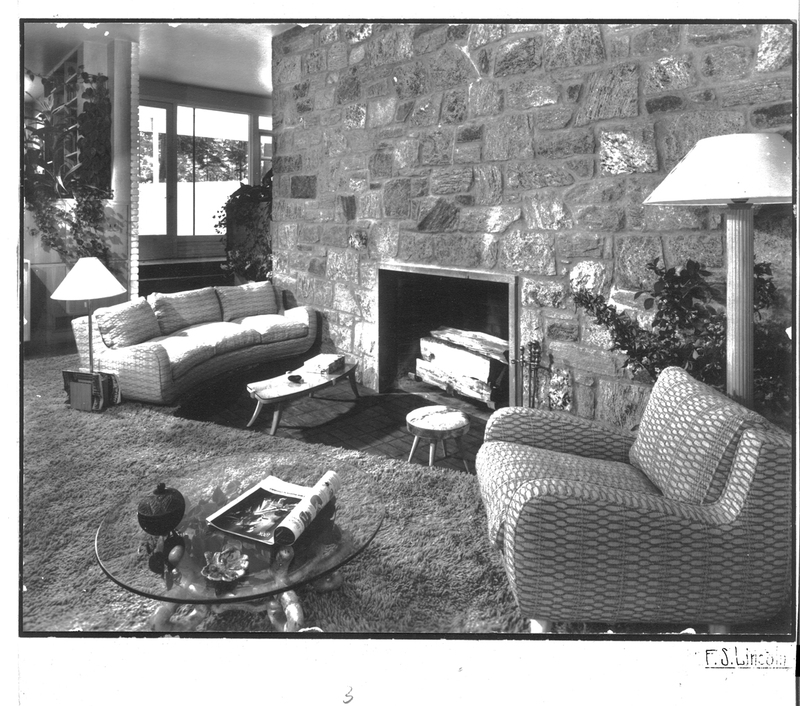 Around 1993, they altered the house and obliterated the modern Stone plan, bottom photo. B/W photo by Julius Shulman, bottom color by Jennifer Reiley. Sold in 2014 to Mike and Fariba Azad. 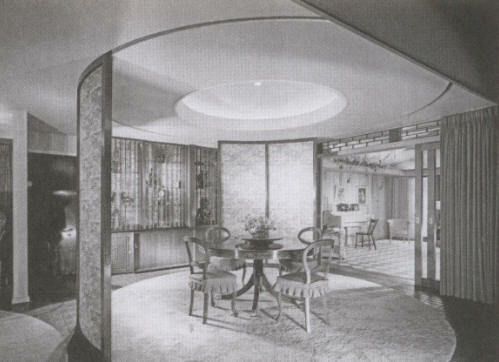 1959 - The Sam Spiegel Apartment,475 Park Avenue, New York NY. Commissioned 1958. Two stories. Spiegel was producer of movies such as Bridge Over the River Kwai. The apartment includes professional projection facilities. 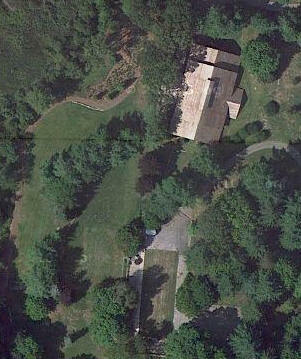 1959 - The Theordore D. Hobbs Residence, aka the Celanese House,565 Oenoke Ridge, New Canaan CT. Originally financed by the Celanese Corporation, then a maker of synthetic fibers, to showcase new materials and styles. They provided the materials in exchange for publicity rights. 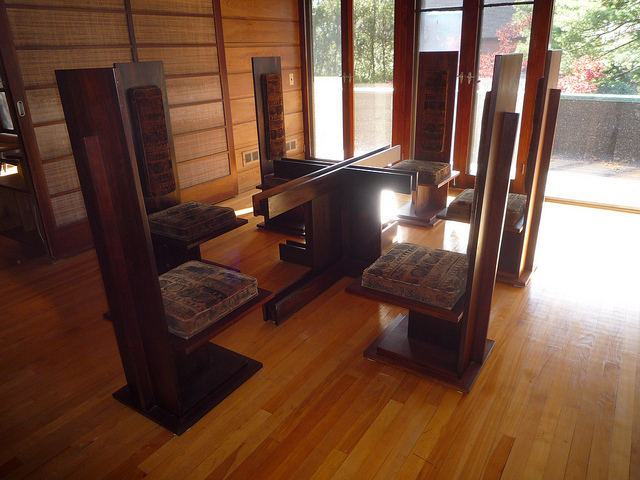 The furniture was by Edward Wormley. Built by the owner. Hobbs sold around 1965 to Frederick Willcox, an inventor, and his wife, Velma. After his death, Velma Willcox lived there until her death in 2005 at 102. Their daughter lived there for a year. 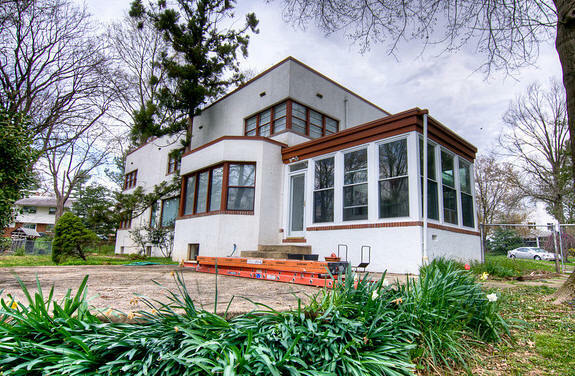 Sold in 2006 to Jackie and Bruce Capra who did a complete restoration, including a new roof, heating and AC, and a marble floor. 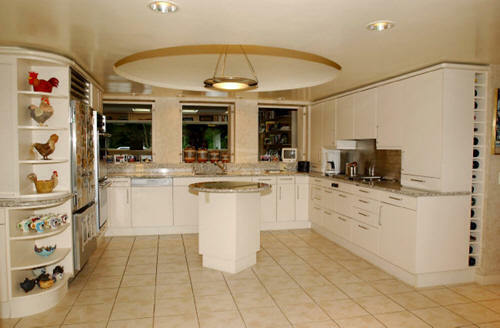 They also enclosed a 1000sf courtyard to create a large kitchen and turned the old kitchen into a master bath. Sold in 2008 to Joel Disend. 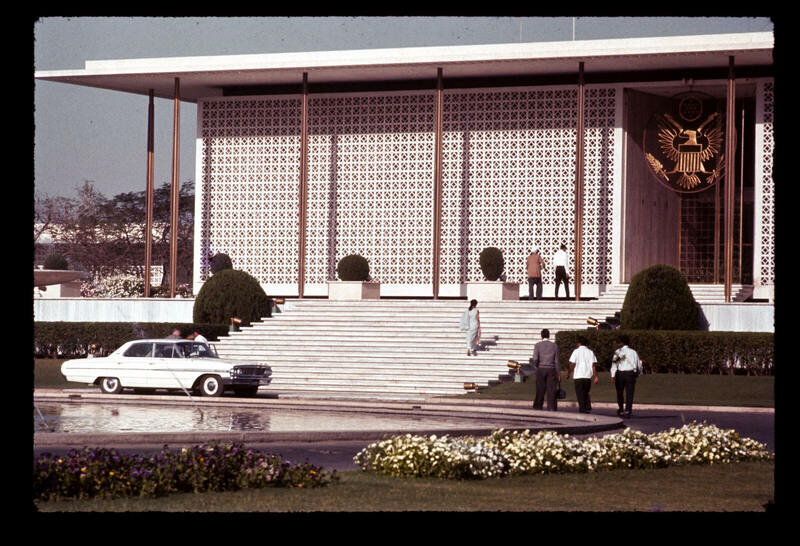 1959 - U.S. Embassy Ambassador's Residence, aka Roosevelt House, New Delhi, India. In 1956, Chief Justice of the United States Earl Warren laid the corner stone and expressed the hope that the structure would become a temple of peace. Video. 1961 - Rittenhouse Square Apartments, Philadelphia PA. Unbuilt. Apartments for the Elderly, Asheville NC. Unbuilt. 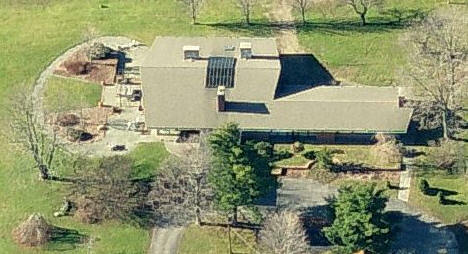 1962 - The Carlo M. Paterno House, aka The Atrium House, aka Meadow Lane Farm, 584 Grant Road, North Salem NY. 20 acres. Commissioned 1959. 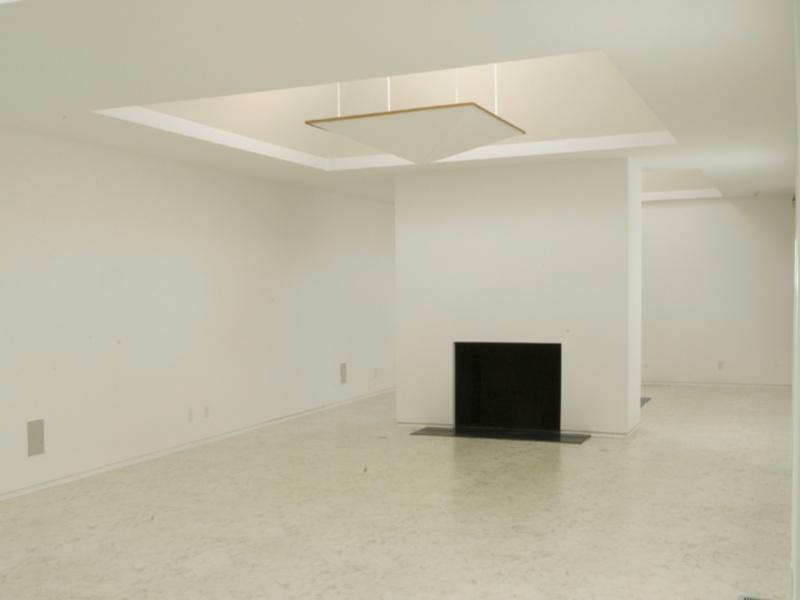 Very similar to the Celanese House. Henry Gorlin was the structural engineer. Harold Hecht was the mechanical engineer. Built by Theodore D. Hobbs. 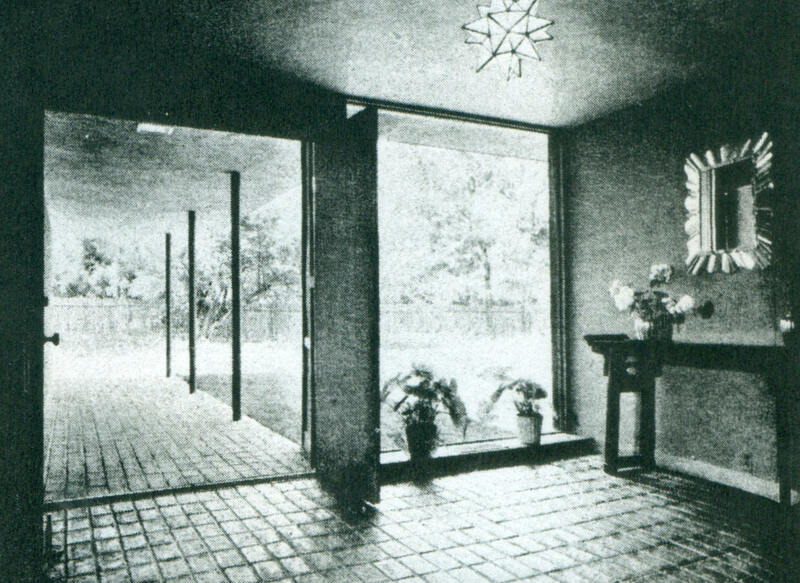 B/W photos from Architectural Record, 1962. Sold around 2007. As of around 2010, the house and pool were still there (bottom photo left) The new owners later destroyed the house and filled in the pool (bottom photo right) and built a large structure to the north. 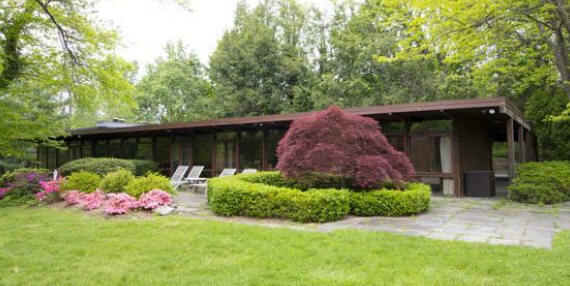 1962 - The Murray Gordon House, 110 Anchorage Road, Hewlitt Bay Park NY. Gordon died in 1995. Photos by Ezra Stoller/ESTO. Destroyed around 1997 and a new house built on the site. 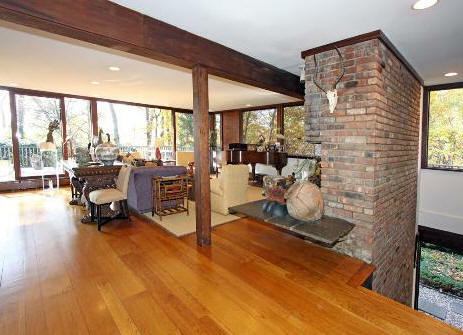 1962 - The Victor Borge House Renovation, 112 Field Point Circle, Greenwich CT. 4 acres. The original house was built in 1909 and designed by Sillsbee of Chicago. The project architect was Firoz Mistry. Sold in June 2007 and destroyed. 1962 - The Holvan Developments Apartments, Albuquerque NM. Unbuilt. 1963 - Apartment Hotel, Christiansted, St. Croix USVI. Unbuilt. 1963 - The Lumberman's Company Office Apartment Tower, Austin TX. Associates: Fehr and Granger. "The Westgate" apartment tower was over parking and offices. Unsure if built. 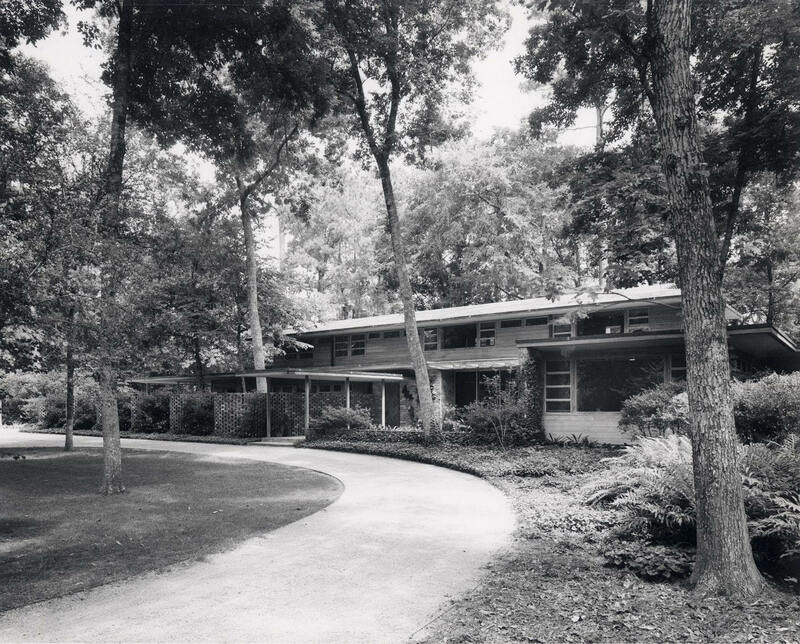 1964 - The Harvie and Margaret Branscomb Residence, 1620 Chickering Road, Nashville TN. 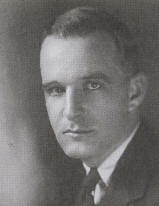 Branscomb was Chancellor of Vanderbilt University 1946-1963. 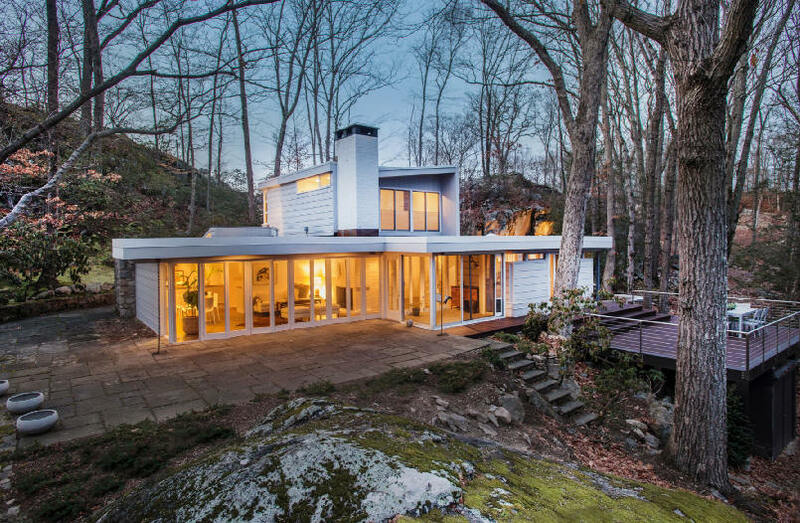 Stone offered to design the house without being asked, and Branscomb accepted. Commissioned 1961. 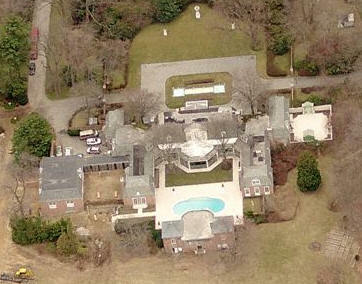 Sold in 2001 to Mary Louise A. LeBlanc who destroyed the Stone house and built the above estate in 2004. 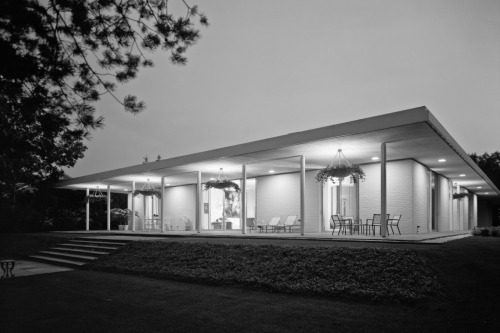 1964 - The William J. Levitt Residence, aka La Colline, Mill Neck NY. Stone called it a "Modern French Provincial extravaganza." On 68 acres, the land has since been subdivided. 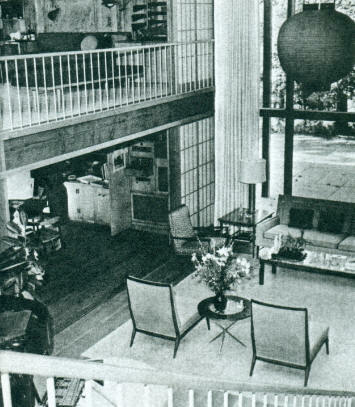 1964 - The Spyros Skouros Residence, Greenwich CT. Skouros was head of 20th Century Fox studios. 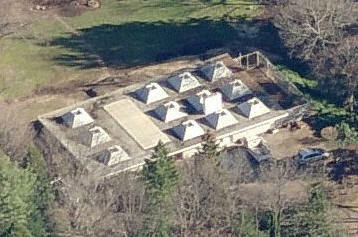 3 hexagonal pavilions. Unsure if built. 1964 - The World's Fair House, aka House of Good Taste, New York NY. 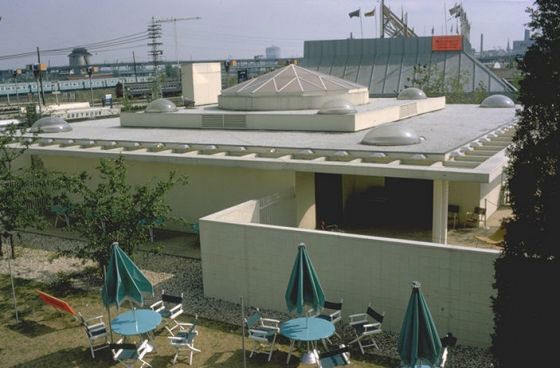 Built as part of the House of Good Taste Pavilion at the 1964 World's Fair. 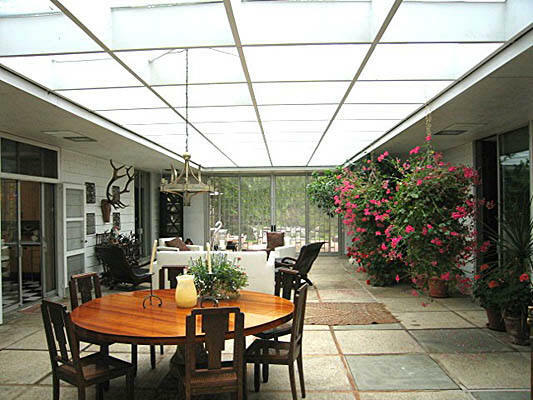 The home centers around a spacious atrium, 1026 sf with a 22-foot faceted glass dome and a 6-foot circular reflecting pool. 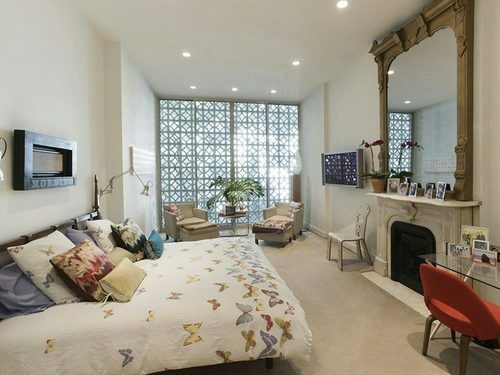 Furnished by decorators Sarah Hunter Kelly and Esther Willcox; landscaped for minimum maintenance by Clarke & Rapuano. 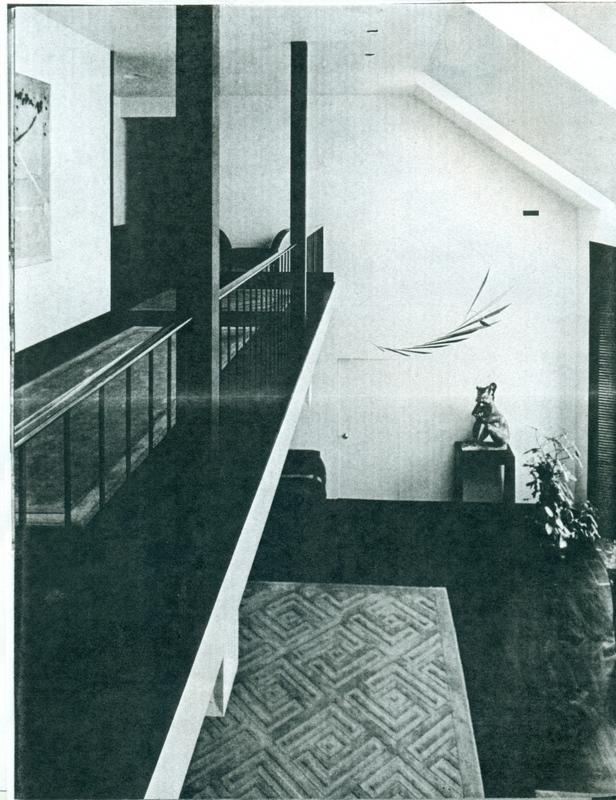 Featured in Better Homes and Gardens September 1964. Plans were sold for $1000/set. Not sure what happened to the house after the Fair...it was disassembled, but was it moved, or destroyed? Do you know? 1965 - aka House of Good Taste, 12713 St. Andrews Terrace, Oklahoma City OK. Built by Stanley Brown and Homes of Prestige Inc from the Better Homes and Gardens plans, above. Sold in 1989 to Cherie Norvell. Sold to Mike and Lindsey Deatsch in 2014. Photos by Mike Deatsch. 1964 - The Foster City Apartments, aka the Admiralty Apartments, corner of Hillsdale Boulevard and Foster City Boulevard, Foster City CA. 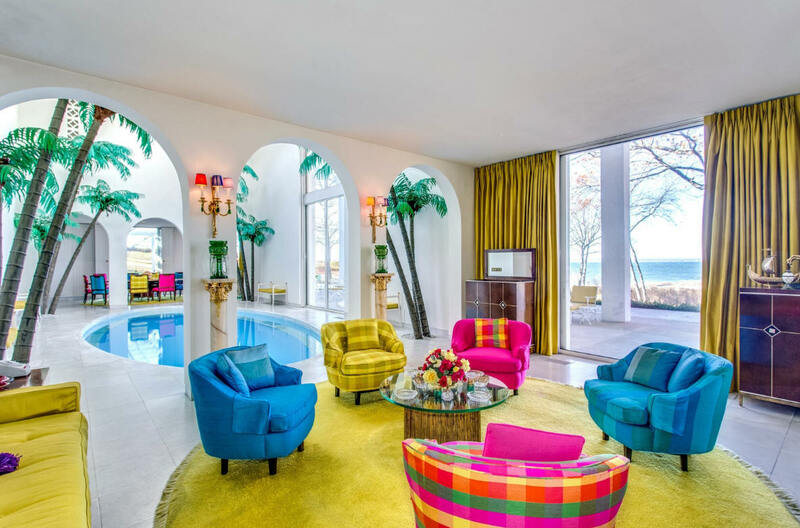 Landscape Architect was Edward Durell Stone, Jr. The units are now condos. Most have huge private decks. 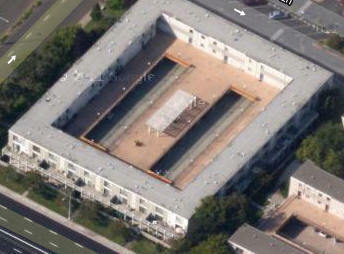 Similarly designed buildings were built next door: the Sandpiper and the Sandcastle Apartments. 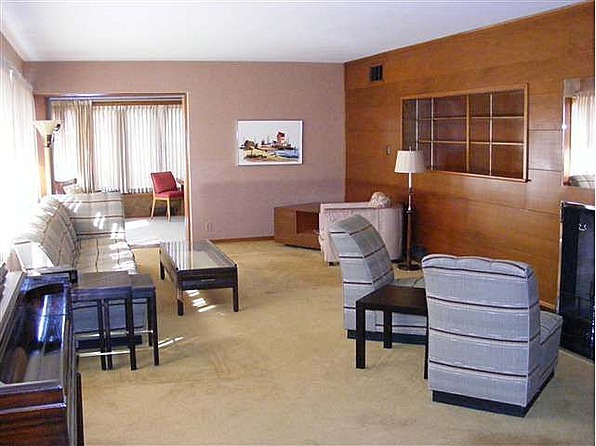 1964 - The Milton Point Apartments, Rye NY. Associate William Lescaze. 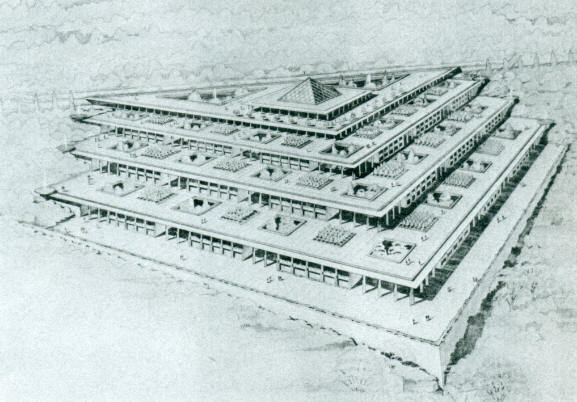 Complex of 2-story duplex buildings and 4-story group of central buildings; circular siting scheme; flat concrete roof with brick elements. Unsure if built. 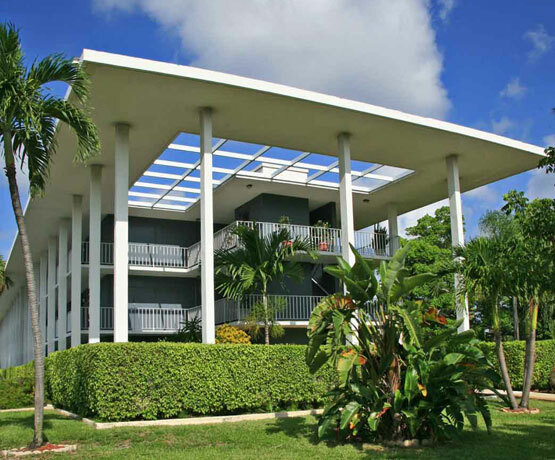 1965 - The Koff Apartments, aka the Deerfield Park Condominiums, 777 Southeast 2nd Avenue, Deerfield Beach FL. Associate Richard W. Dodge. 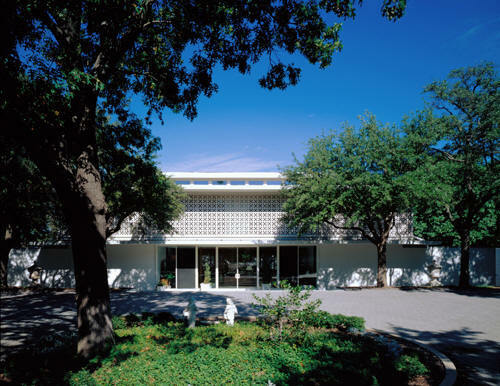 Landscape architect was Edward Durell Stone, Jr. Commissioned 1964. 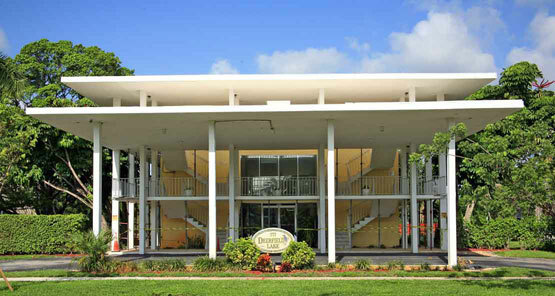 1964 - The 400 South Ocean Boulevard Apartments, 400 South Ocean Boulevard, West Palm Beach FL. 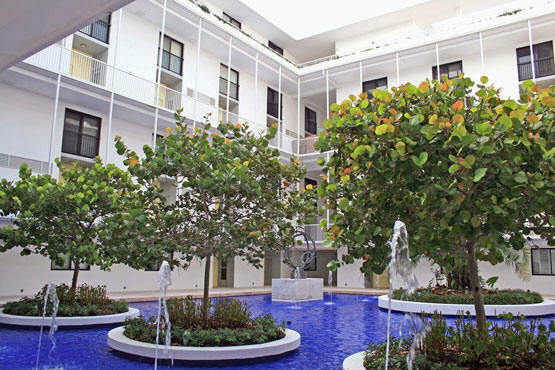 Known as the first incorporated condominium in Palm Beach and Florida. Stone kept a unit in the building for many years. BW photos by Ezra Stoller/ESTO. 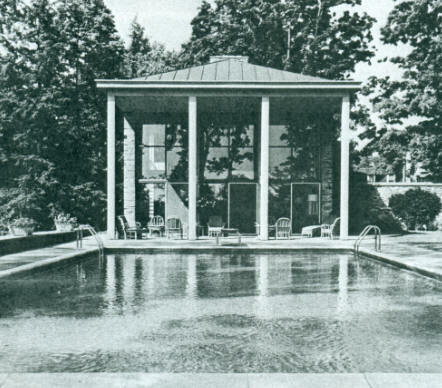 1967 - The Baron and Baroness von Langendorff House, aka the Gabrielle Lagerwall House, aka Villa Rielle, aka Villa Riele,32 Watch Way, Riele Woods, Lloyd Harbor NY. 30+ acres. Has an indoor pool. B/W photos by Ezra Stoller/ESTO. For sale 2016-2018. 1968 - The Peabody Institute, Residence Hall and Unger Lounge, The Johns Hopkins University, 1 East Mount Vernon Place, Baltimore MD. Two towers connected at the plaza level by the dining hall. 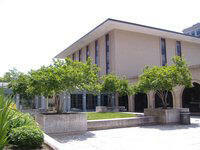 Constructed in 1968, the towers have large, fully furnished, air-conditioned rooms which accommodate 188 students. 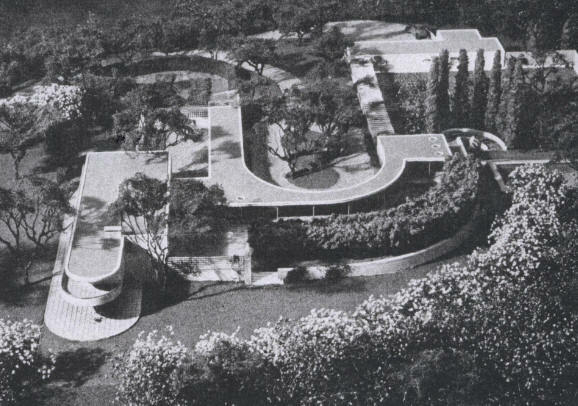 1966 - The Henry R. Luce House, Kalaha area of Oahu, Hawaii. Three large hipped roofs; skylight at apex. Unbuilt. 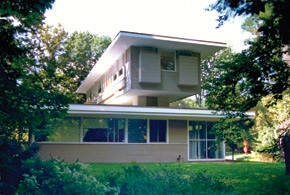 The Luce's hired Hawai'i architect Vladimir Ossipoff later that year - that house was built and still stood as of 2000. 1969 - Apartments, West Palm Beach FL. Unbuilt. 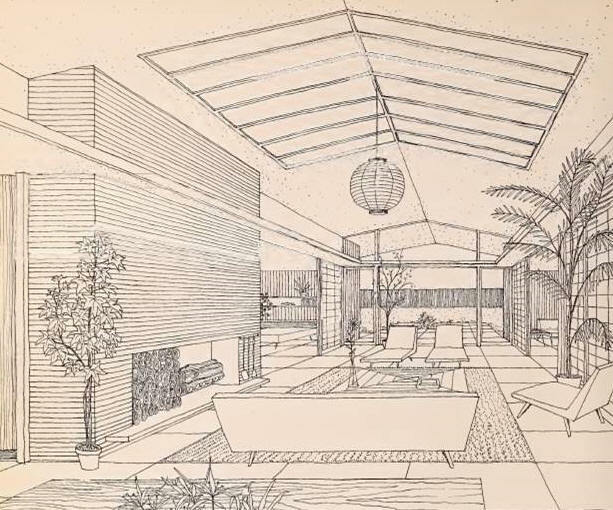 1969 - Operation Breakthrough Prefabricated Home Competition. 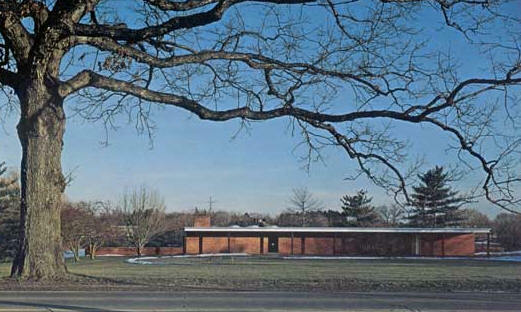 Landscape Architect was Edward Durell Stone, Jr. Unbuilt. The U.S. Department of Housing and Urban Development sponsored Operation Breakthrough, which advocated the use of factory-based industrialization and mass production in the national home-building industry to drive down costs and make housing more affordable. Unfortunately, Operation Breakthrough went nowhere and the entrenched method of site-building homes remained in place. There were 22 winning proposals, including Stone's. According to son Hicks Stone, Edward Durell Stone's personal involvement in these 1970's projects was minimal. 1970 - Rose Hall Plantation Condominiums, Montego Bay, Jamaica. Landscape architect: Edward Durell Stone, Jr. Unbuilt. 1972 - Eastview Apartments, Malone NY. 1972 - Beaver Road Housing, Chili NY. 1973 - The Blue Shingles Condominiums, aka Windsor Towers, Richmond VA. Unsure if built. Owner was Carlton Industries. 1973 - The Waterside Condominiums, Singer Island FL. Associates: Edward Durell Stone and Associates; Robson & Sam Giwanni. 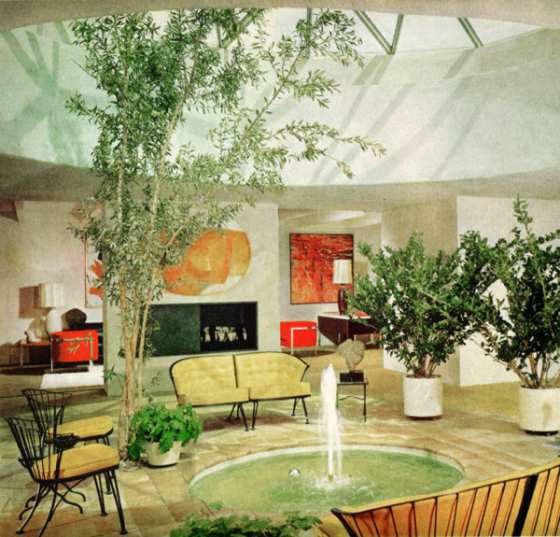 Edward Durell Stone Jr. was the landscape architect. Unsure if built. 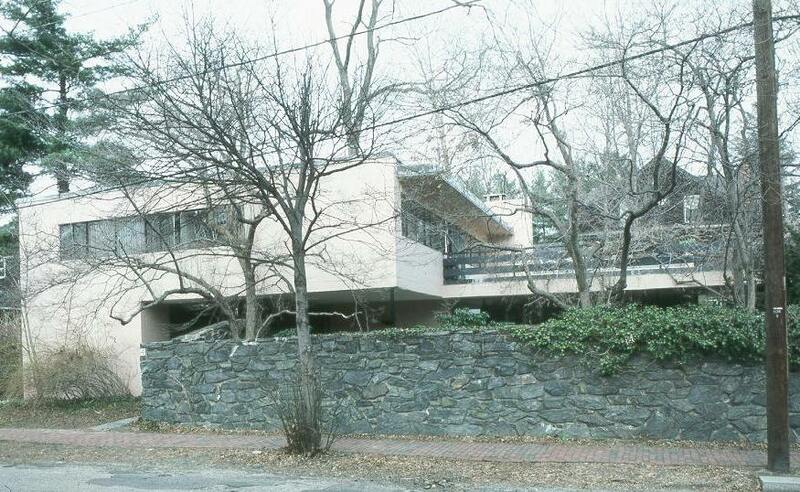 1976 - The Sheldon Cohen House, South Side of John Street, Greenwich CT.
Year unknown - The Menninger Foundation Residence, Topeka KS. Unsure if built. Year unknown - The Ira M. Shey Residence Addition, Ivy VA. Addition to dressing room. Sources include: University of Arkansas Special Collections, Edward Durell Stone: A Son's Untold Story of a Legendary Architect, by Hicks Stone, Arkansas Preservation, Doug Newby, Paul T. Frankl and Modern American DesignBy Christopher Long; Evolution of an Architect by Edward Durell Stone (1962); Edward Durell Stone: Modernism's Populist Architect, by Mary Anne Hunting.